When it comes to PC Cooling and Chassis, Cooler Master needs no introduction. 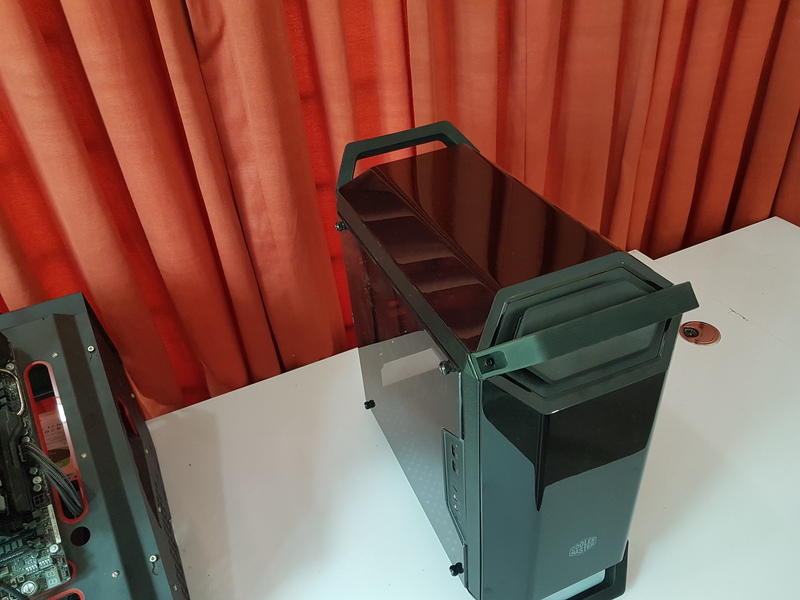 Ever since its foundation in 1992, the company rolled out their first CPU Cooler in 1993 with major breakthrough coming in 1999 when their first all-aluminum based handmade chassis was launched. 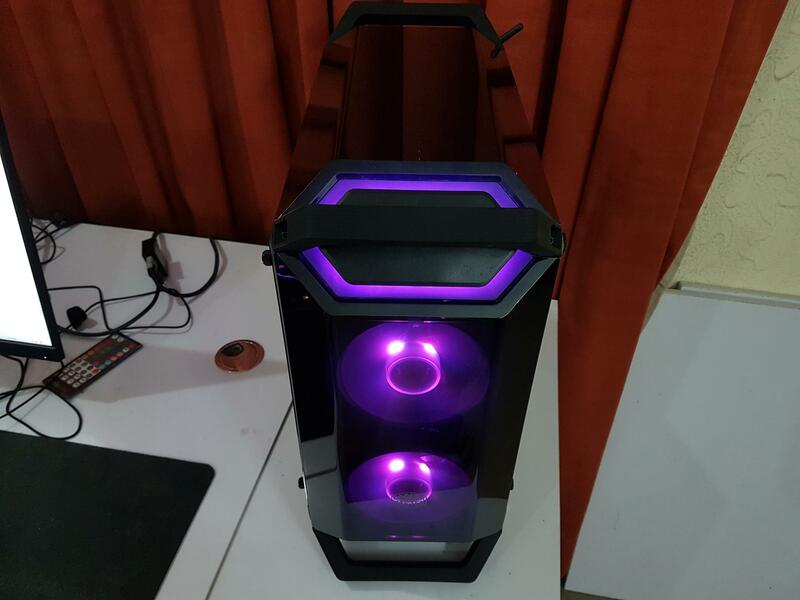 There was no stopping to the continuous innovation that took the company to the new frontiers of introducing liquid cooling solutions, power supply units, gaming peripherals etc. 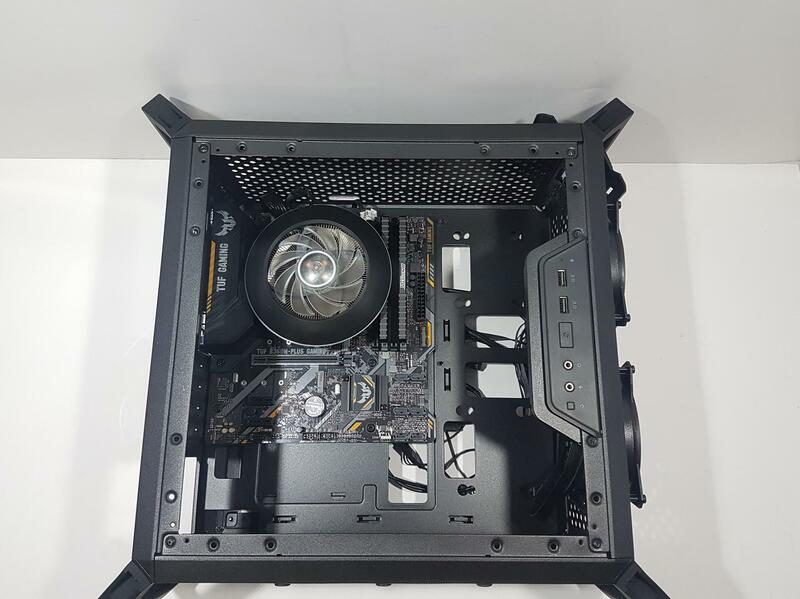 Cooler Master is making strong come back in recent times with their cooling solutions and chassis. 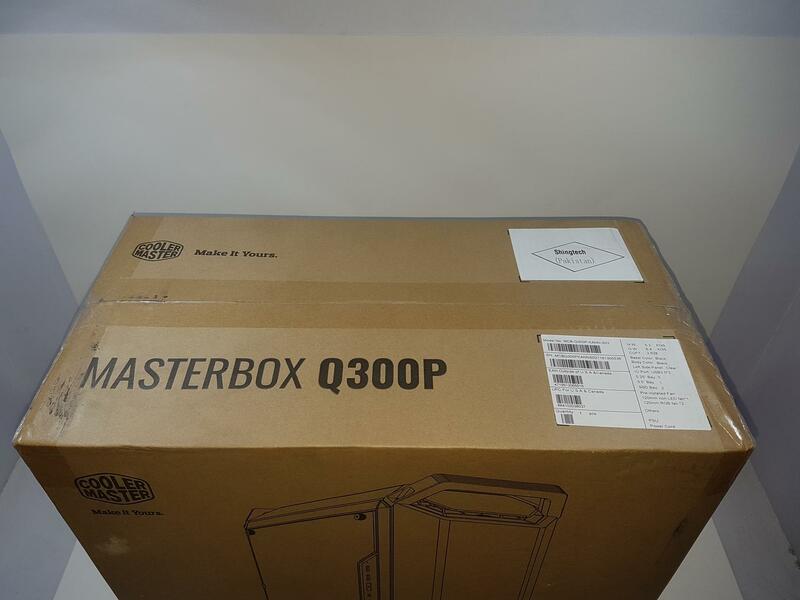 Cooler Master has sent us their Masterbox Q300P chassis for the review. 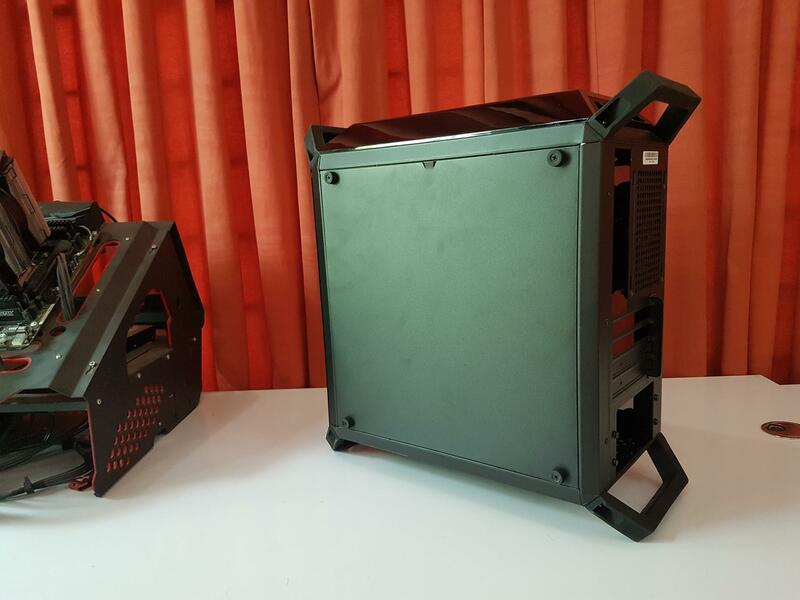 This is a microATX/mini-ITX chassis from Mini-Tower series under Q category. This particular model focuses on the mobility, RGB lighting and modular I/O Panel positioning. 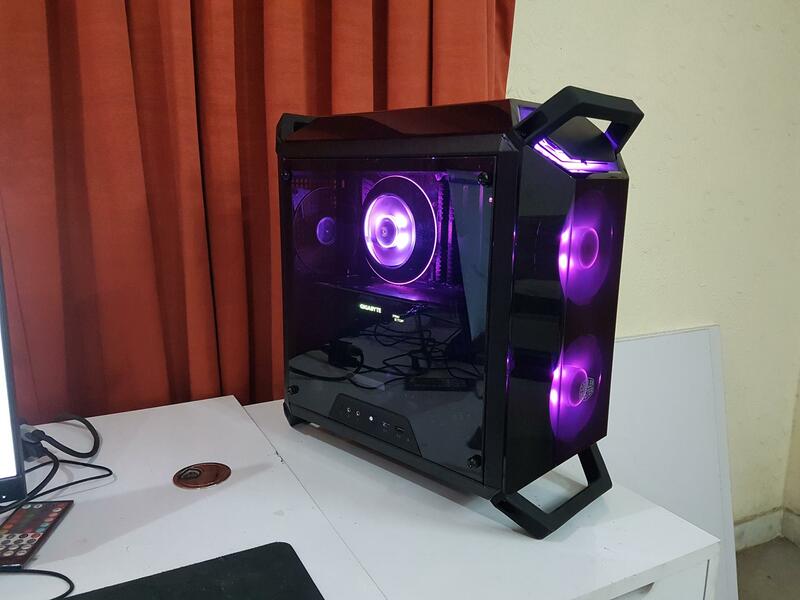 This is one heck of a gorgeous chassis that speaks for itself and is further augmented by the RGB Lighting for which Cooler Master has provided a controller in the box. 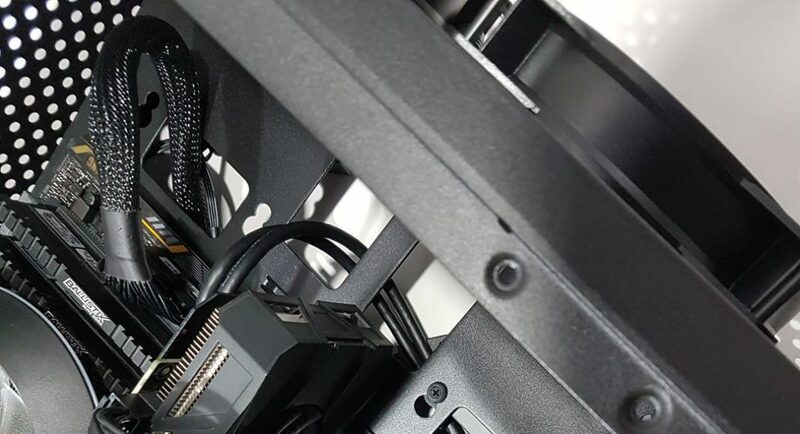 Another striking feature of the mATX chassis is the support for the ATX PSUs. 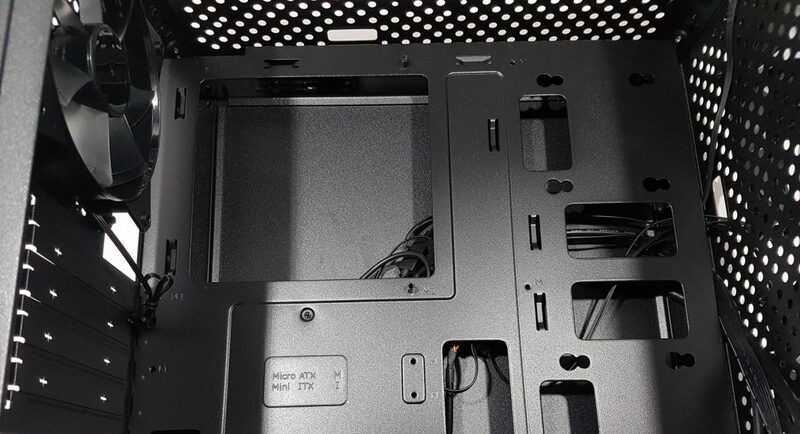 This chassis features three transparent Dark Mirror panels. One is on the top, other is on the front and the last one on the side of the chassis. 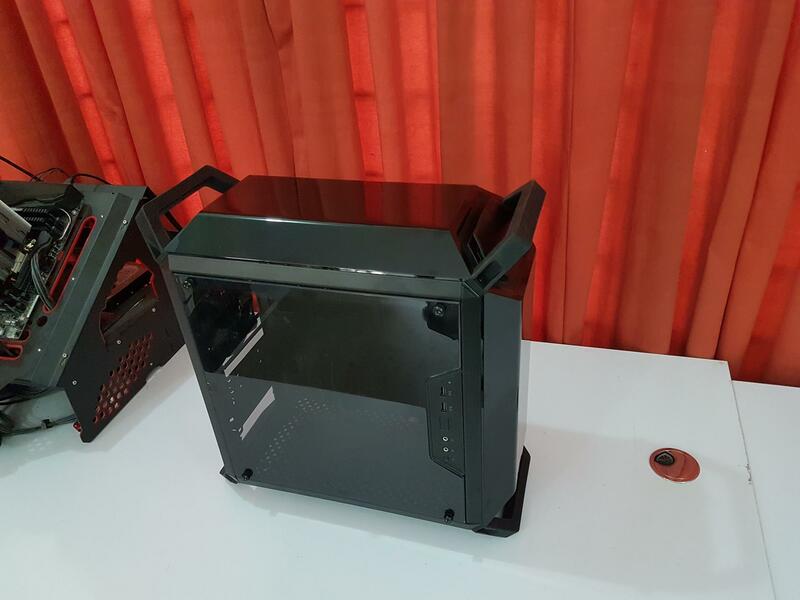 Thanks to the similar positioning methods the top and front panels are interchangeable similarly to the left and right side panels are interchangeable. Mind you that only left panel is transparent. 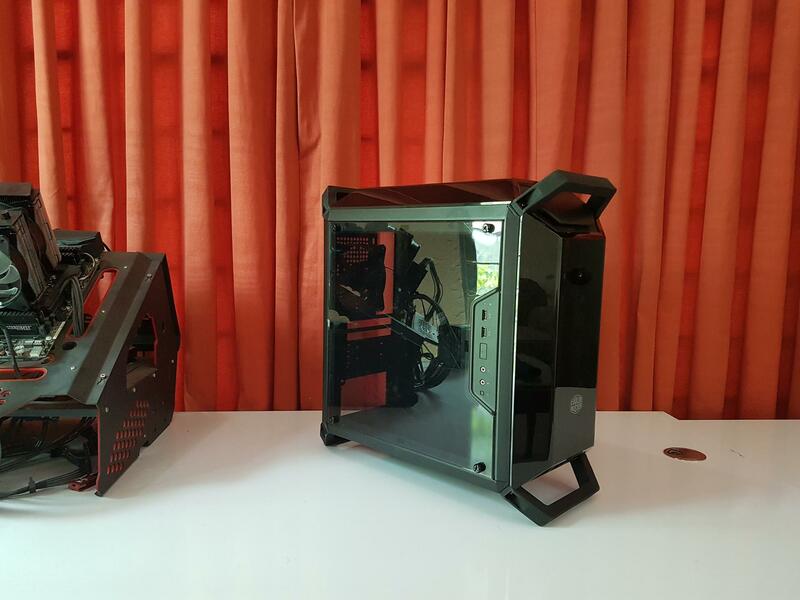 If you choose to swap both panels then you won’t be able to show your build inside this chassis. There are 4 rubberized handles installed on the top and at the bottom of the chassis. 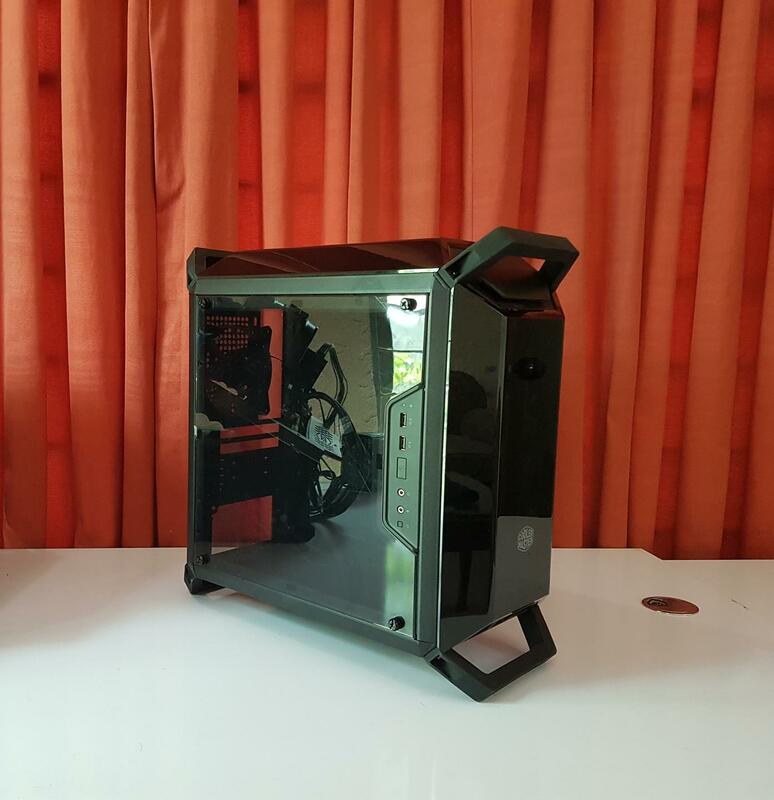 The use of 4 handles adds much to the overall symmetry yet enables the user to easily carry the PC along say if going for a LAN Gaming event. 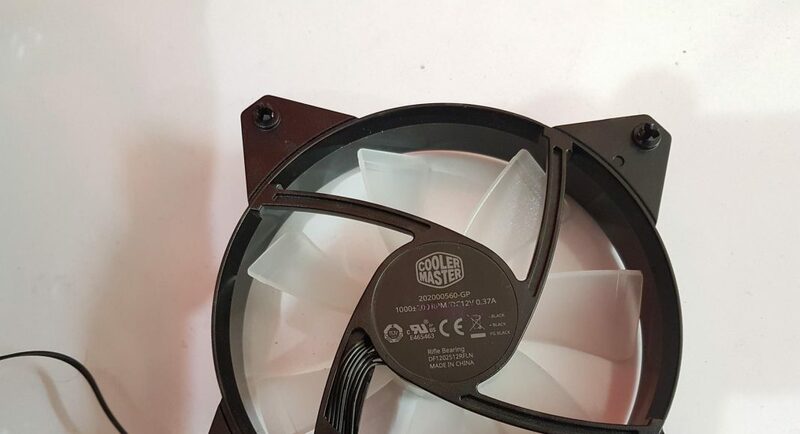 Cooler Master has included two RGB 120mm fans on the front. These are using +12VGRB pint format and can be connected to the enabled lighting header on the motherboard. The rear fan is non-LED. In terms of the storage, this chassis has provision for two 2.5” drives and one 3.5” drive. There is no 5.25” drive bay. 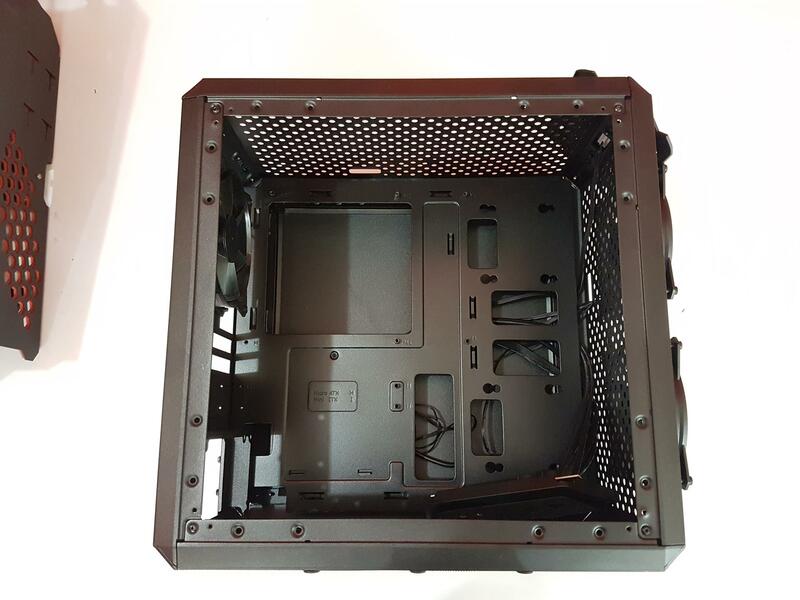 Cooler Master has mentioned that chassis can be used in horizontal or vertical layout though in my opinion using this chassis for horizontal position makes no sense as it is the domain of the mini-ITX or compact mATX chassis. 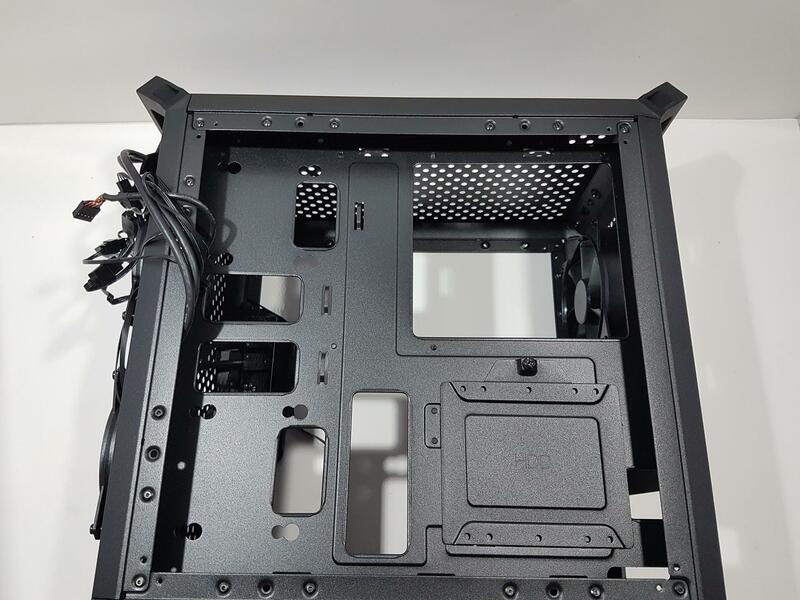 Cooler Master was definitely thinking ahead as this chassis has 28mm of cable management area on the backside which is plentiful and the way I/O Panel can be mounted on any side of the frame the internal layout to compensate the cables routing accordingly has my praise. 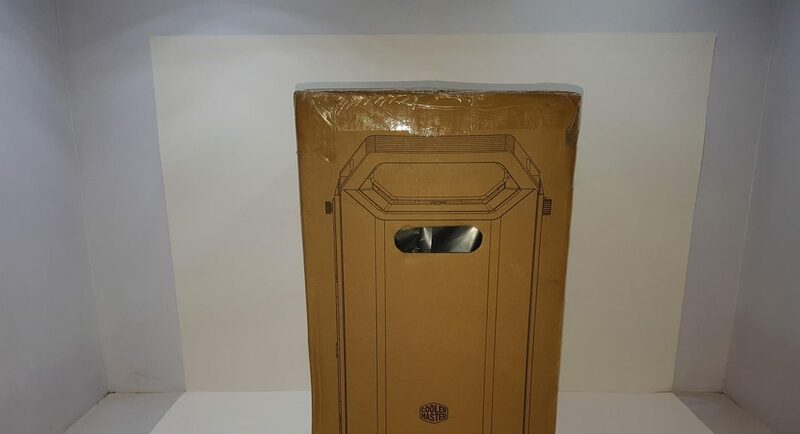 The chassis is shipped inside a standard brown color cardboard box. 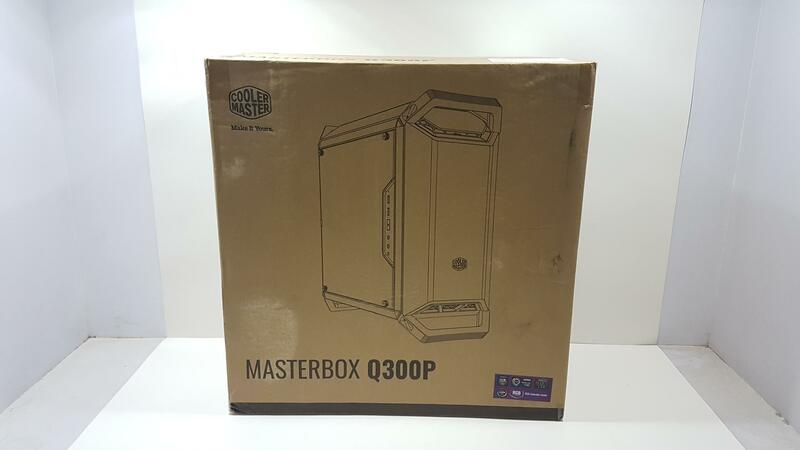 The left side of the box has Cooler Master brand name and tagline printed on the top left. There is a picture of the chassis on the main section. Model of the chassis is printed at the bottom left side. 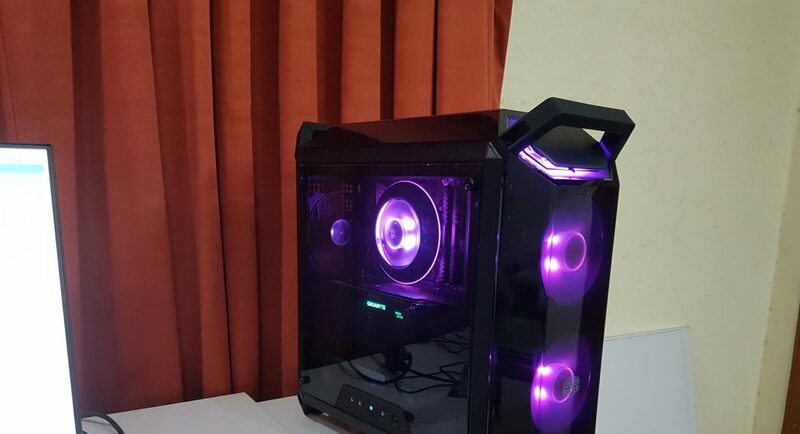 There is a sticker pasted on the bottom right side with a purple background and it shows the RGB Lighting and compatibility with the various motherboard manufacturers’ lighting solution on their motherboards. 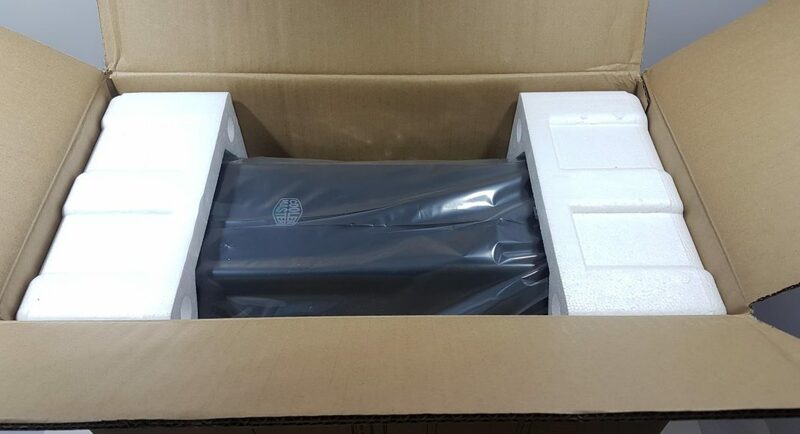 The right side of the packing box has salient features of the chassis printed in 8 different languages. There is a picture of the chassis on the right side. 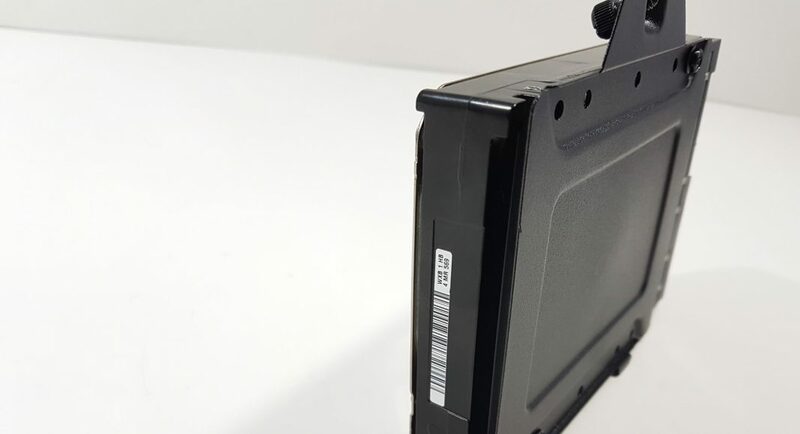 One side of the box has a picture of the chassis showing its marvelous front panel design while the other side has specifications printed in a tabular format. 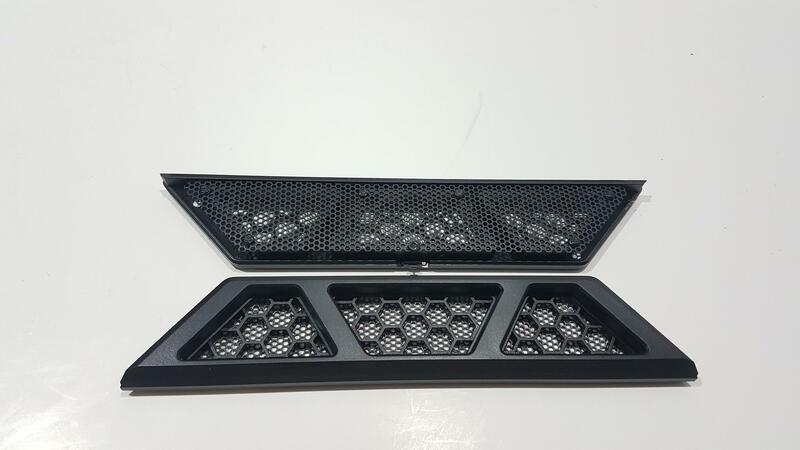 These both sides have cutouts on the upper section which makes it easy to carry the box around. 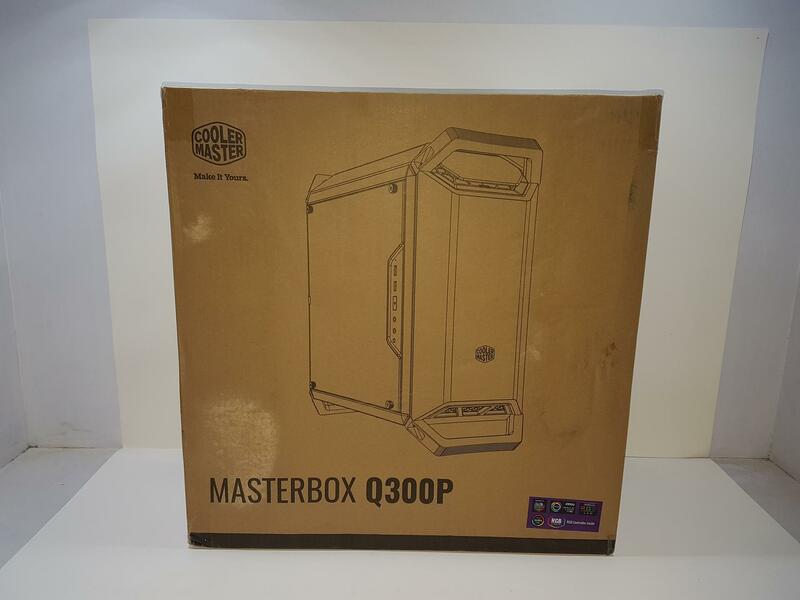 The top side of the box has Cooler Master brand logo printed on the top left side. 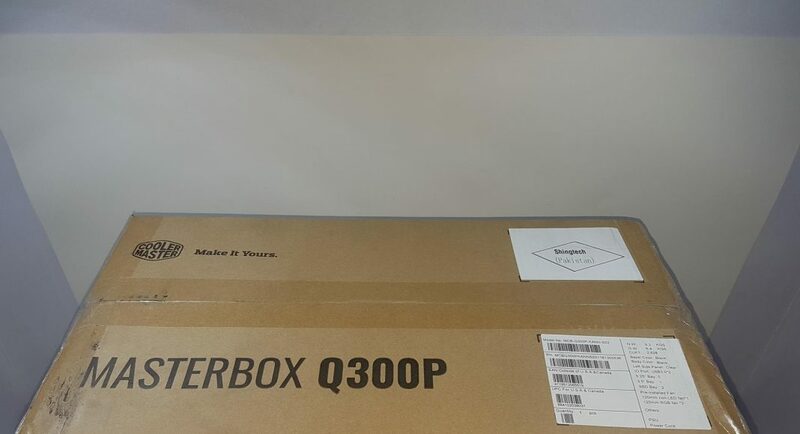 MasterBox Q300P is printed on the bottom. There is a sticker pasted on the bottom right side showing the Serial No, Part No, EAN, and UPC info labels. Opening the box would show the front side of the chassis. It is wrapped inside a transparent sheet and tucked inside thick white color Styrofoam pads. Ever since the Q300P was released, we were thrilled to test one out mainly because of the brilliant design and looks on this chassis. 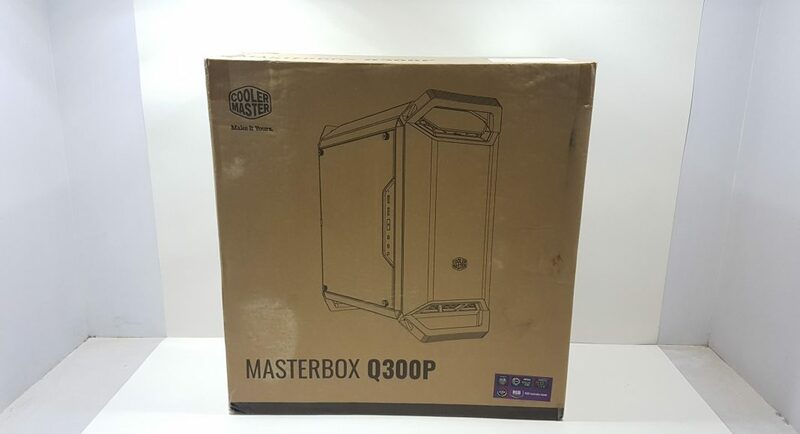 This is a mini-tower chassis from Q series under Masterbox from Cooler Master. 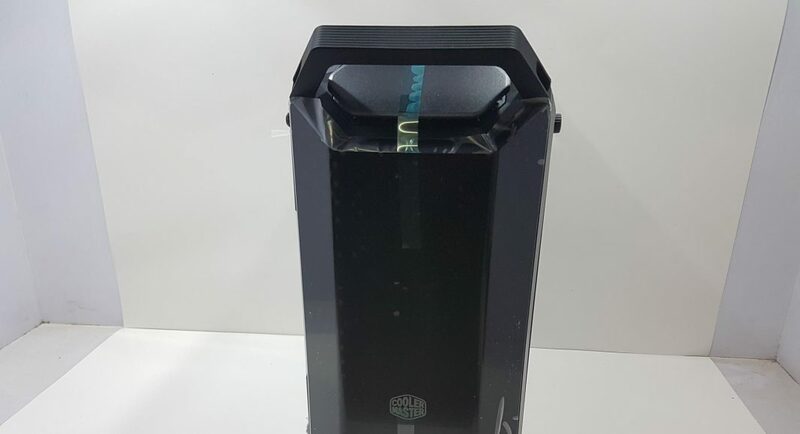 Since it is a mini tower, it is intended for microATX and mini-ITX motherboards only. But it is not a compact mini tower hence you would expect it to offer a lot as another mid-tower chassis could. 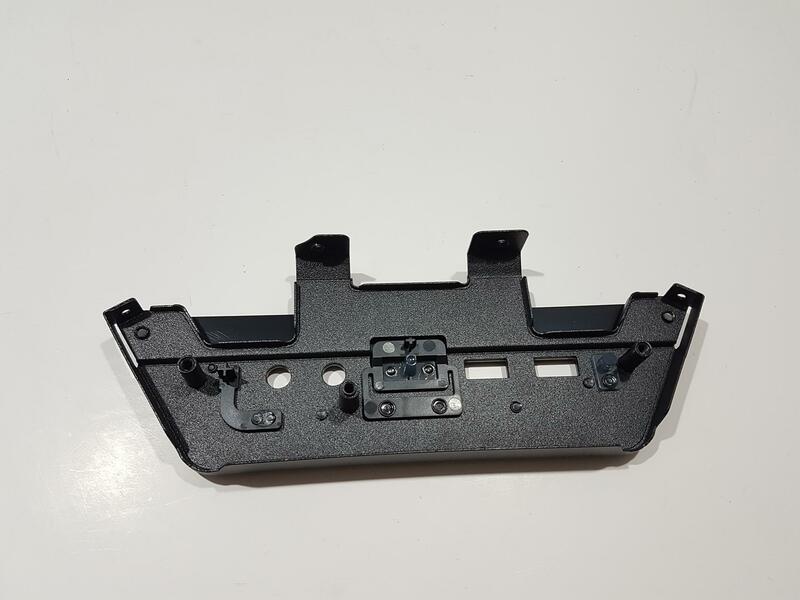 The chassis is made of Steel and plastic. It is available in a single color which is black. 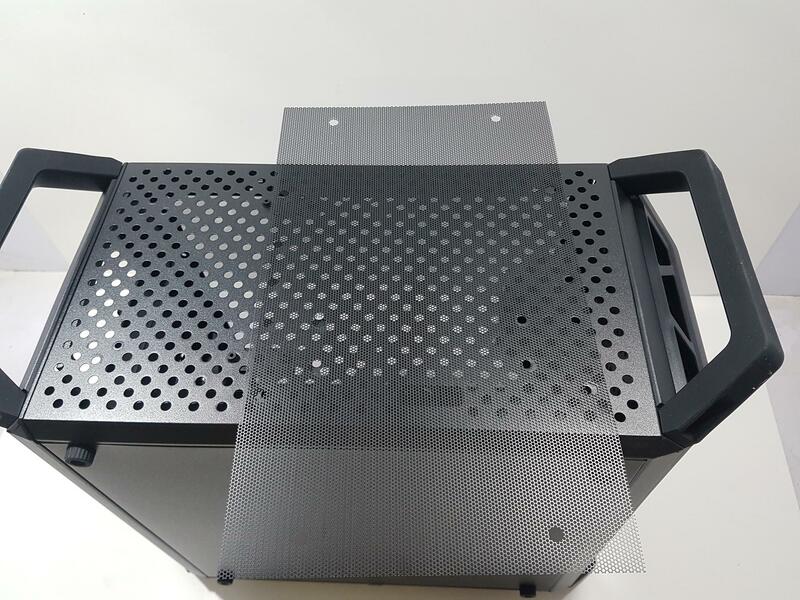 The dimension of the chassis is 450x230x450mm (LxWxH). This chassis has 4 handles making it to be a portable design for easy carrying. 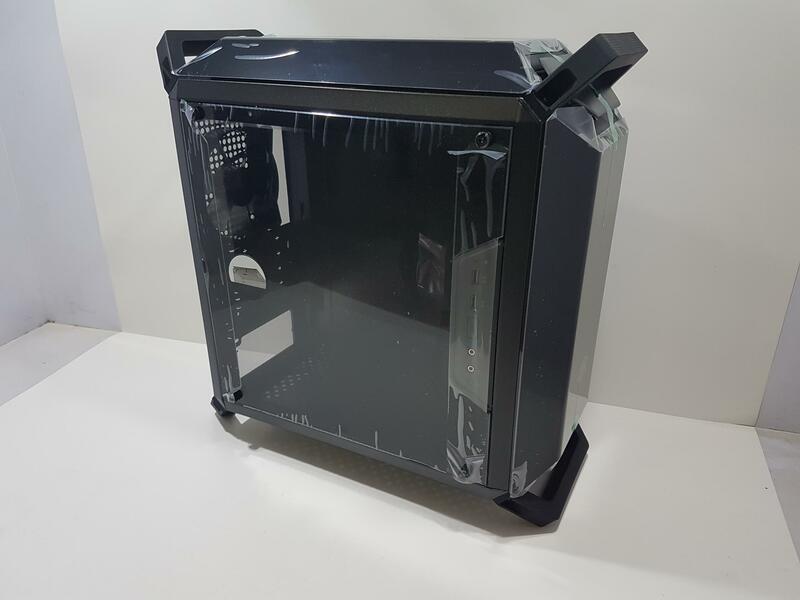 It has a transparent side panel and top/front panels which are tinted and highly reflective. 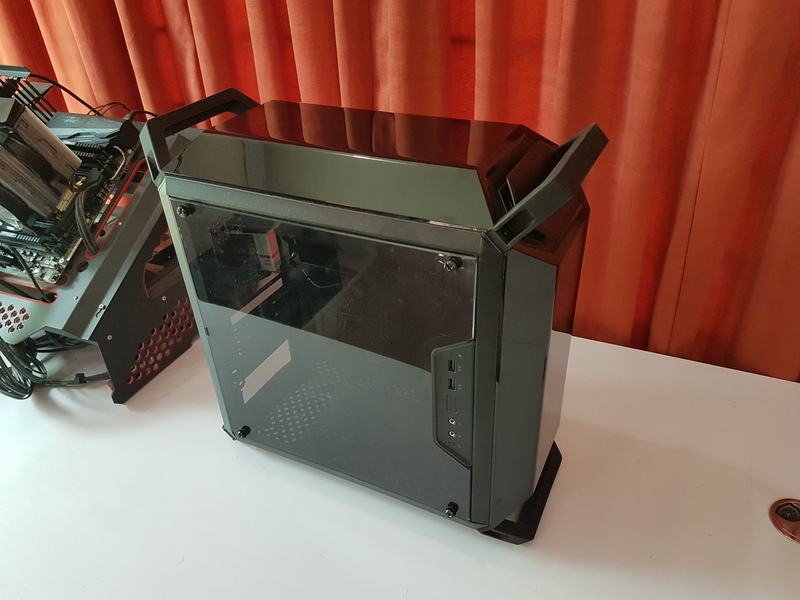 The chassis has an edge-to-edge acrylic side panel. 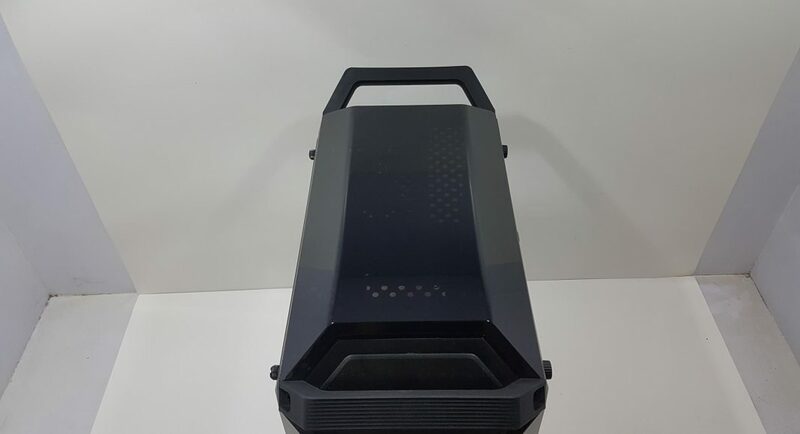 The chassis has RGB lighting out of the box as it has two RGB 120mm fans on the front and RGB lighting strip on the top at the cross-section of the top and front panel to create one heck of stunning and bold looks to the overall design element of the chassis. 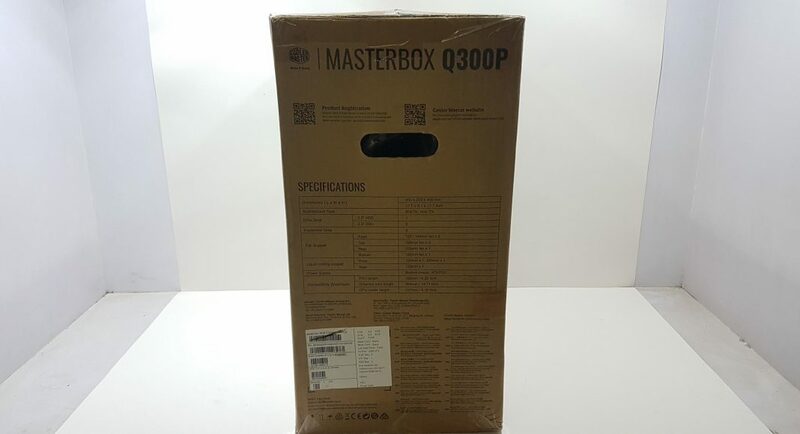 Here is what the Cooler Master is saying about Masterbox Q300P, “The MasterBox Q300P is your portable option in the lineup of the brand new MasterBox Q-series from Cooler Master. A series that might be small in size but excels in functionality and modularity without compromising on the thermal performance. Four removable handles and the DarkMirror front and top panels make the chassis easy to transport and stands out from the rest. 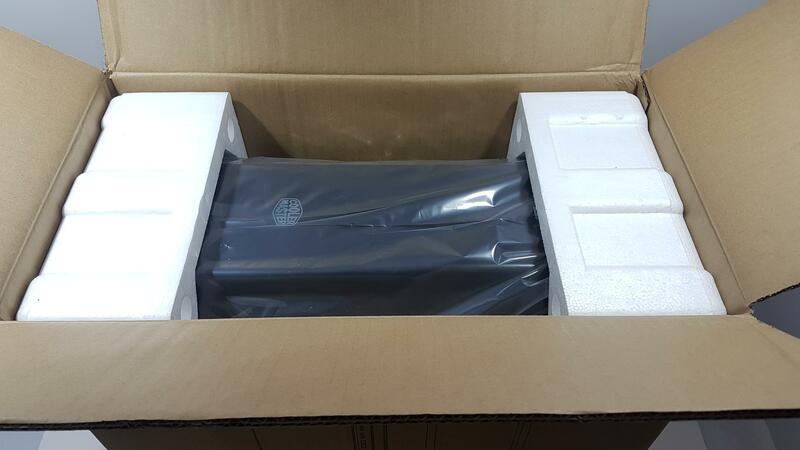 Although the size wouldn’t tell, the MasterBox Q300P supports a standard ATX PSU which we don’t see often in the market with this size. Due to the cube design of the frame, you can turn and rotate this chassis in multiple positions. The I/O panel can be adjusted to six different locations, three options at each side of the case. 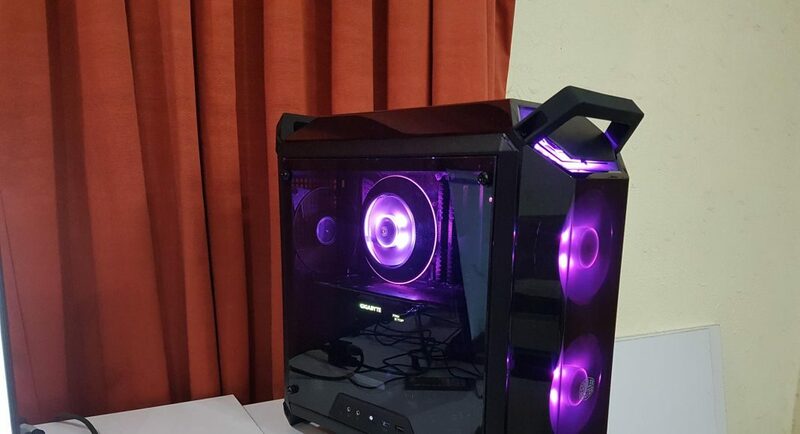 Two RGB fans are pre-installed in the front of the case. You can decide which setup and color theme fits you best. 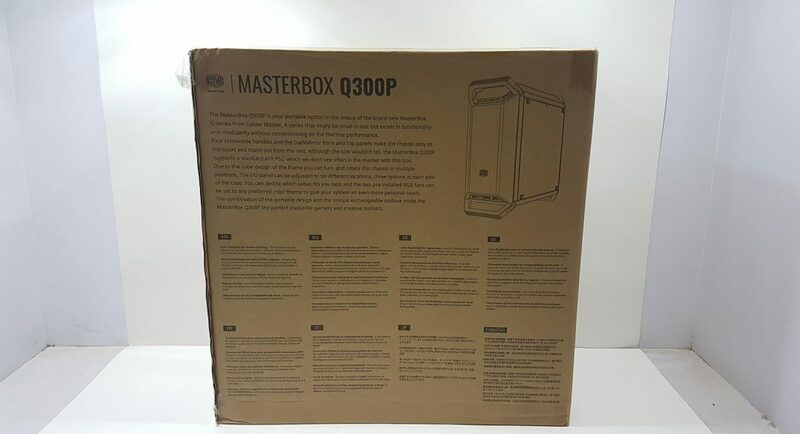 The combination of the portable design and the unique exchangeable outlook makes the MasterBox Q300P the perfect choice for gamers and creative builders.” Let’s dig deep in the chassis and see what it has to offer to the builder and the user alike. Let’s start with the front panel and front side of the chassis. 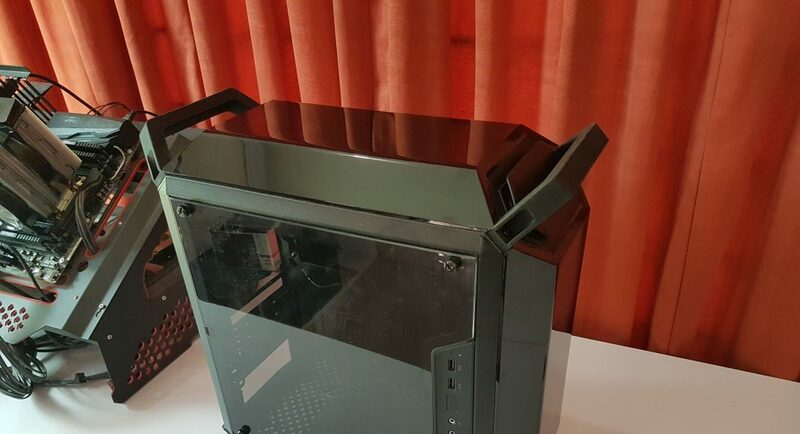 There is a plastic transparent panel installed on the front side. 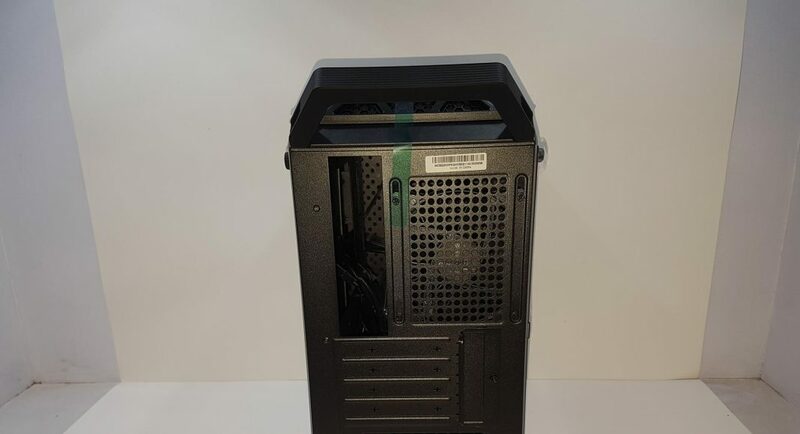 It has a Cooler Master brand logo in white color pasted on the bottom. This panel is a dark mirror. It is reflective and tinted. It has raised middle section as compared to the rested sides which definitely makes it look that good in person. The panel has curved upper and bottom sides to create symmetry with the overall design which is impeccable. 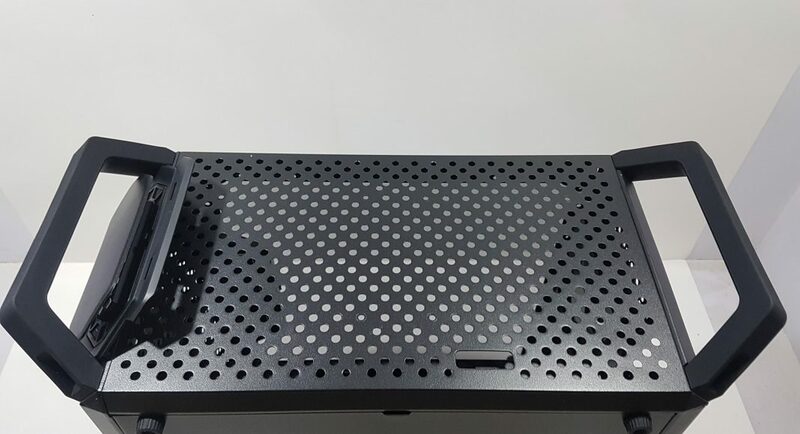 On the top side, it makes contact with the base of the RGB PCB that sits on the cross-section of the top and front panels. On its bottom, there is a dust filter in a Trapezoid shape. The panel is not attached using any screw but tabs. In order to pull this panel, the user would first need to remove this dust filter cover. This is the only air intake from the front side. 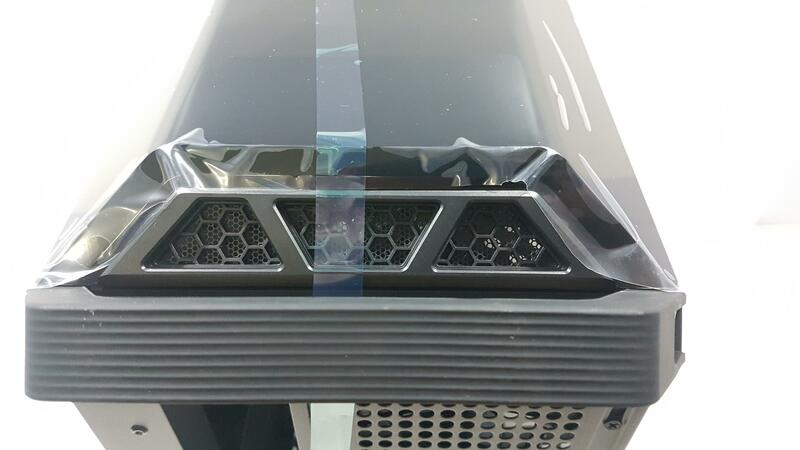 The filter itself is thick mesh with honeycomb design on the plastic cover that would restrict the airflow. 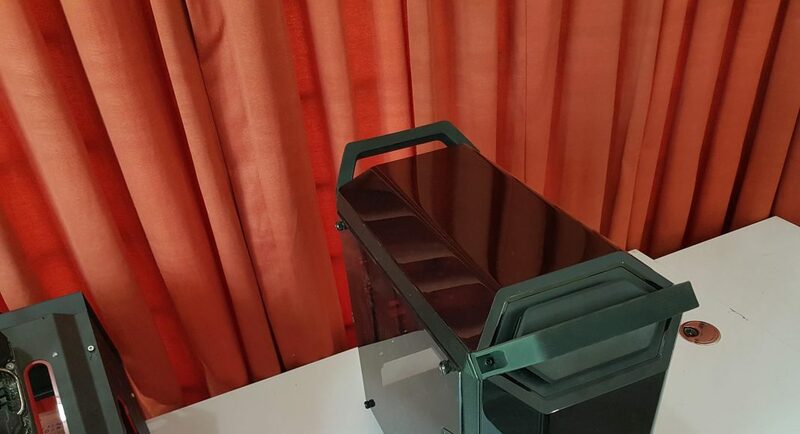 In order to take out the dust filter, the user is required to hold the middle layers of the plastic frame and pressed those inwards to pull the cover. This is not a convenient implementation. Once the dust filter cover is out, hold the panel at the bottom and pull it out. Don’t exert too much pressure. 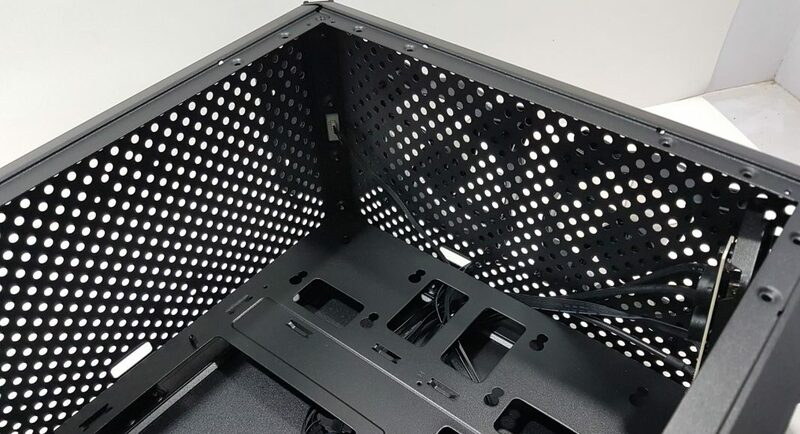 Once the panel is out we could see two 120mm RGB LED fans pre-installed on the chassis frame. The complete front side of the chassis frame has circular holes on it for airflow. There is no dust filter on the front side. 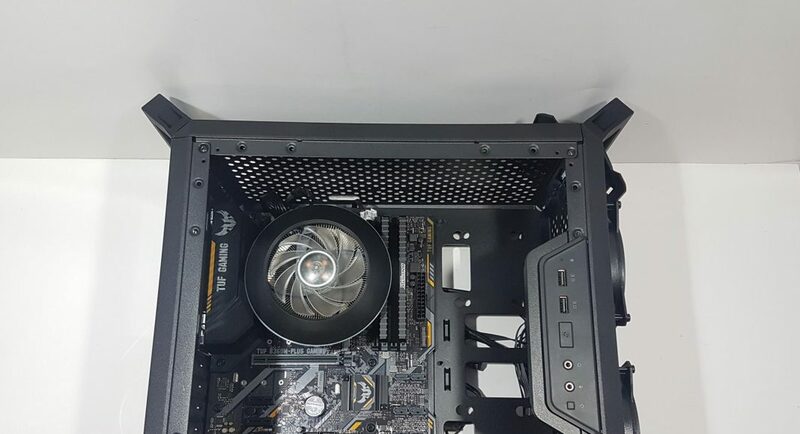 There is approximately 30mm gap between both fans. 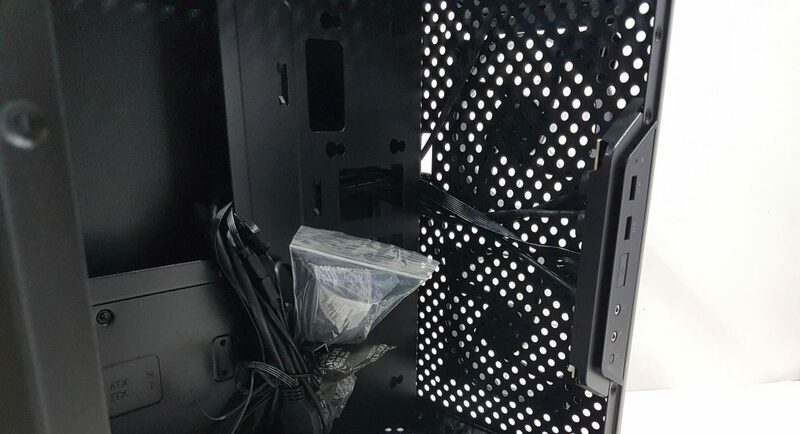 The fans are secured not with metal screws but plastic ones. There is a single cable passing channel on the upper right side through which the fans’ cables are routed. There are two cables coming out of each fan. One is the power cable and the other is a LED cable. All cables are flat. 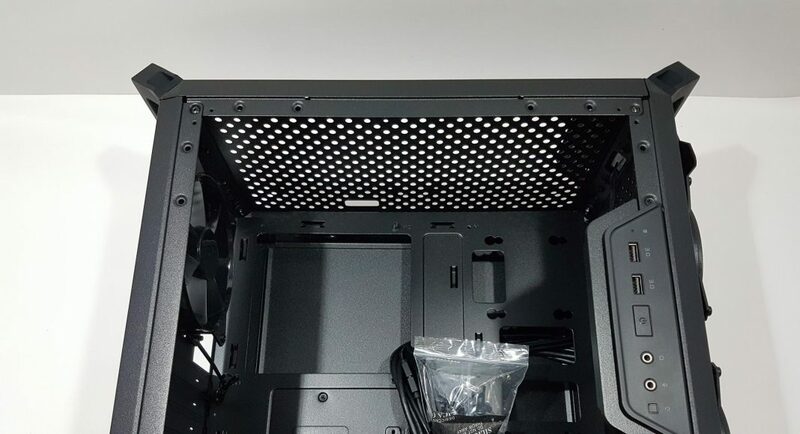 You can see a sloped design of the top RGB LED PCB cover facing in an angle towards the front panel. Each fan has 7 blades. 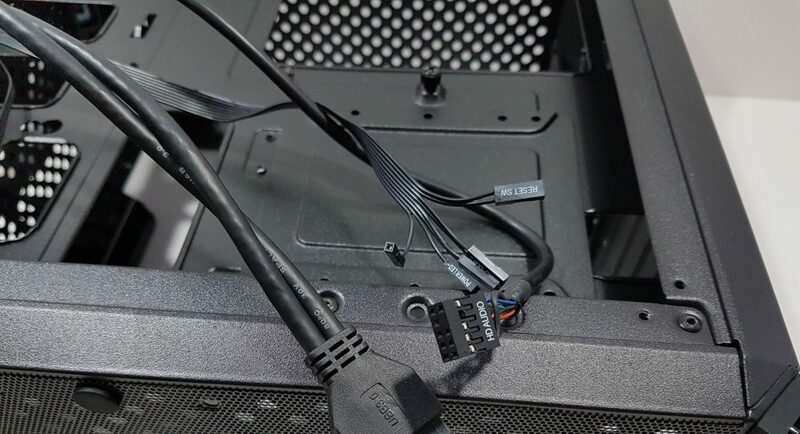 The power cables of the fans are jointed and ending at 2-pin Molex connector as well as 2-pin fan connector. 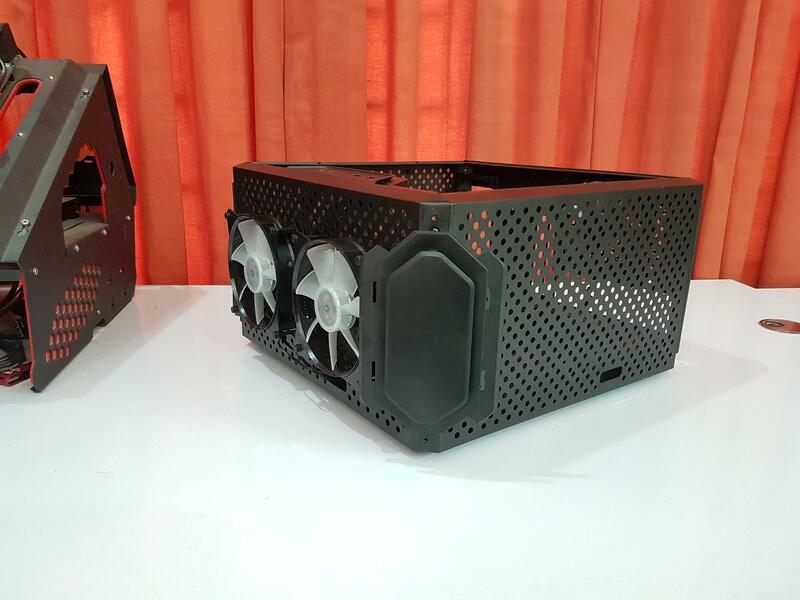 Unfortunately, these fans were observed not being able to generate enough airflow inside the chassis. 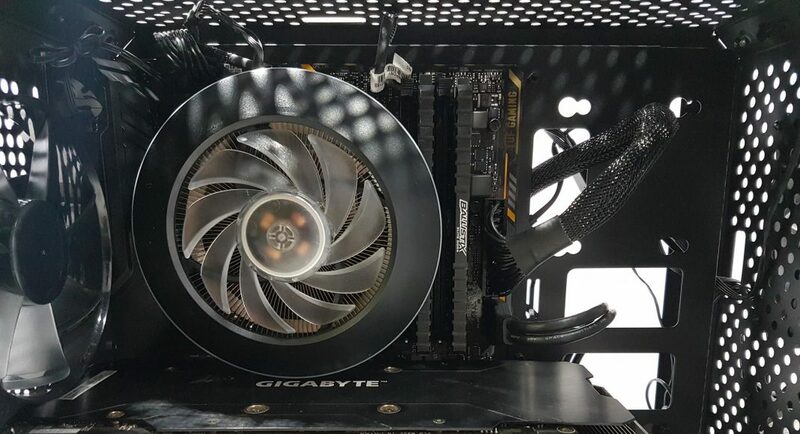 Once they were in action, placing a hand in the inside of the chassis right in front of these fans would make you realize the lack of airflow. 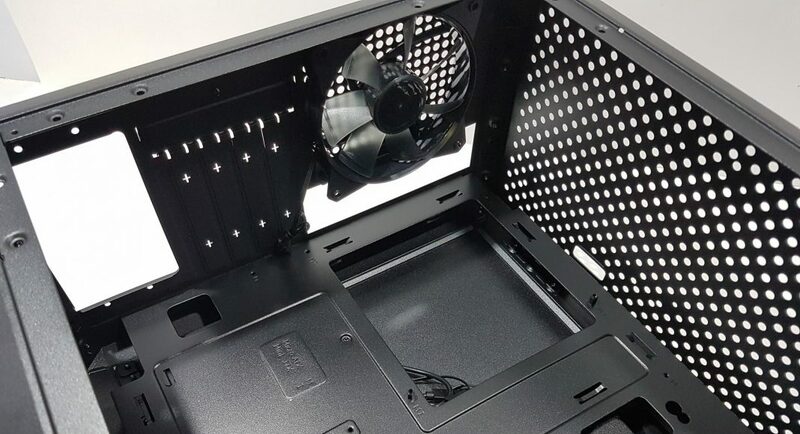 Not only this chassis has restricted airflow on the front side which is choking the fans but the stock fans themselves are not that powerful. The thermal testing section might be of some interest to our readers. 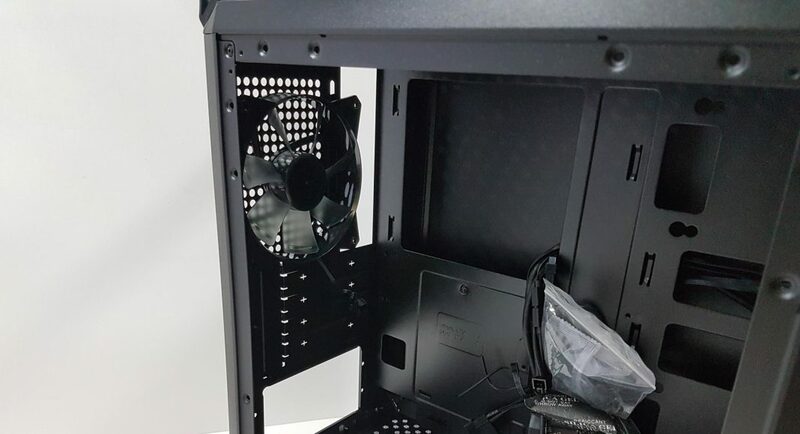 There is like 10mm or so gap between the transparent panel and these fans. 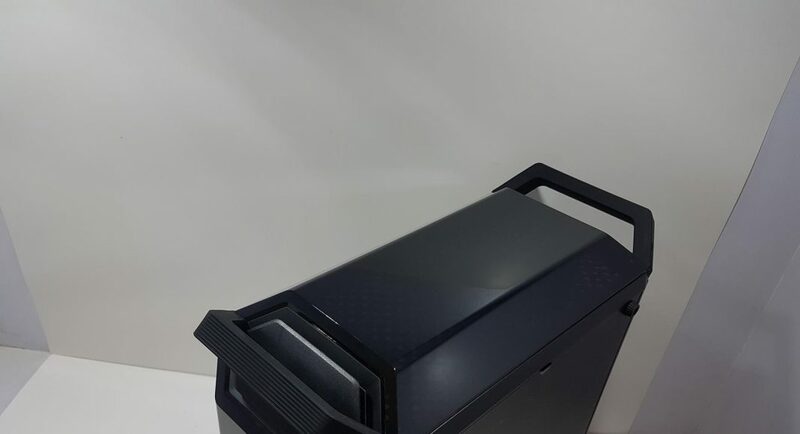 In terms of the cooling department, the user can mount up to 2 120mm/140mm fans and up to 240mm radiator on the front side. 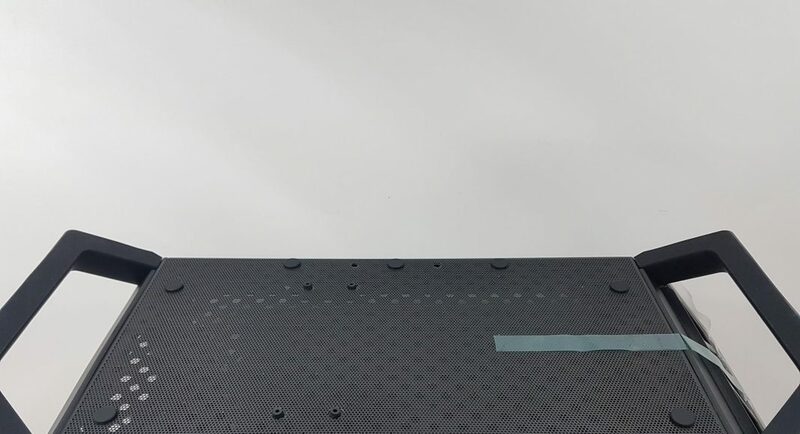 Let’s take a look at the top panel of the chassis. 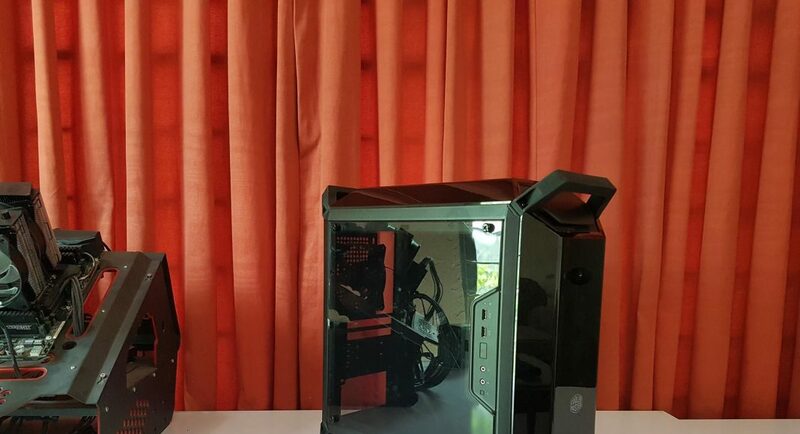 It has an identical transparent cover which is dark mirrored as is on the front panel but lacks the Cooler Master brand logo. Both covers can be used interchangeably. The top panel has all the sides covered except the rear one where there is identical dust filter cover as we saw on the front panel. The handles are facing opposite to the sides of the cover which really adds to the looks. 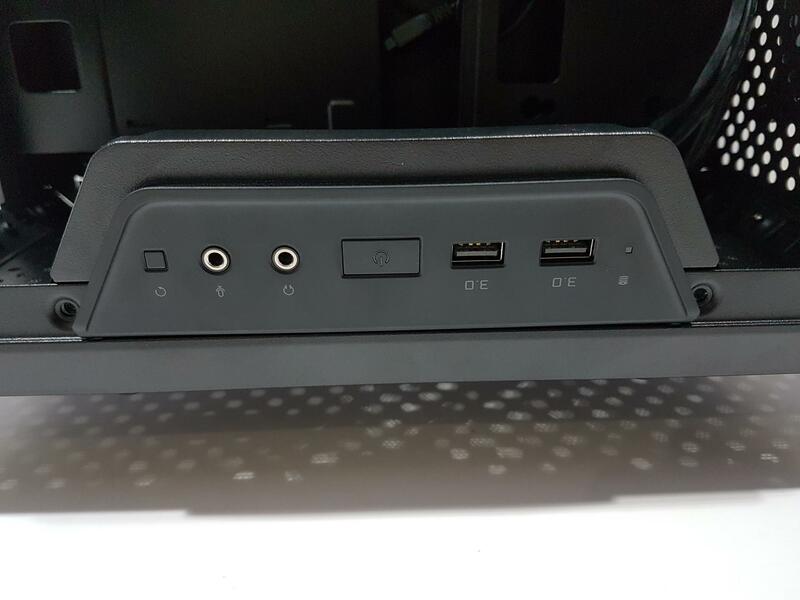 There is no IO bracket on the top or on the front sides. To remove the top cover, the procedure is the same as is for the front panel. Remove the dust filter and pull out the top cover. The layout is identical to the front side chassis frame. The complete surface is vented and there is a large size cutout for cable routing. The handles can be removed by removing the hex screws. The top side and the front side are crossed over using a curved side in between them. This side is partially covered by the front side handle. There is a hard plastic cover in convex polygon shape on the top. It is lifted above the chassis frame. This is for a reason. There is an RGB LED PCB under this cover. 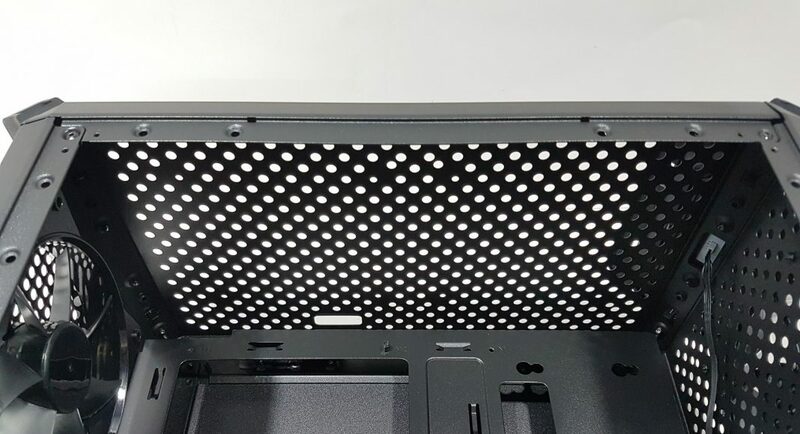 This spacing between the top cover and the PCB will ensure the proper space for illumination which does create vivid effects when powered on. There is a dust filter in between the top cover and the PCB. There are two latches on the dust filter. One is facing the top panel and the other is facing the front panel. Pressing them in will release the top cover and the dust filter and expose the PCB. 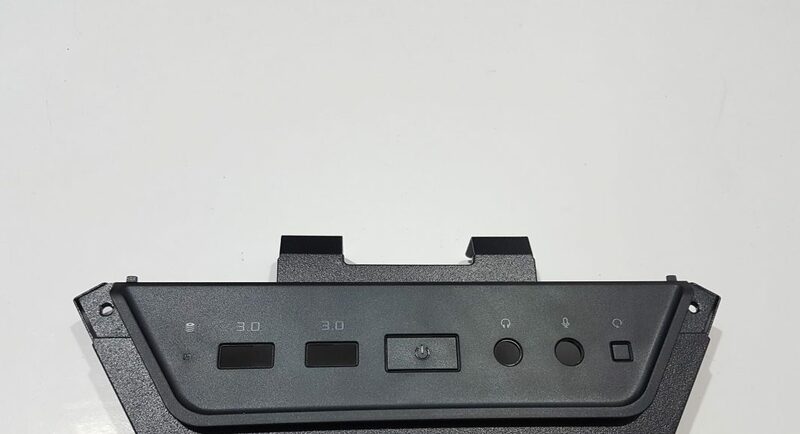 The backside of the top cover has a white color coating to ensure the even and smooth light diffusion. There is a reason for the dust filter. 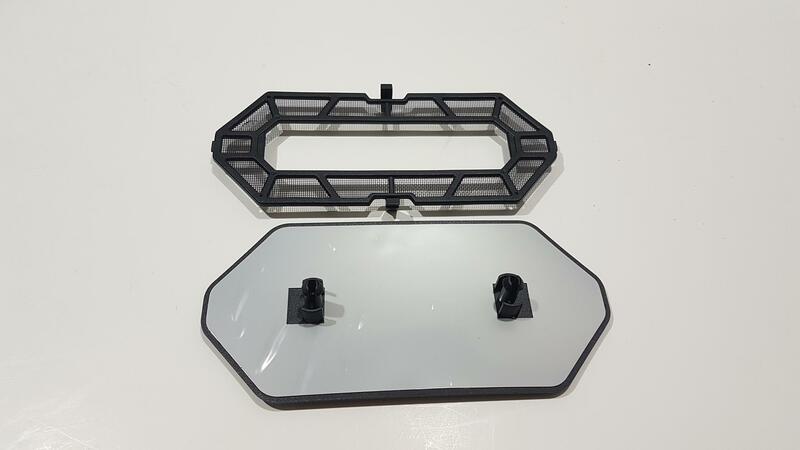 The PCB is installed on a plastic frame with ducts around its center mass. The dust filter lies above these ducts. The PCB is white and there are 10 RGB LEDs which draw 12V for power. There are two screws securing the PCB with the plastic frame. 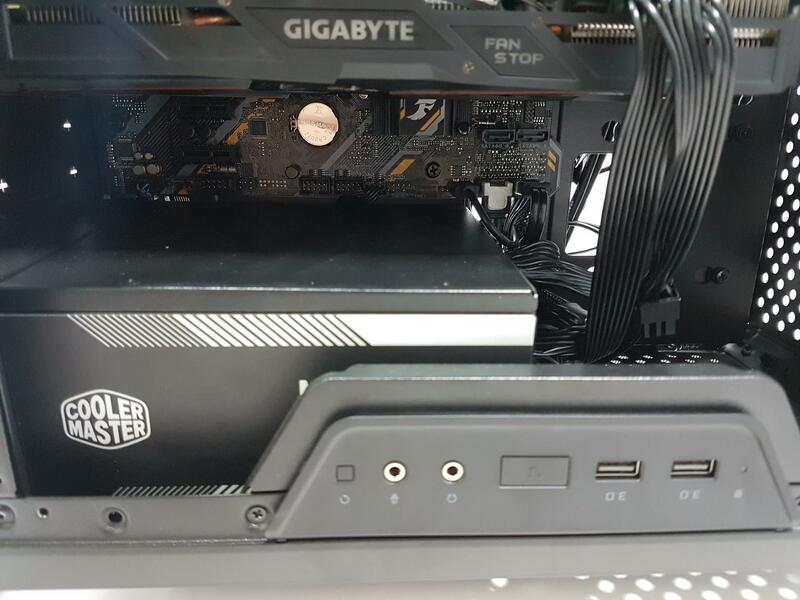 Cooler Master brand name is visible on the left side. LEDs have numbering assigned to them. 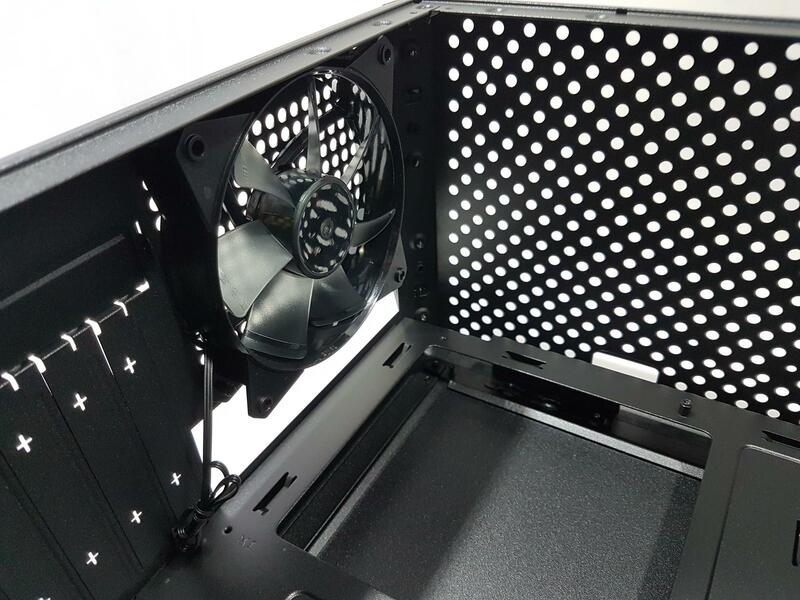 In the cooling department, the user can mount 2 120mm fans on the top. 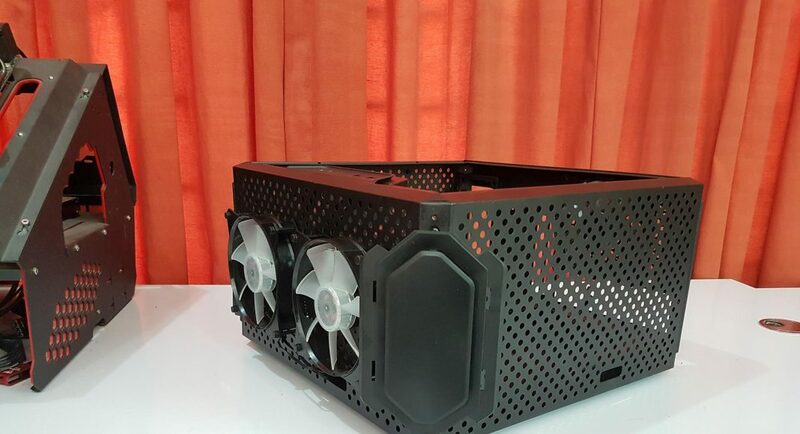 In my opinion, 240mm slim radiator is also a possibility with radiator installed inside the chassis and fans mounted on the outer side though I have not tested it. Mind you, due to restrictive airflow even on the top, I would not suggest doing a radiator up top. Even if you are to install fans on the top to exhaust hot air out of the chassis, spin them at a lower speed. Let’s take a look at the rear side of the chassis. The top left side has an opening for the I/O shield/plate of the motherboard. 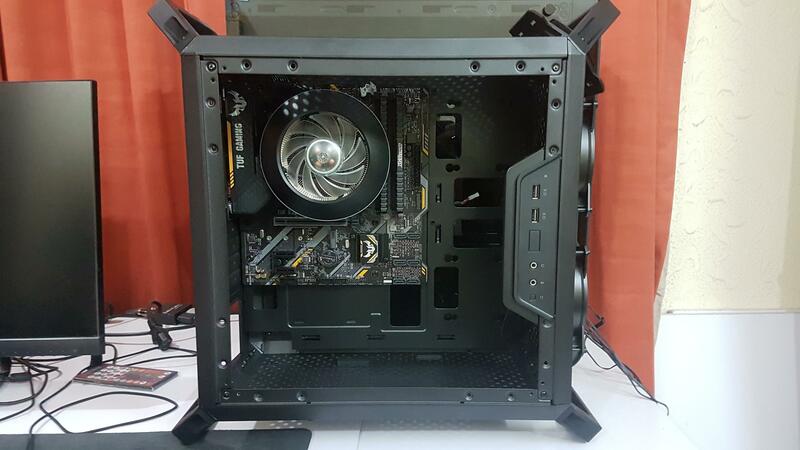 Its right side has a mounting position for a 120mm fan. 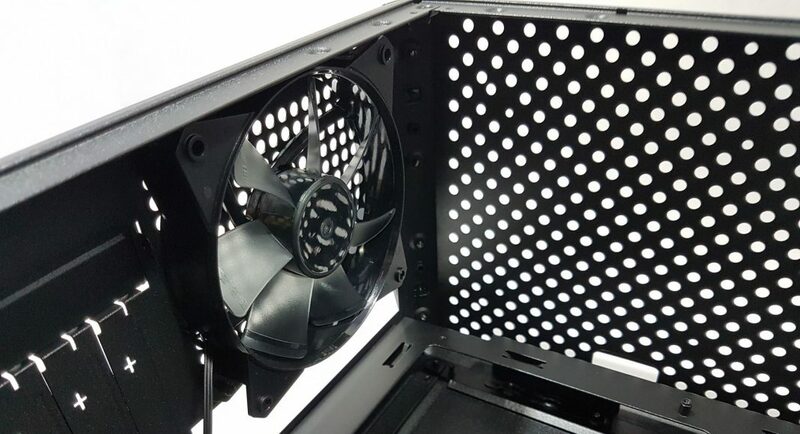 Note the large size cutouts on each mounting corner which can be used to adjust the height of the fan. 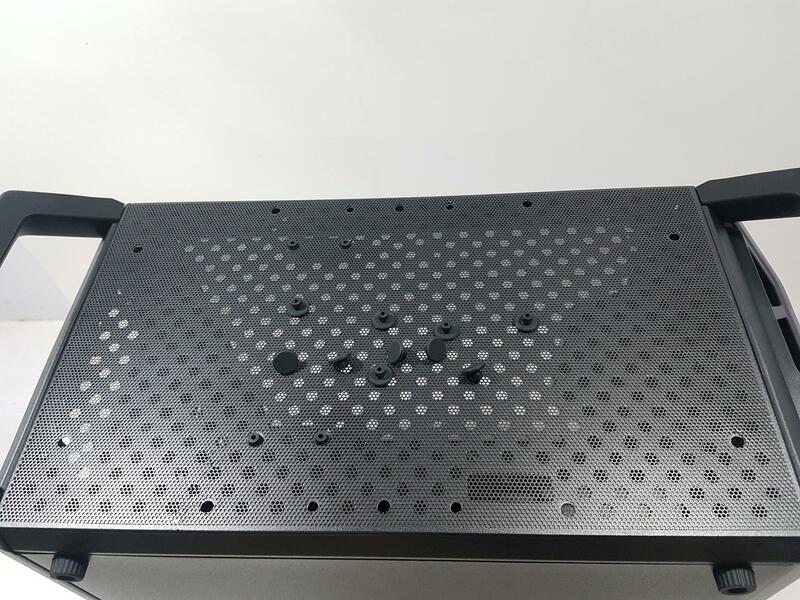 Chassis has 4 PCIe slot covers. These covers are without mesh and once removed these can’t be put back on. This is something which I personally don’t prefer. The PCIe covers are in line with the inner frame of the chassis which is not a standard implementation. There is an external bracket that is secured using a screw. 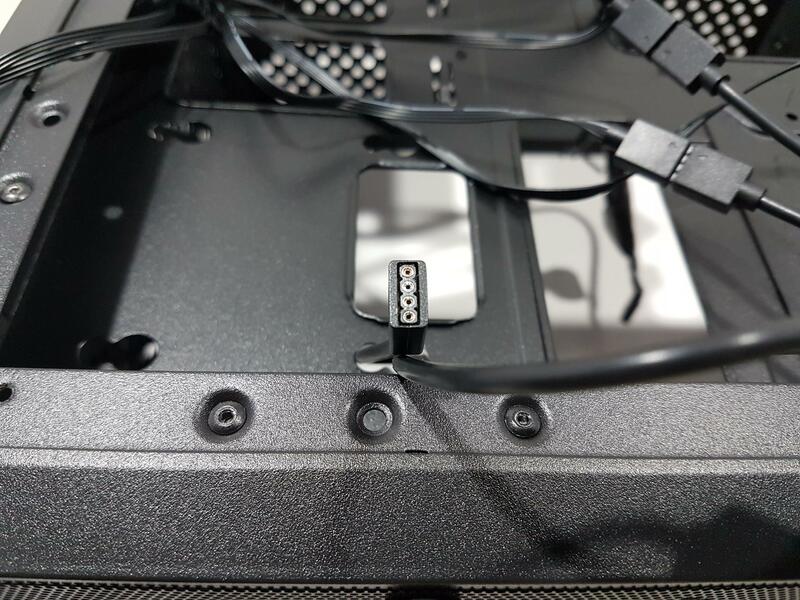 This bracket locks the PCIe slot covers. 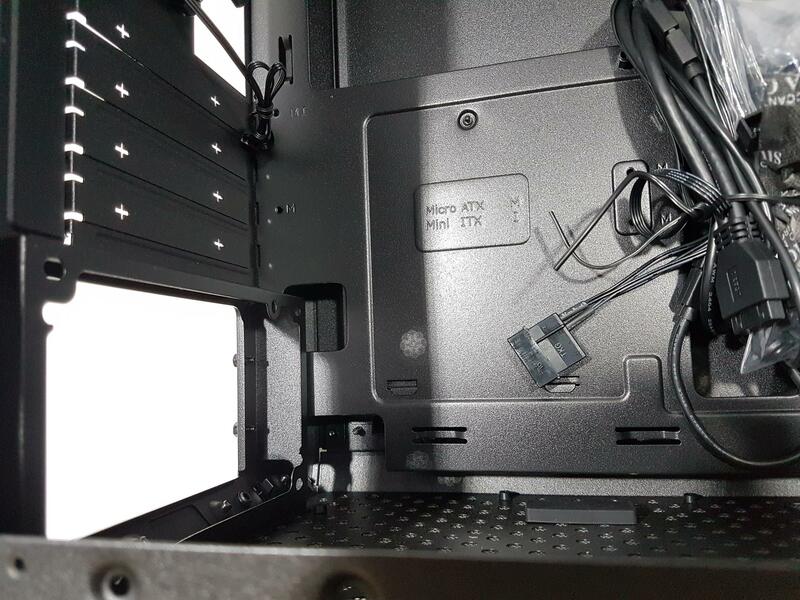 To install a graphics card, remove the screw and take out the slots holding the bracket. Nothe w remove the PCIe slot covers themselves (the required ones only). 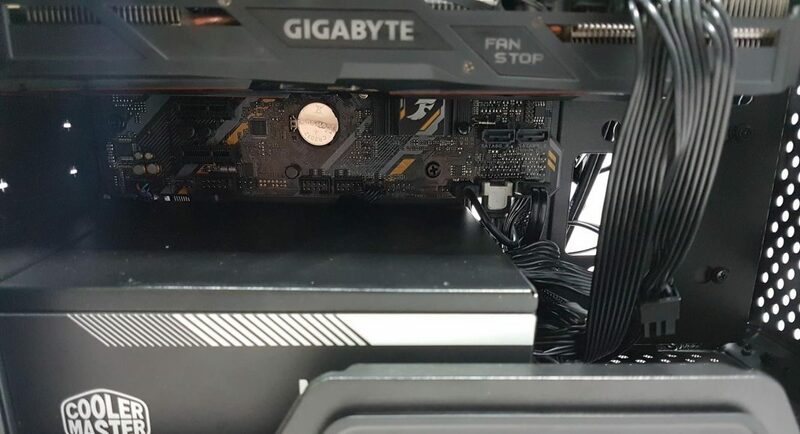 I would suggest removing the PCIe slot covers right before installing the motherboard. 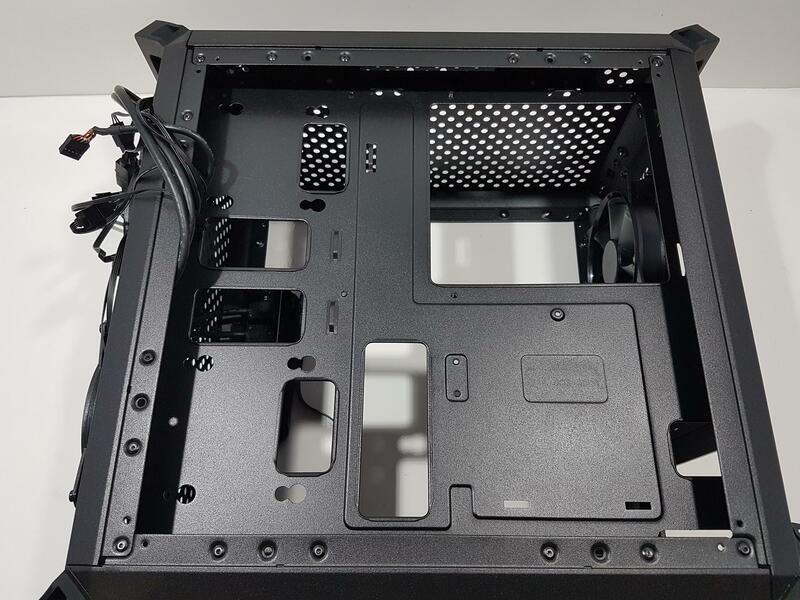 At the bottom, there is an ATX PSU mount with a different mounting mechanism. 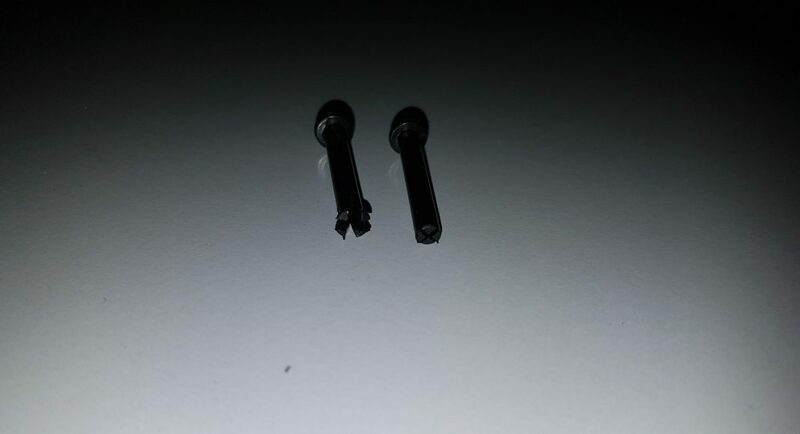 There are 4 screws visible on the bottom. 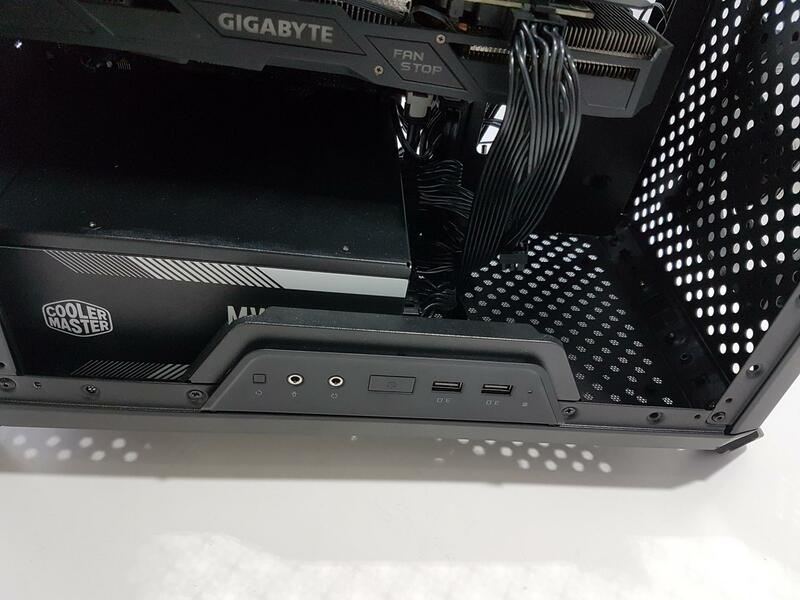 Cooler Master has provided a mounting bracket for PSU. 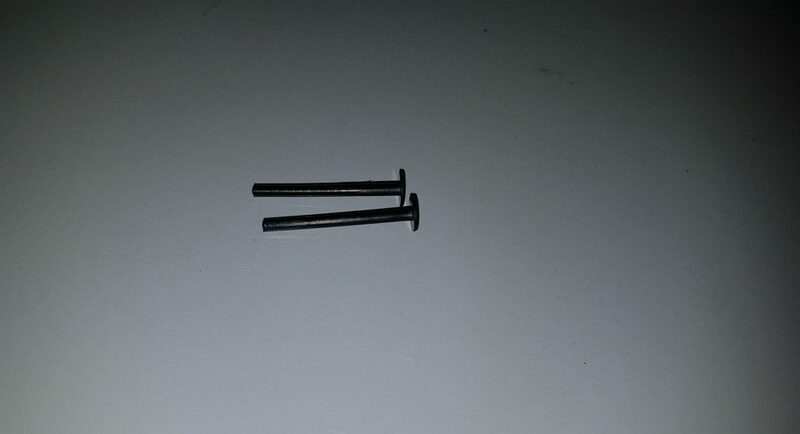 This bracket is secured with the frame using these 4 screws. This is for a good reason which I will mention shortly when discussing the internal layout of the chassis. 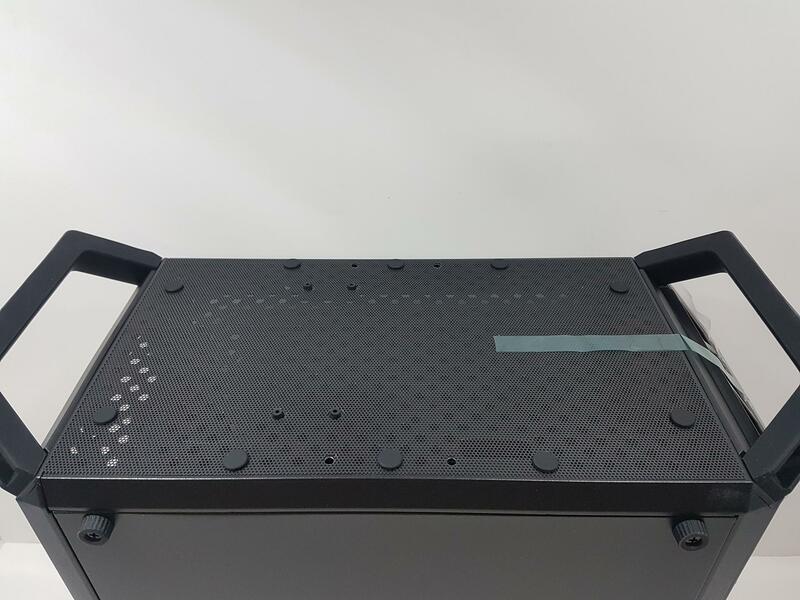 The bottom side of the chassis has 2 rubberized handles to create symmetry with the overall design. 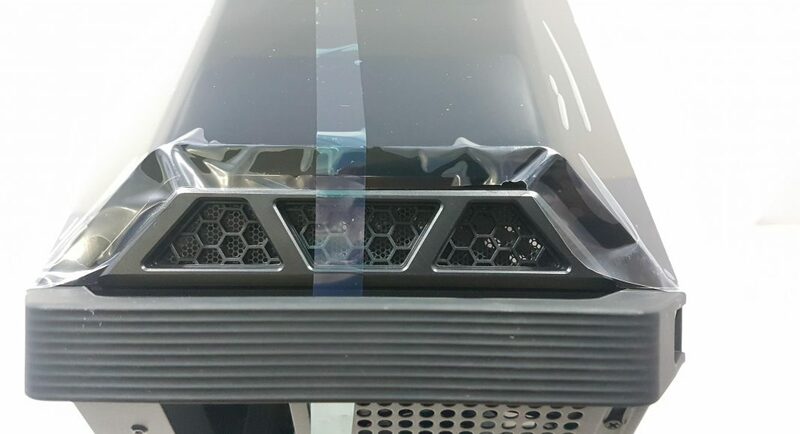 There is a dust filter placed on the exterior of the chassis. The dust filter is secured using 10 silicon inserts which can be taken out to remove the dust filter. There are 4 holes uncovered. In order to make it easier for the dust filter installation there are 4 raised tabs onto which the dust filter is placed. 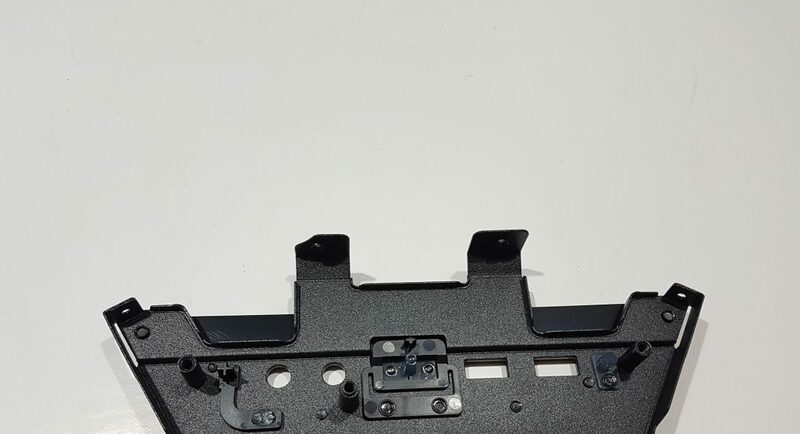 These tabs are actually the insertion mechanism of the rubber feet on the inner side of the chassis. 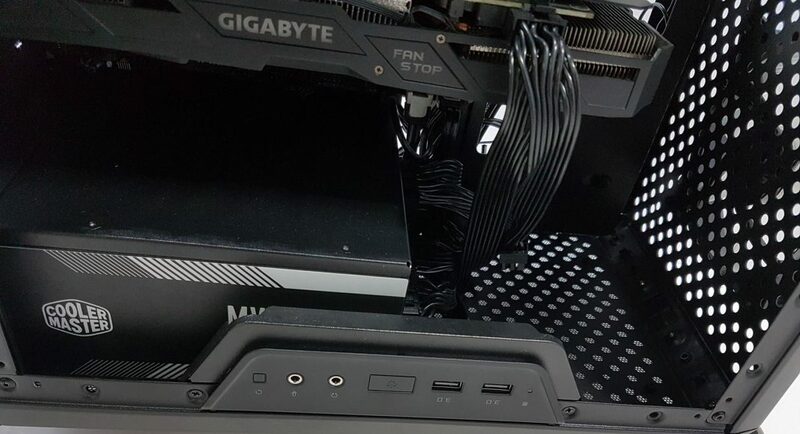 PSU is placed on these rubber feet. This is a smart implementation. This dust filter could have been magnetic. The chassis frame has an identical layout as is on the front and the top sides. Now, it is time to look the sides of the chassis along with the internals and see what it is offering. The left side panel is a transparent window. One quick look is enough to indicate the installed I/O Panel on the right side of the chassis frame. 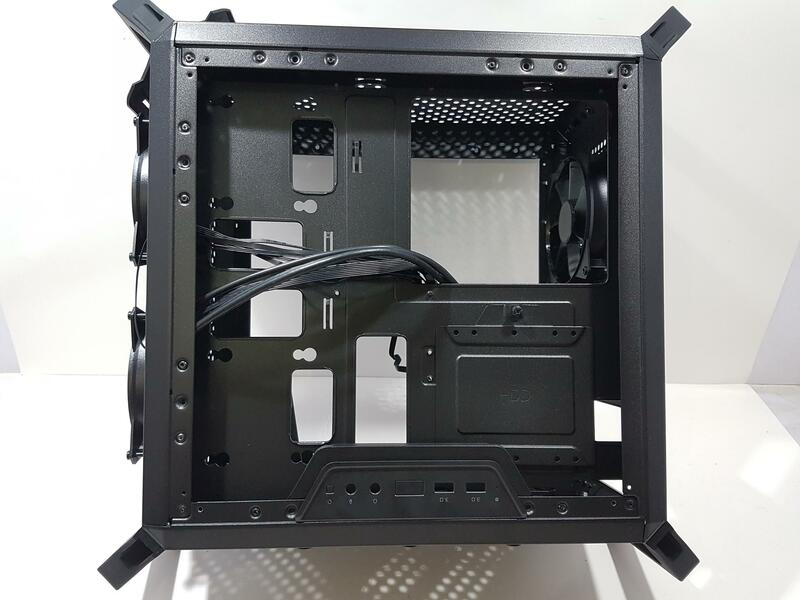 This is a modular approach from Cooler Master that would allow the user to install the I/O Panel on any side of the frame with total 6 mounting provisions on both sides. 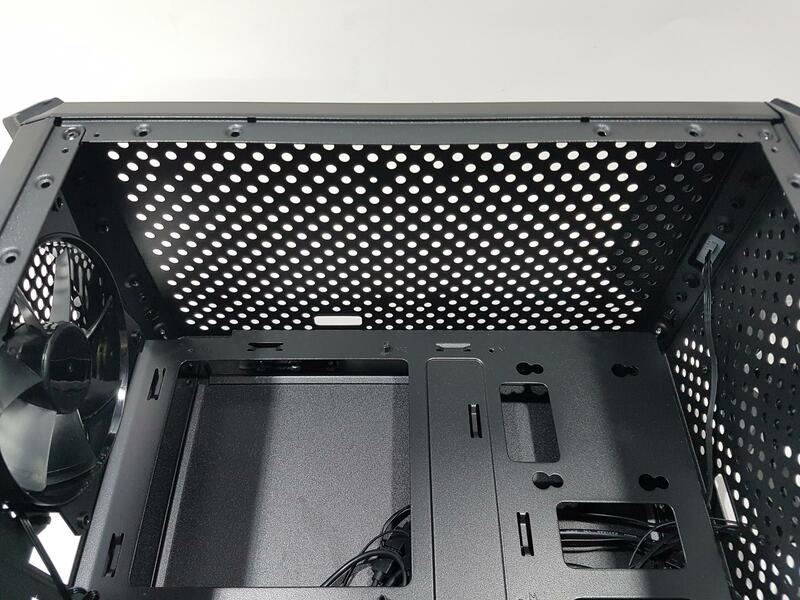 Please, keep in mind if you are to install the I/O Panel on the right/back side of the chassis, the transparent panel will need to be mounted there as well which would leave you to install the solid panel on the left side and you will not be able to showcase the nice build of yours. Both panels are interchangeable with condition that I/O Panel will move along with the transparent panel. 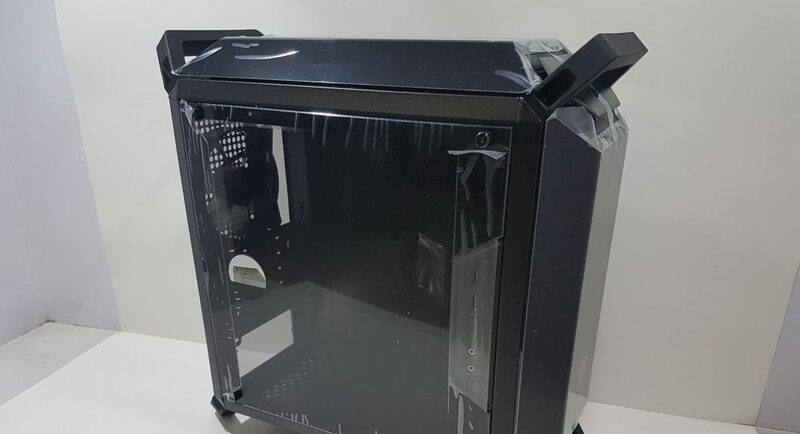 The transparent side panel is not fully flushed with the chassis frame and there is a bit of gap. The panel is secured using thumb screws. 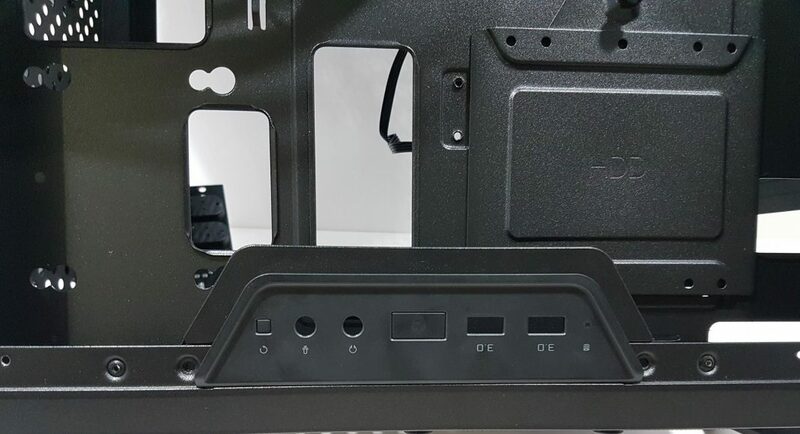 There are silicon washers on the panel that make contact with the screw holes on the chassis frame. Let’s dive in on the internals of the chassis. The overall layout of the chassis makes it spacious. 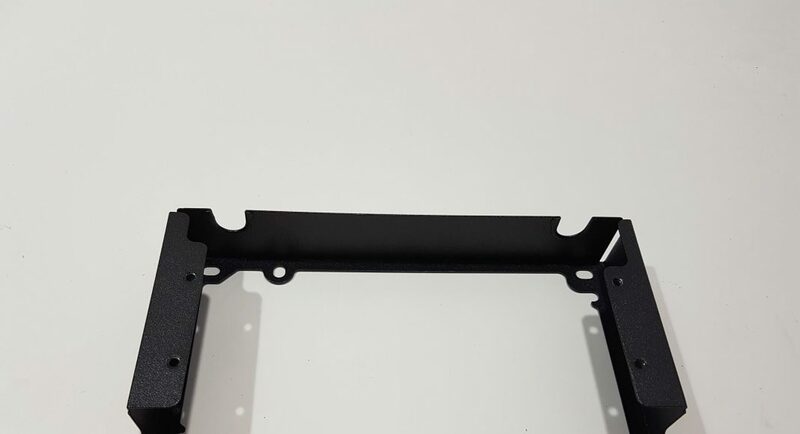 A glimpse on the motherboard tray will reveal that it has openings on the top, right, and bottom with respect to the chassis frame. There is a good reason for that and I am glad Cooler Master has opted for it. As the I/O Panel can be mounted in either of these directions, these openings would allow for better cable routing hence better management. 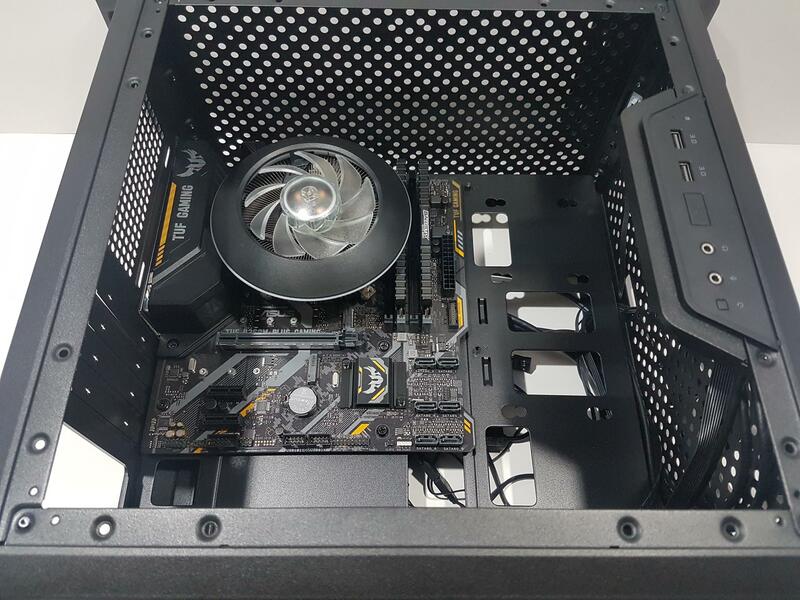 There is a large cutout on the motherboard tray for easy installation of the CPU cooler. 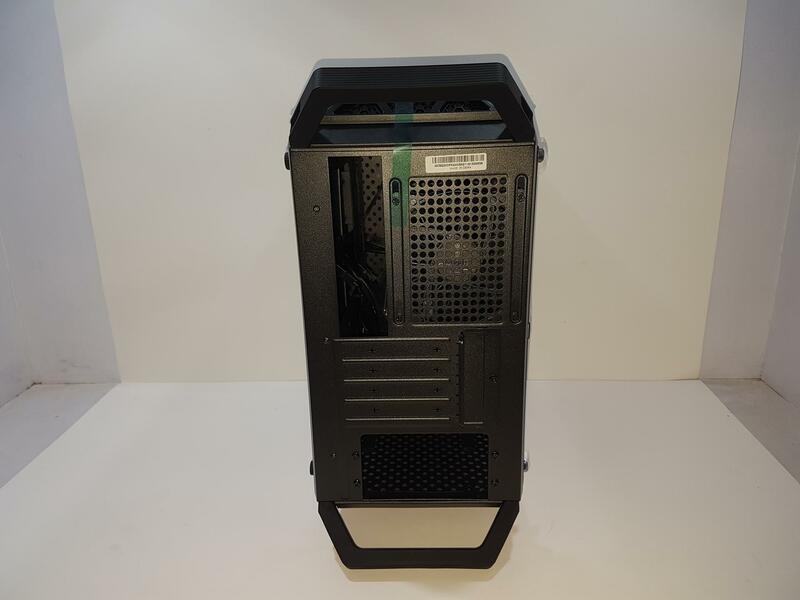 This chassis has clearance for up to 157mm height of the CPU Cooler and 360mm length of the graphics card. 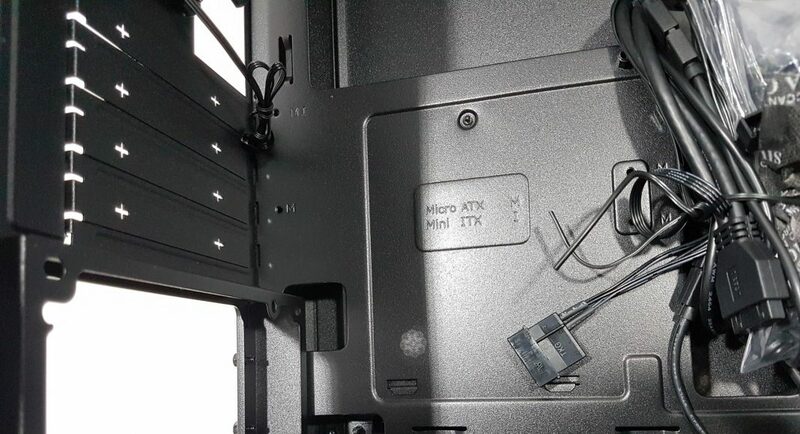 The standoff holes are marked with M and I. M stands for micro-ATX and I for mini-ITX. Standoffs are not pre-installed and Cooler Master was kind enough to provide a nut for easy installation of the standoffs. 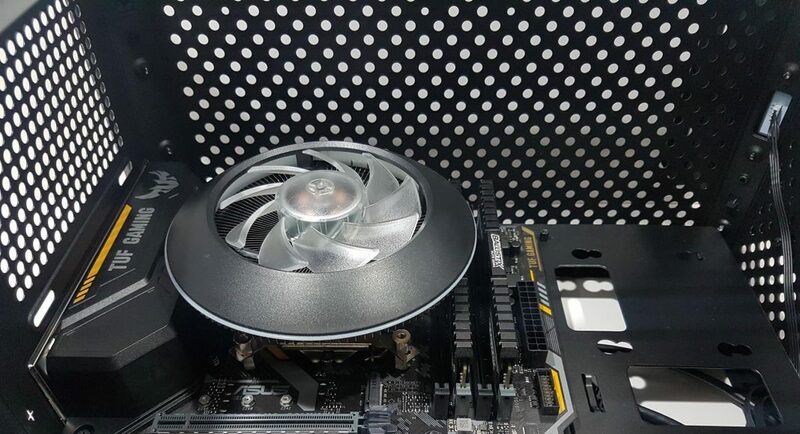 There is a 120mm non-LED fan pre-installed on the rear. It has rated speed of up to 1200 RPM and carries a three pin interface. 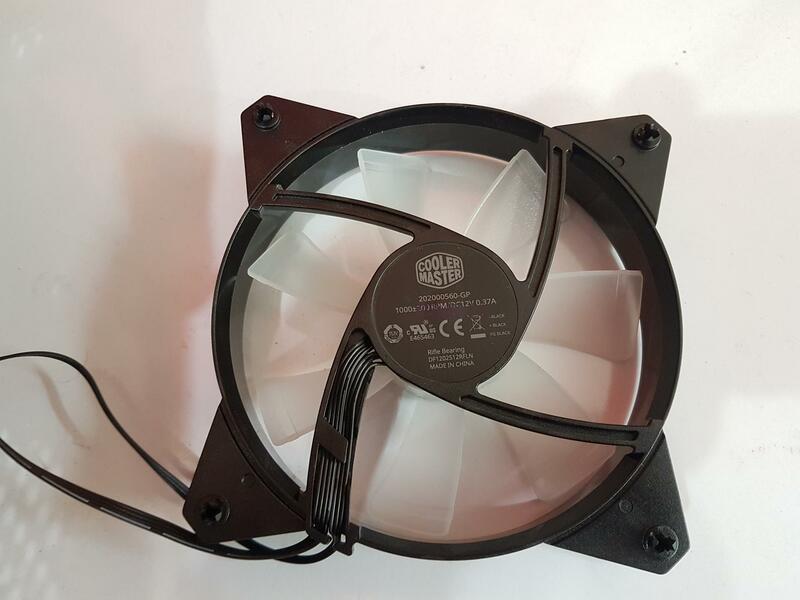 Unfortunately, this fan never crossed 1000 RPM despite running it at full speed. 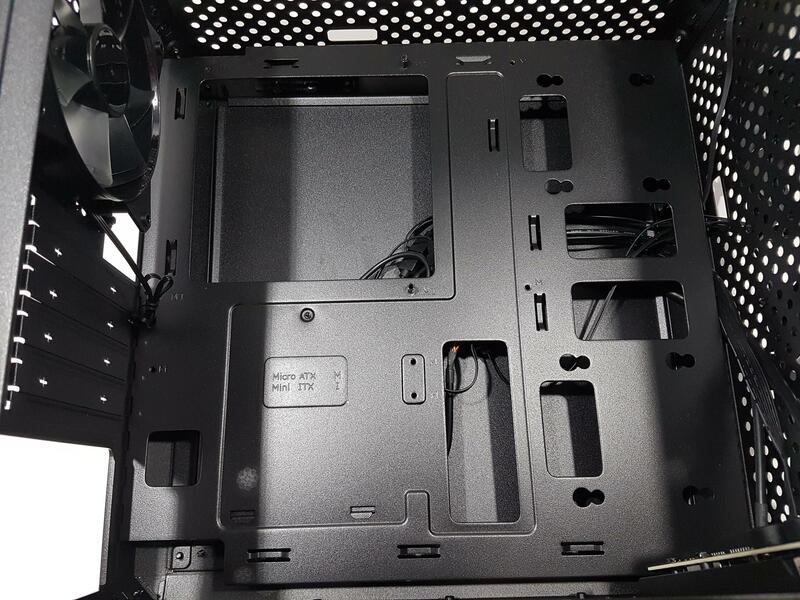 A close look will reveal that the PCIe slot covers are in plane with the chassis frame. These covers don’t have mesh as once removed, they can’t be used again. This is my complaint with this approach. Covers should have been reusable. There are two vertical large size cutouts. One is at the top right and the second one is above the bottom right. These are for the cable routing. Similarly, there are two horizontal cutouts in parallel to each other in the center. There are 4 mounting holes above these horizontal cutouts and 4 below them. These are to mount the 2.5” SSDs. 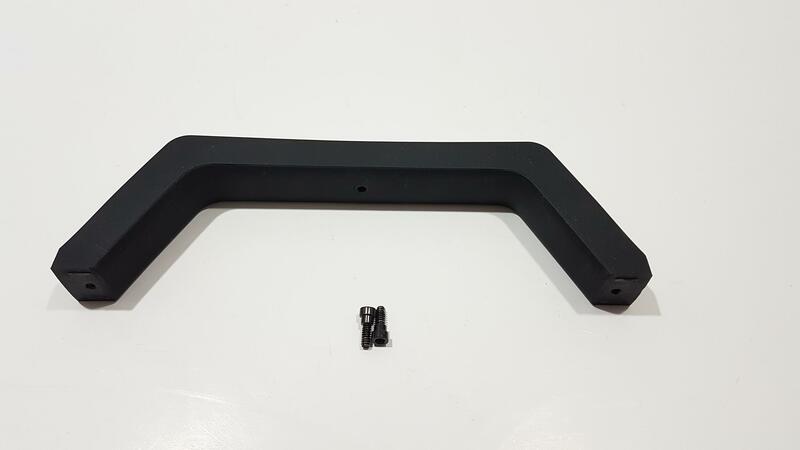 Cooler Master has provided silicon mounts in the accessories. 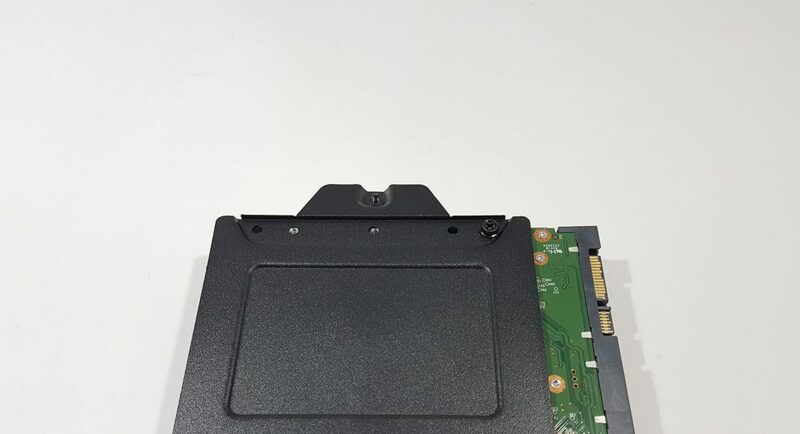 The user is required to install these mounts on to the SSD using screws and then put the SSD on the chassis mounting position and slide in the SSDs towards the right side to complete the installation. 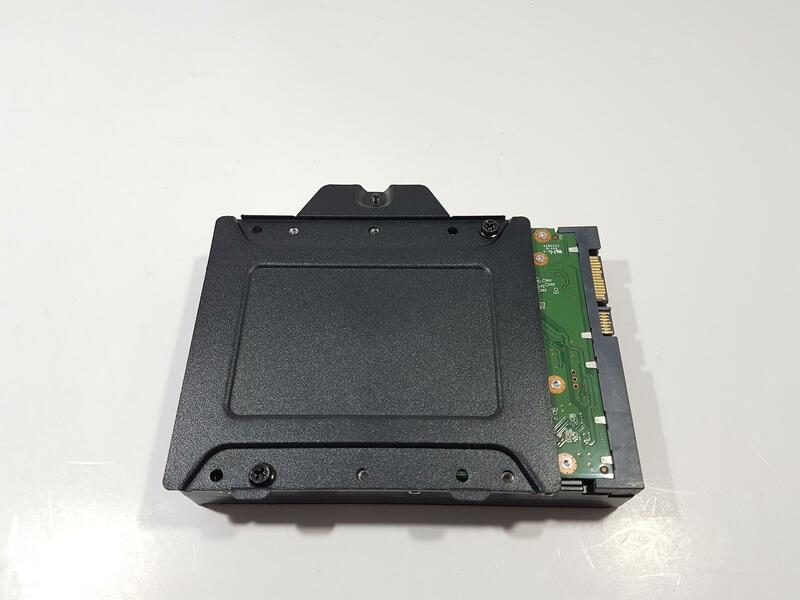 SSDs can be mounted on the inner side or back side of the chassis. 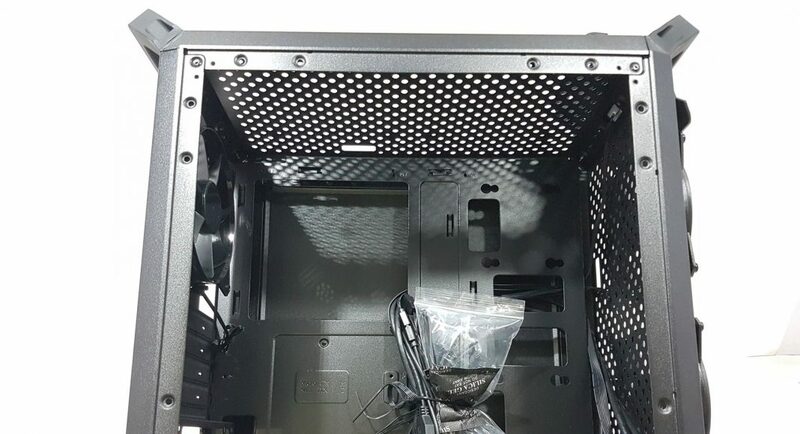 There is a large vertical cutout right next to the PSU mounting location. This is where the cables of the PSU are routed. None of the cutouts has a rubber grommet on it. The top and bottom sides on the front from the inside of the chassis are angular and not a straight line. The total height from top to the bottom of the chassis is 370mm. In fact, the depth and height of the chassis frame are 370mm. 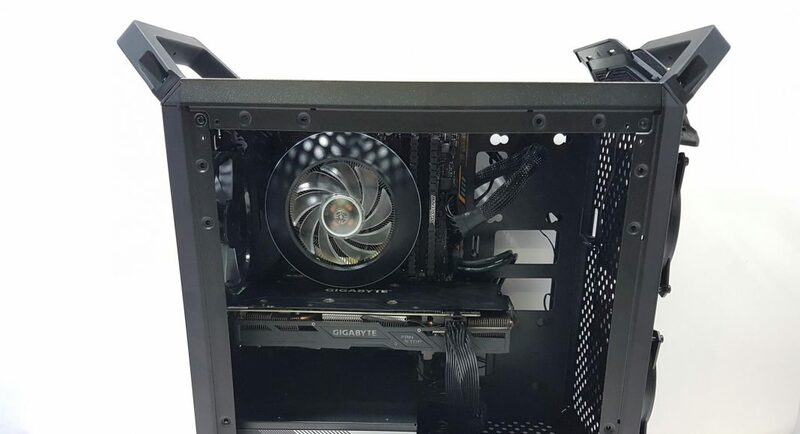 The user can mount a 120mm fan on the bottom as well. 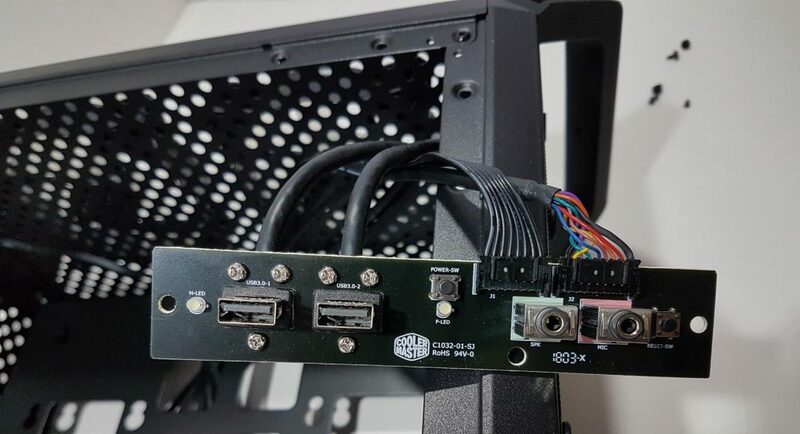 Remember when I mentioned about a PSU bracket above as to why there is a bracket when we can’t slide the PSU using this design. Well, here is the answer. 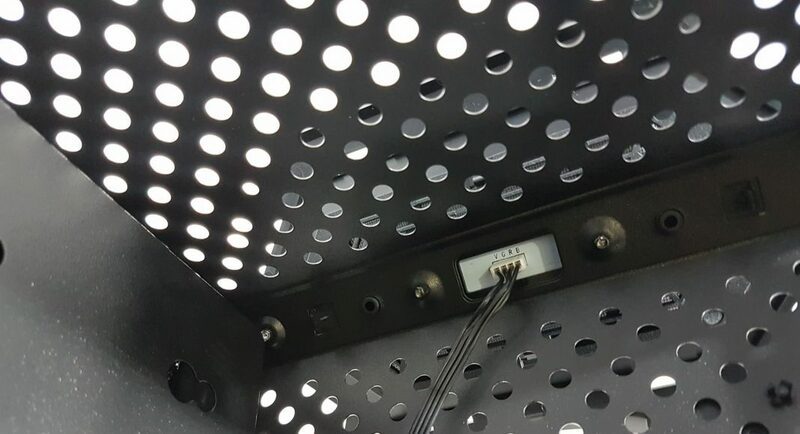 The bottom edge of the PSU mounting area is angular and not a straight one so there is no way PSU could have been mounted in a standard layout. 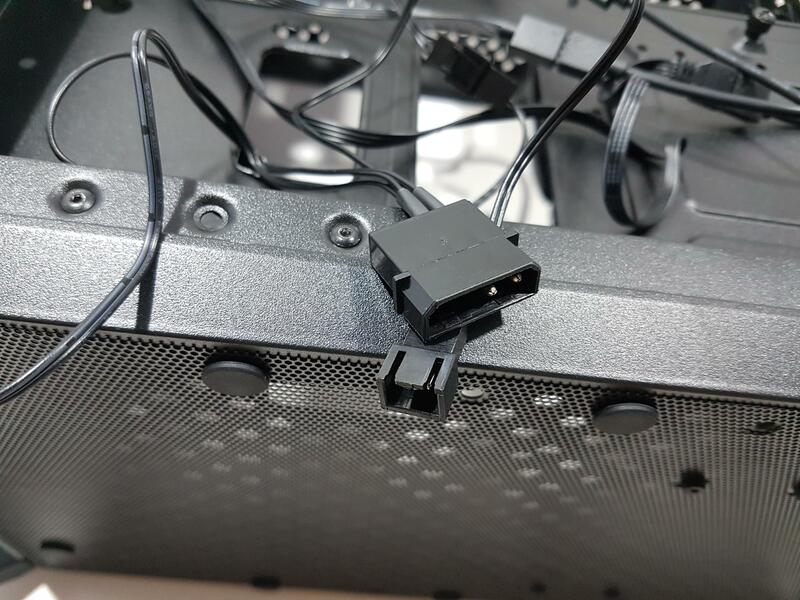 To cover this issue up, Cooler Master has provided a bracket which needs to be installed on to the PSU. 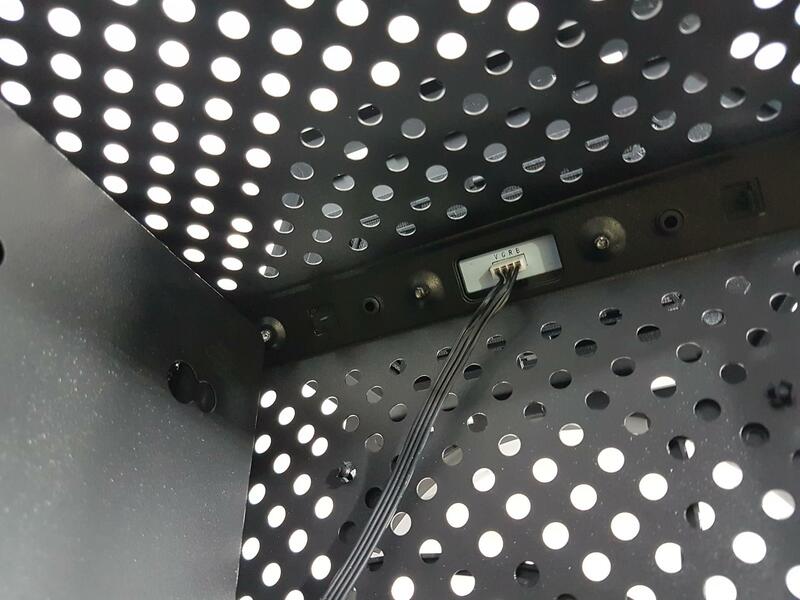 PSU is then placed inside on the anti-vibration rubber mounts and bracket is secured with the frame using 4 screws. 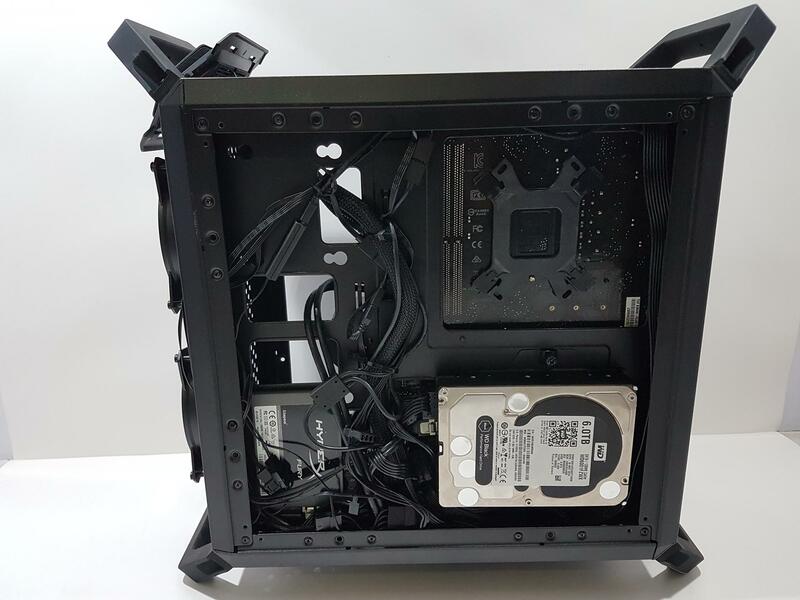 This would leave some space between the rear of the chassis and the PSU. 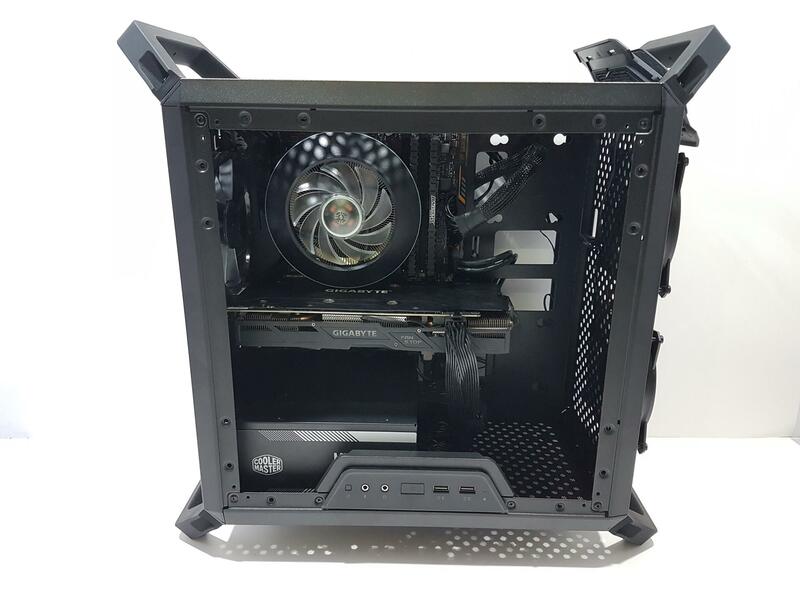 PSU up to 160mm can be installed in this chassis which is too good a clearance for a mATX chassis. 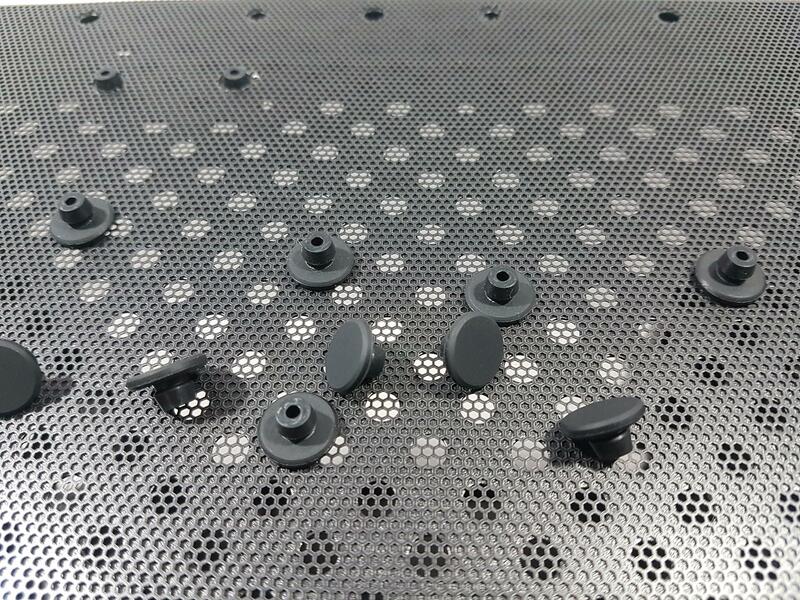 Notice the height of the anti-vibration rubber mounts. It is enough to route some cables under the PSU. 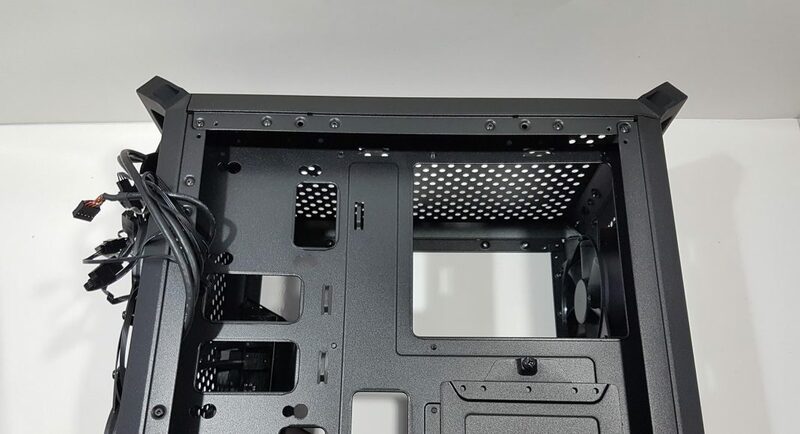 This is exactly how I managed to have a better cable management by installing the I/O Panel on the bottom and passing the system panel connector cables and HD Audio cable under the PSU for a clean look. 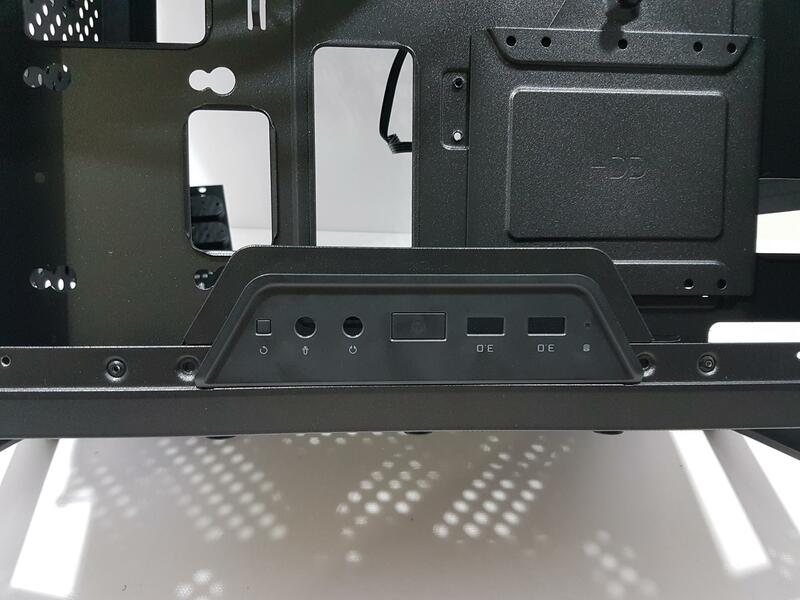 If a rear fan is installed then I/O Panel can’t be installed on the rear side of the chassis. Also, if installing the I/O Panel up top then you would need to be really creative in cable routing and better management. Same goes for the right side mounting. If you are going to use the radiator then cable routing would be a challenge. The I/O Panel is installed onto the chassis frame using four screws. 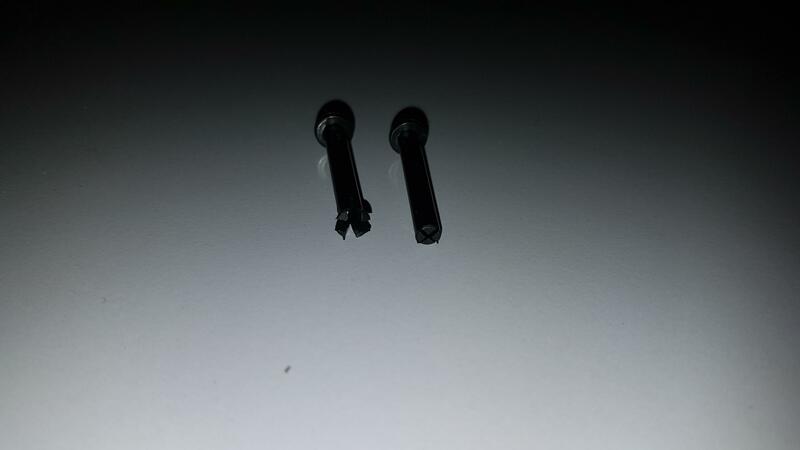 Two screws on the facing side of the frame and two from the outer side. 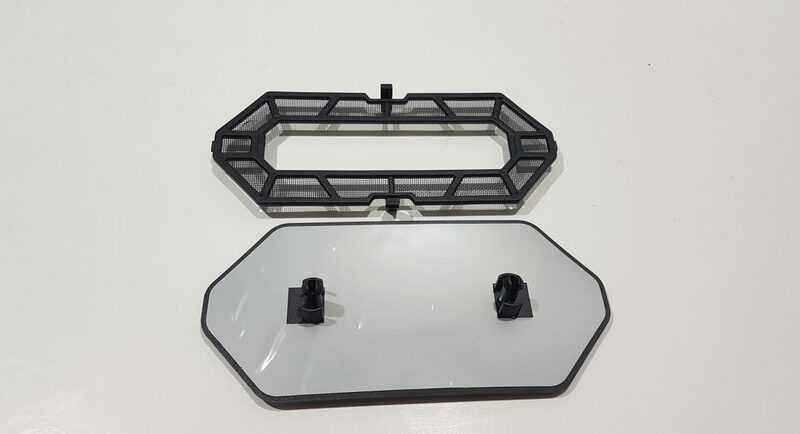 The position of the last two screws would demand to take off the front panel cover and similarly the top panel cover and bottom dust filter depending upon where the bracket is being removed from and installing to. There is a displacement of 25mm from the top side to the top of the motherboard and 42mm to the top of the DIMM slots. The I/O Panel has two USB 3.0 ports, Power button, Audio jacks, and a reset button. The chassis is lifted at 34mm from the ground. The PCB is secured with the bracket using three screws. It is time to look at the backside of the chassis. This side has a solid side panel which is secured using 4 thumb screws. 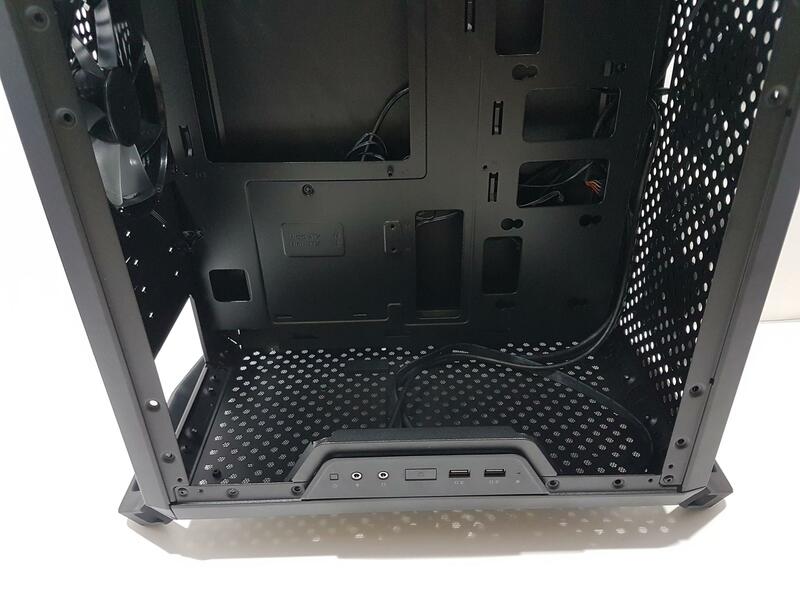 One obvious thing on the backside is a plenty of cable management space with a clearance of up to 27mm approximately. 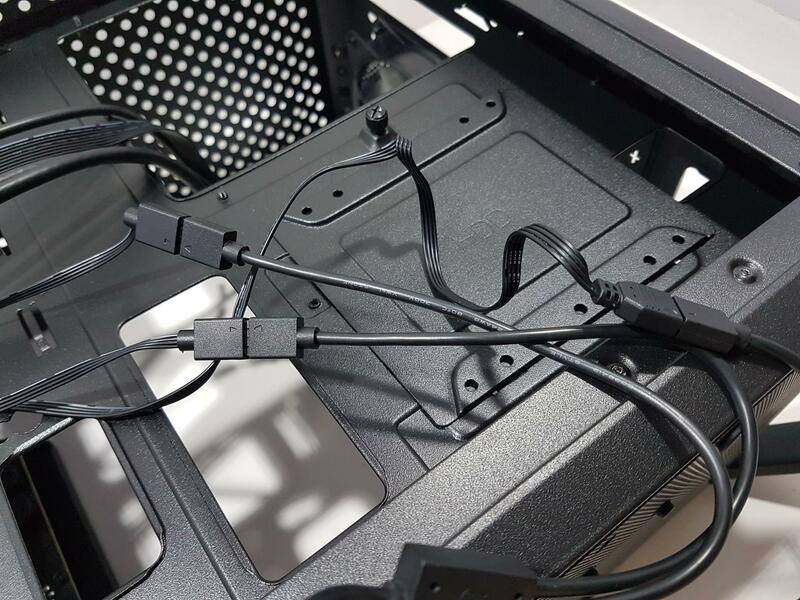 I love the cable management provision in this chassis. 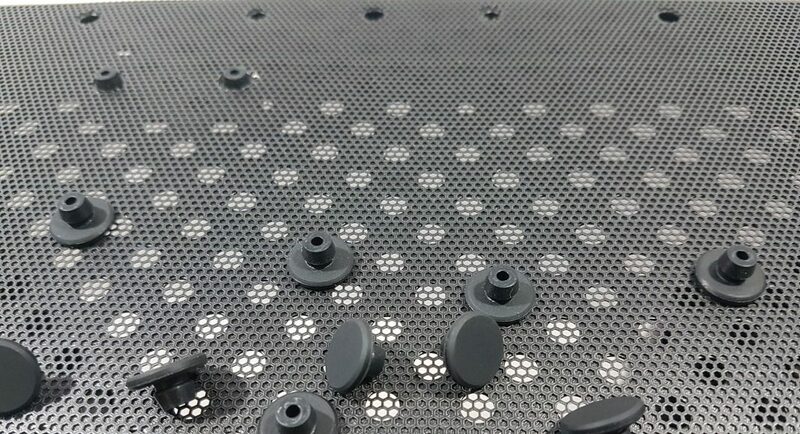 There are total 10 cable tie dots on the backside that can be used to clamp the cables using the zip ties. 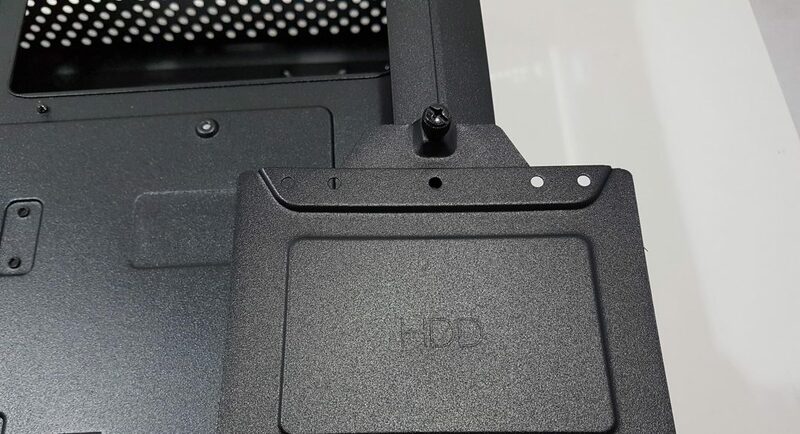 There is a 3.5” HDD bracket below the CPU Cutout. Good thing is that it is using a thumb screw which makes the life easy with a tool-less approach. 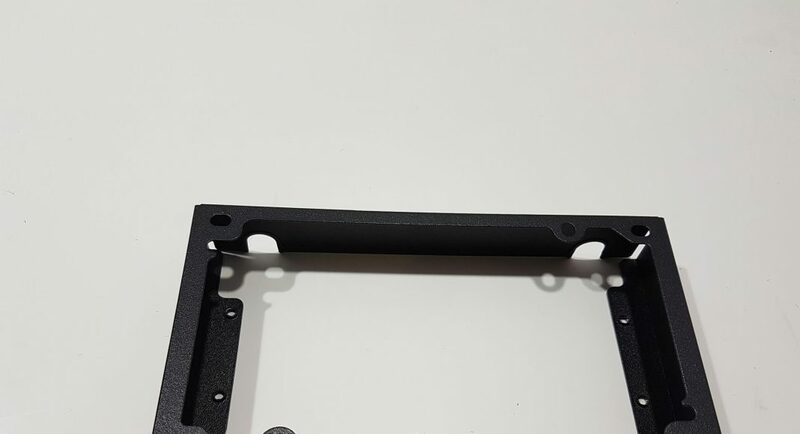 There are two tabs at the bottom of the bracket which are used to secure the bracket from the bottom. There are 5 mounting holes on the bracket. An HDD is installed on this bracket and then the bracket is mounted to the chassis. 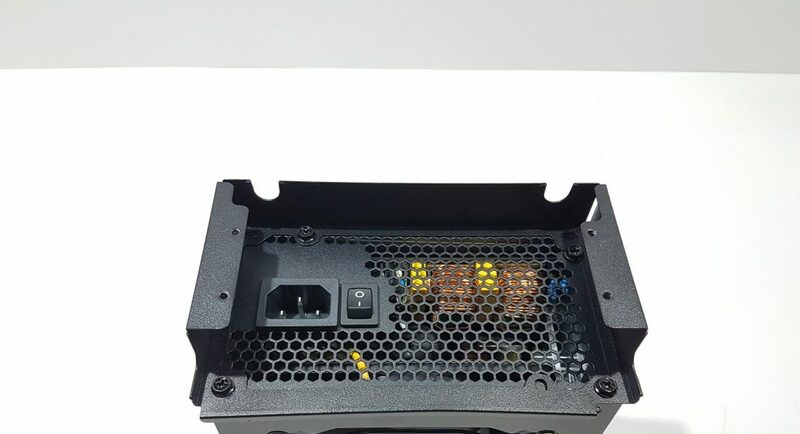 The RGB splitter can accommodate up to 3 RGB devices. Keep this in mind as there are already three RGB devices in this chassis. 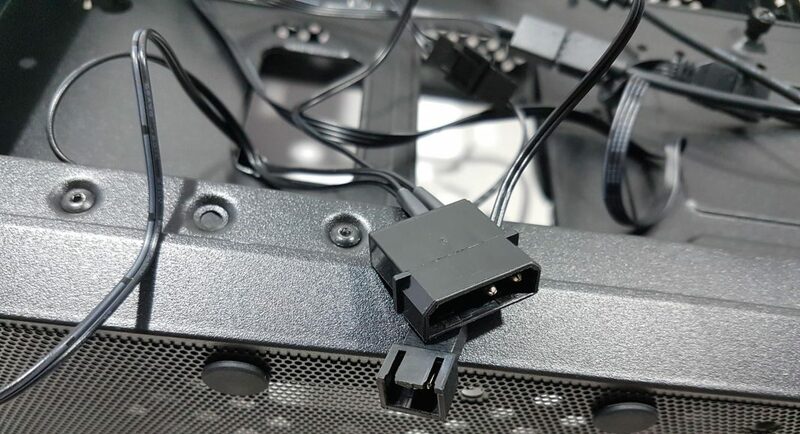 The user has an option either to connect the controller cable to the motherboard’s +12VGRB header or use the bundled RGB controller to control the lighting effect. 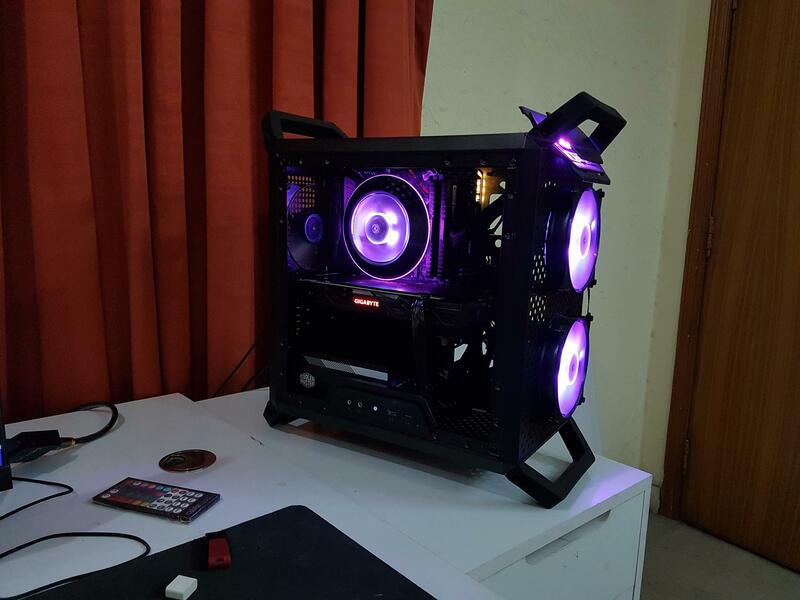 That RGB Controller would need an easy and ready access which is not possible but Cooler Master has provided an alternative approach for easy access to the lighting control. The user can connect the I/O Panel’s reset wires to the RGB Controller. This way user can use the Reset switch to change the lighting modes though this would disable the system reset functionality. Hence a remote controller would have been a nice implementation. The I/O Panel can only be installed on three locations on the backside. It can’t be installed on the rear side. Before proceeding to the installation section, one important thing needs to be mentioned here. 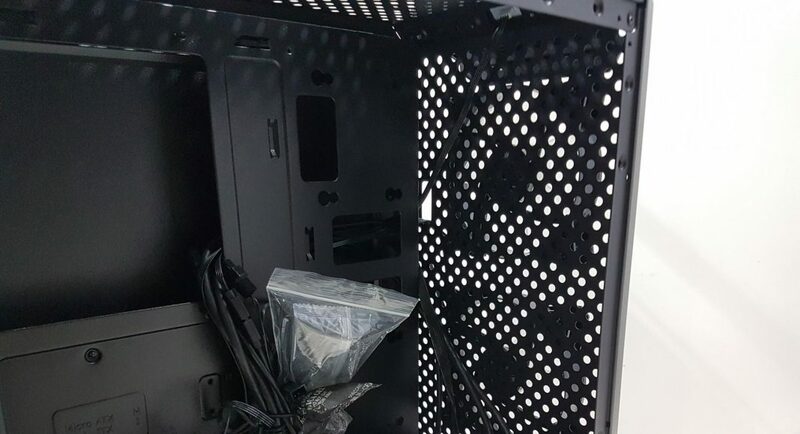 The Cooler Master is using two-piece fastener type plastic screws to install the fans on the chassis. The anchor with 4 head is first slided through the fan mounting holes and the chassis hole then the fastener screw is pushed through the anchor which would make the 4 heads of the screw to move outward hence securing the fan onto the chassis. Problem with this mechanism is that they are not easy to mount again once removed. The front fans are rated at 1000 RPM ± 200 RPM. Installation in this chassis is easy. There are a few things that a builder needs to take care of while assembling. I have mentioned those points in the design above. I will repeat them here as well. The I/O shield was never a perfect fit for some reason. Tried multiple times before it sits in but not entirely satisfactory. I started with the I/O Panel and decided to mount it on the bottom side of the chassis frame. 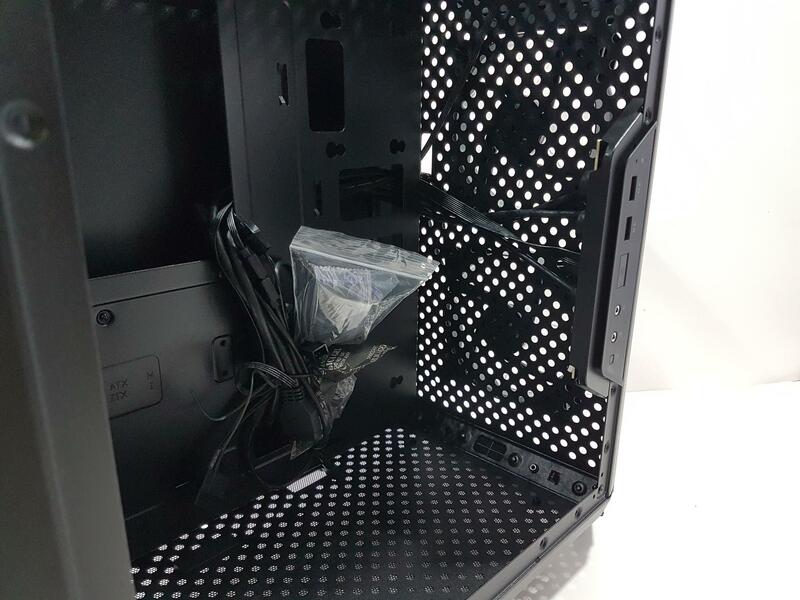 This way I was able to take full advantage of the gap that has been provided under the PSU and route the system panel cables and HD Audio cable under the PSU for clean cable management. 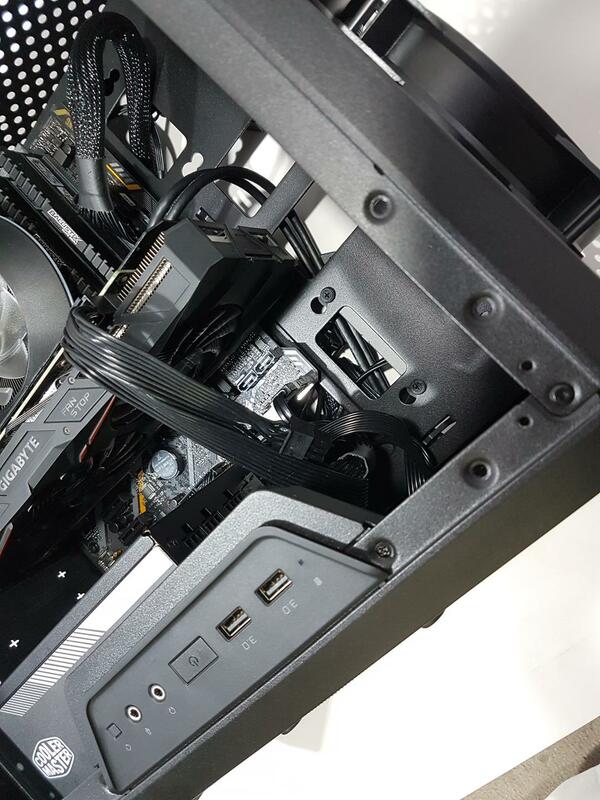 From cable management perspective, this chassis has a lot to offer to the builder. If you are planning to use I/O Panel on its default position and at the same time decides to use a radiator on the front as well then I/O Panel’s cable routing would be a challenge. 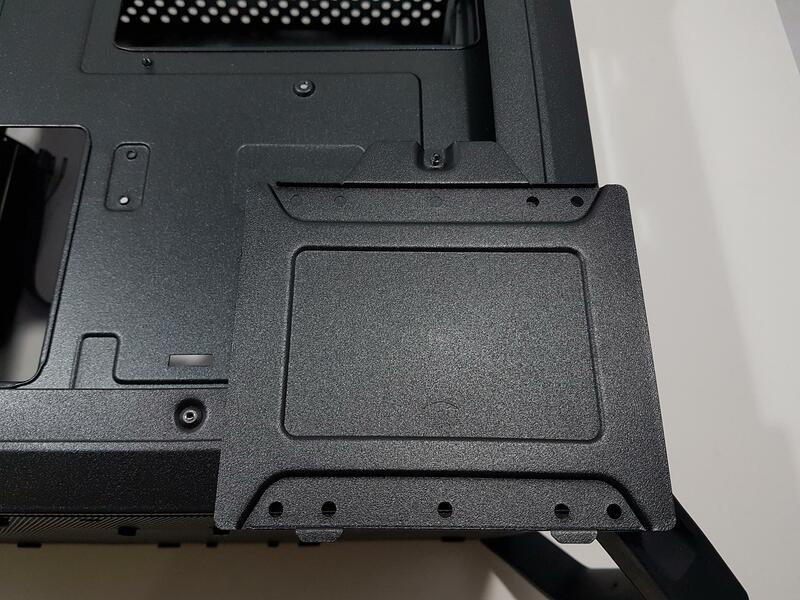 The I/O Panel can’t be installed on the rear side of the frame due to the obstruction from the rear fan. 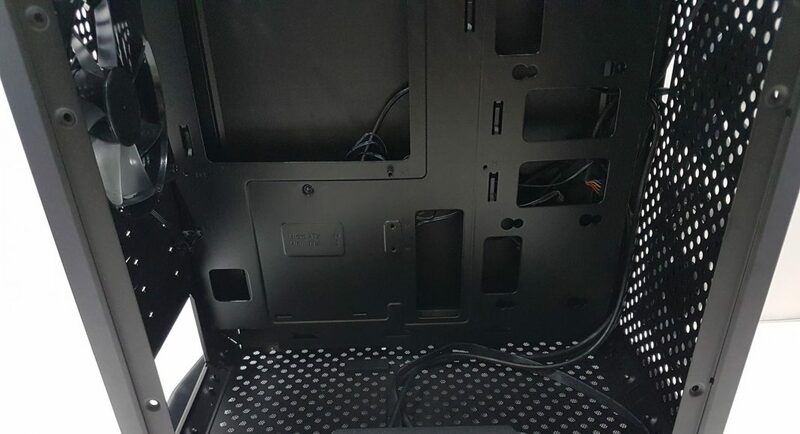 Plus there is no point in installing this panel on the rear side as cable management would be a disaster. I would highly suggest to take out the PCIe slot covers before installing the motherboard. 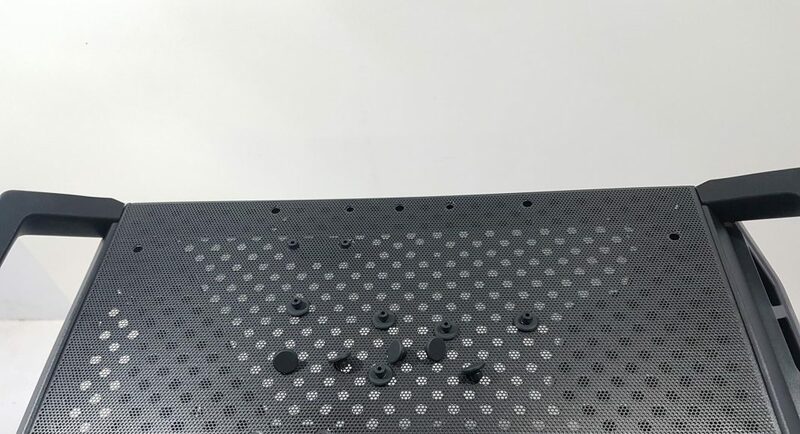 Leave the protective sheets on the panels intact until the build is finalized and tested for a proper run as these panels can get scratches easily. If you would like to show the beautiful build then some internal lighting would be needed as the panels are dark tinted. 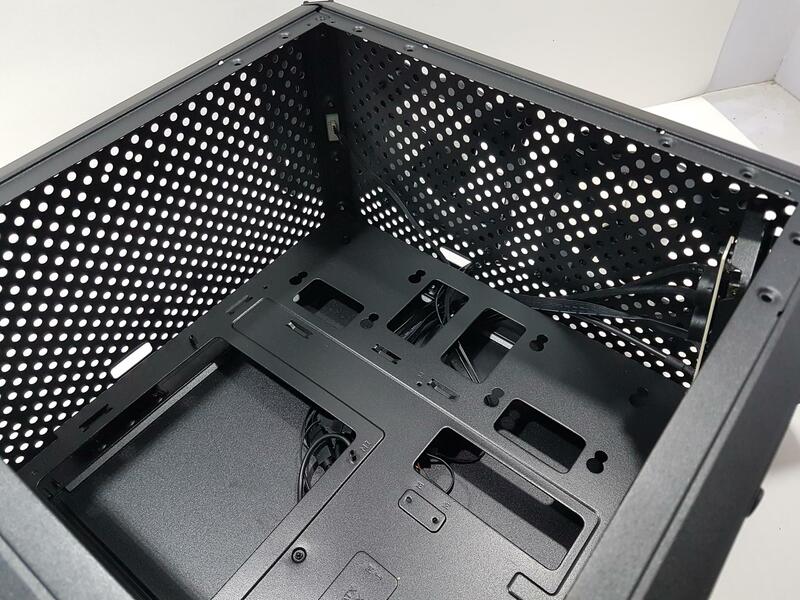 Take your time with the cable management on the backside of the chassis. 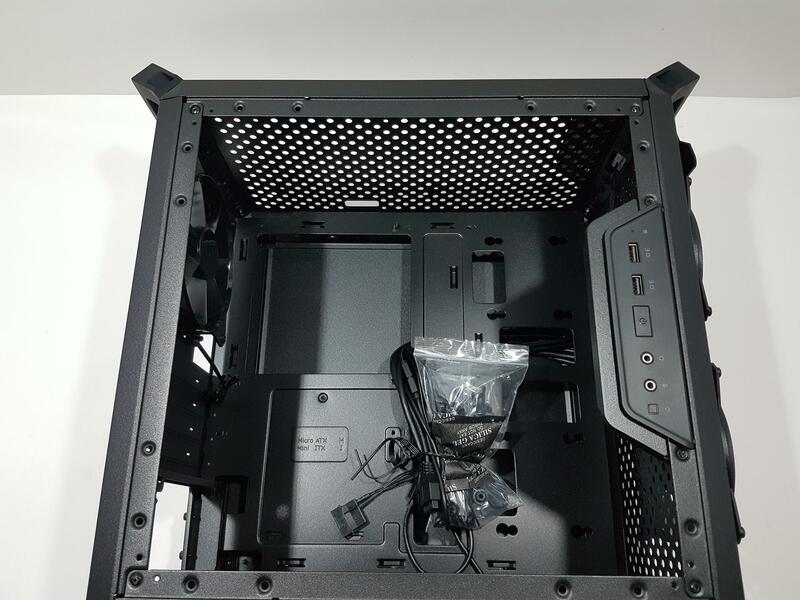 You can start either with the motherboard or the PSU but keep in mind the I/O Panel’s positioning as it will be important with respect to the cables routing and management. 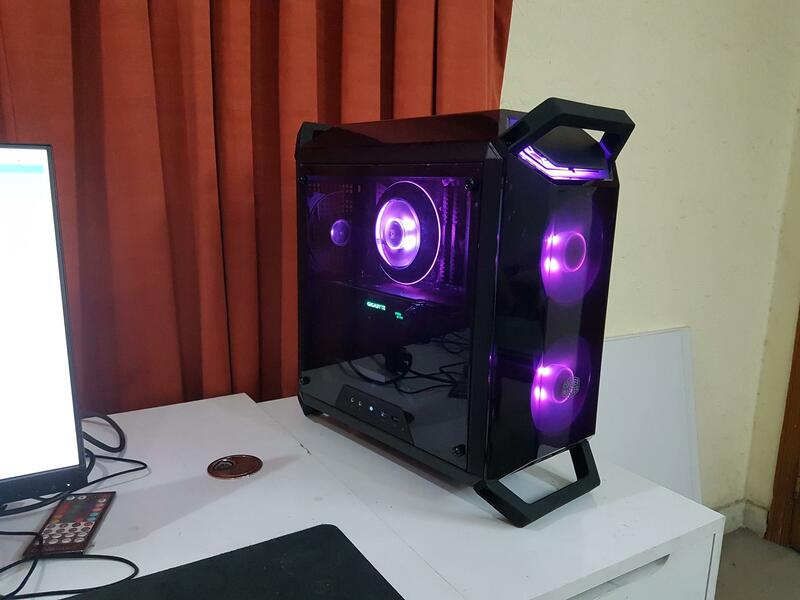 My overall build experience with this chassis was good and I enjoyed assembling a PC in it. I did not spend much of a time on the cable management. I can come up with a much cleaner and better-looking cable management than this for sure. 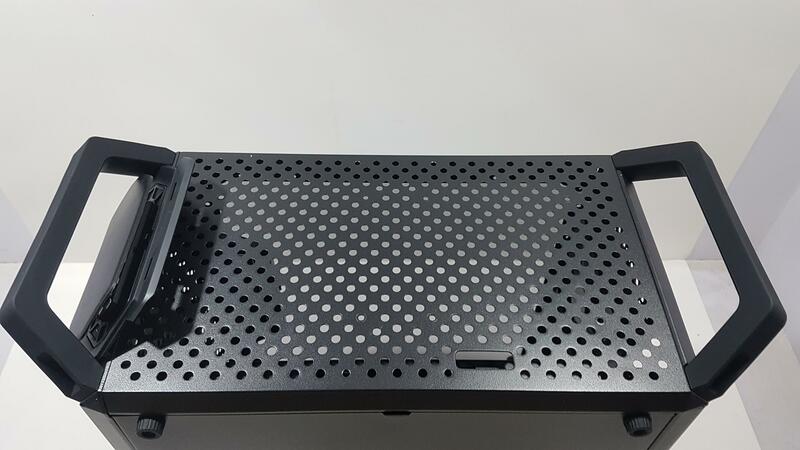 Please, refer to the user manual to identify the 120 and 140mm mounting holes on the front and top side. The lighting effects are right on the money and I love the colors. It is not overly done and has even lighting for smooth and better visuals. 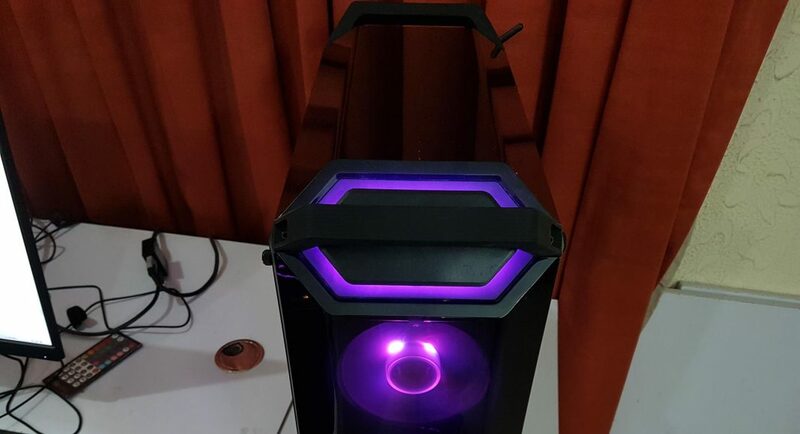 Users can customize the looks as per the build’s color theme though personally, the purple color looks that good in person on this cooler. There is an 8°C difference for the CPU temperature with and without top/front panels. 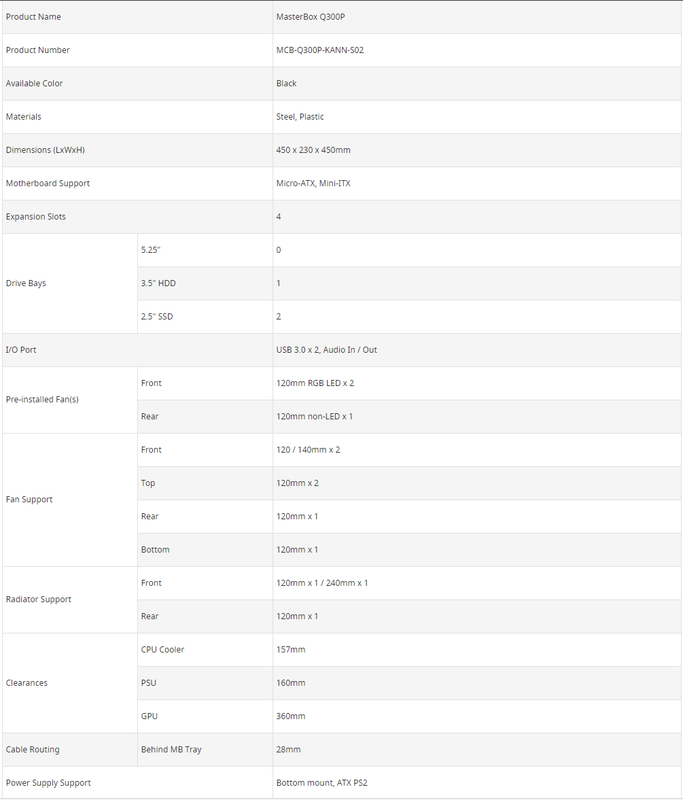 This is a glaring difference and speaks for the poor airflow of the chassis. 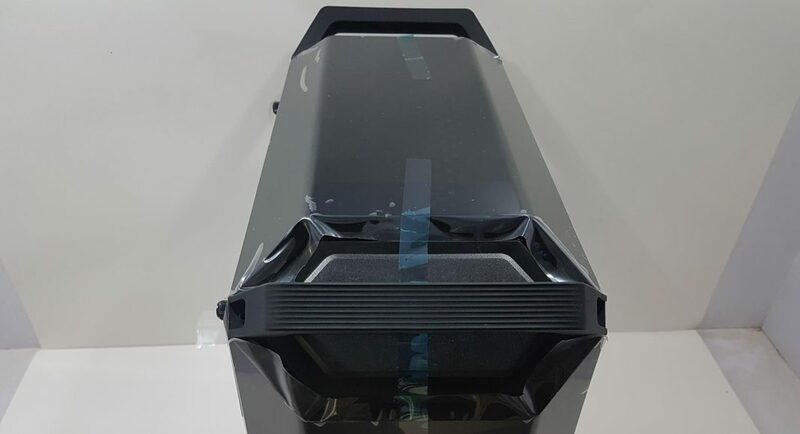 Please, keep in mind that we are not determining the cooling potential of the cooler but the effect on the cooling performance due to the airflow. I have mentioned the actual temperatures not the deltas and for ease of understanding, I have also mentioned the ambient temperatures. All the reported temperatures are in °C. 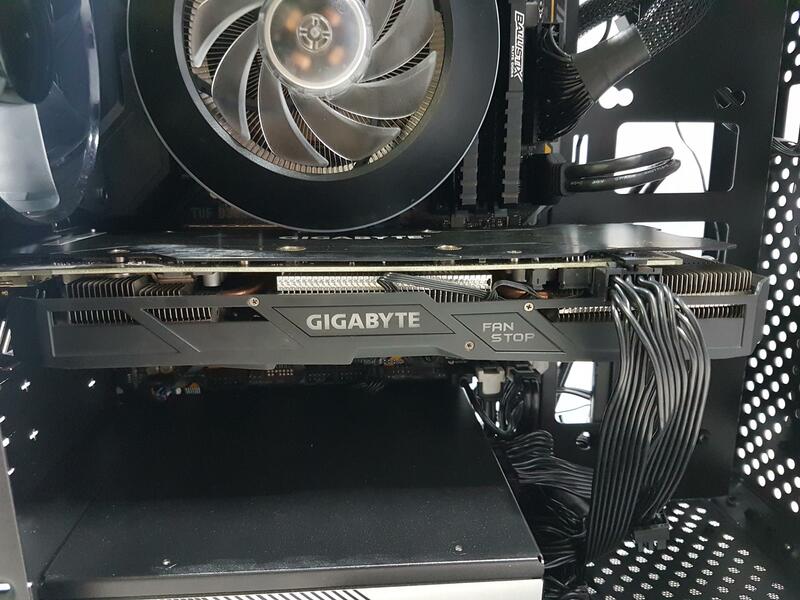 There is a difference of 3°C in the temperature of the graphics card with and without top/front panels. 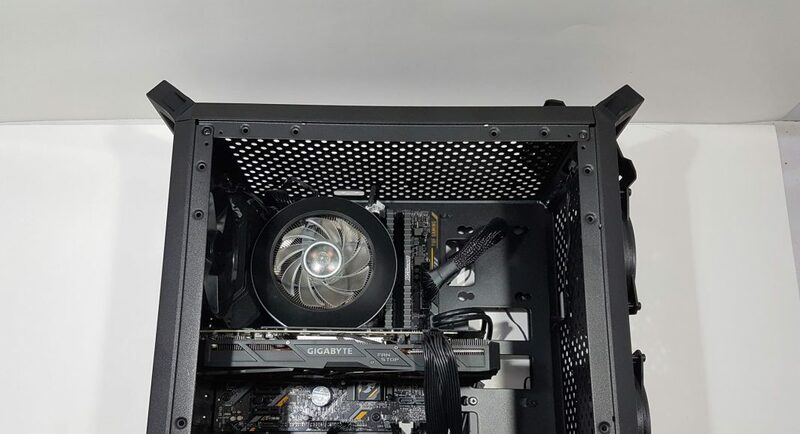 While you may jump quickly saying this difference is not that much, keep in mind this graphics card had never seen above 71°C on stock clocks even inside the other chassis like Phanteks Evolv ATX and Thermaltake View 32 TG. So, even without the front panel, this card was doing 80°C which is already 9°C higher than what I got in other chassis on stock clocks. This thermal testing is a clear indicator of the poor airflow inside this chassis. 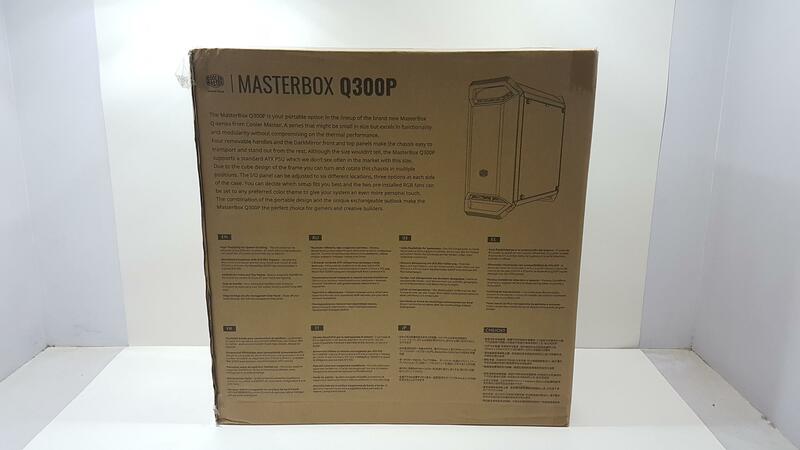 The Q300P is micro-ATX chassis in the new MasterBox Q-series lineup from the Cooler Master. 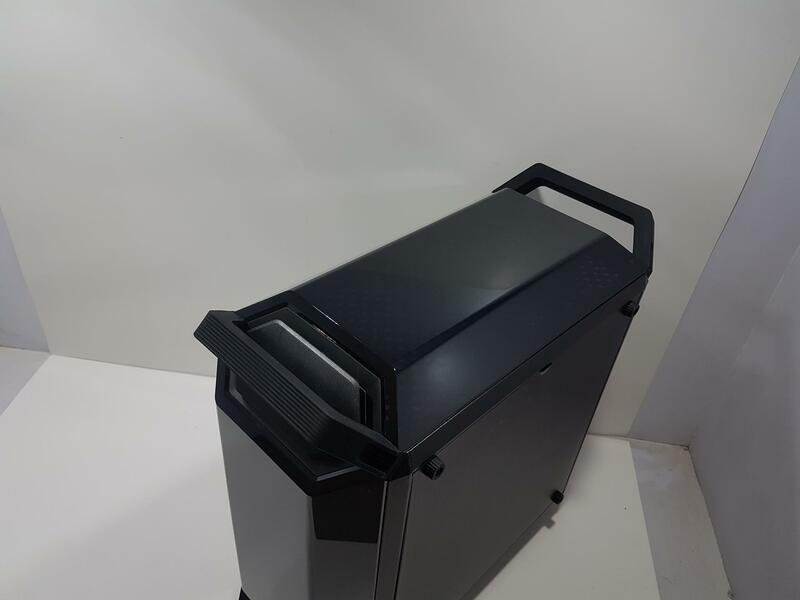 This chassis has a focus on the mobility with four elegant handles that are removable, modular I/O Panel which can be installed on 6 locations on the chassis, and last but not least the RGB goodness with acrylic top/front/side panels to add more to the overall aesthetics. 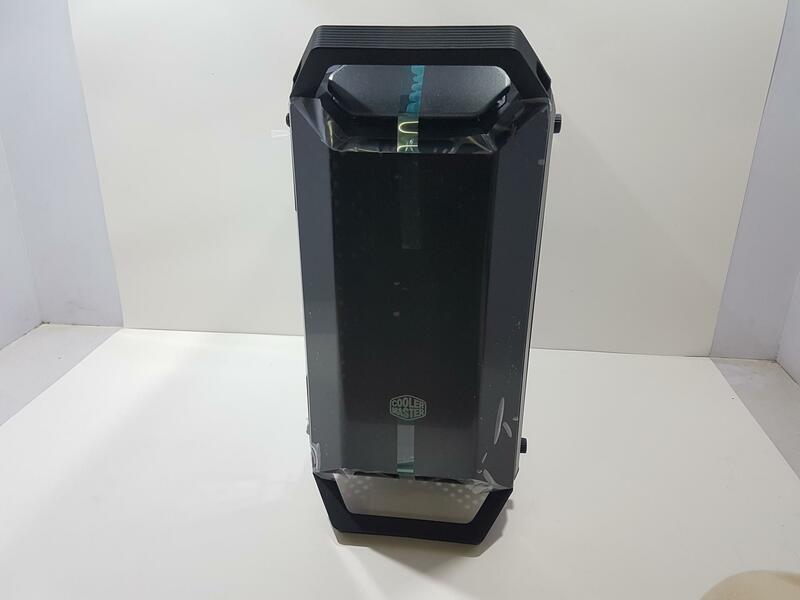 Cooler Master seems to have gone all out in this price range to bring the customers one heck of a gorgeous looking chassis with loads of build potential but at the cost of poor airflow. 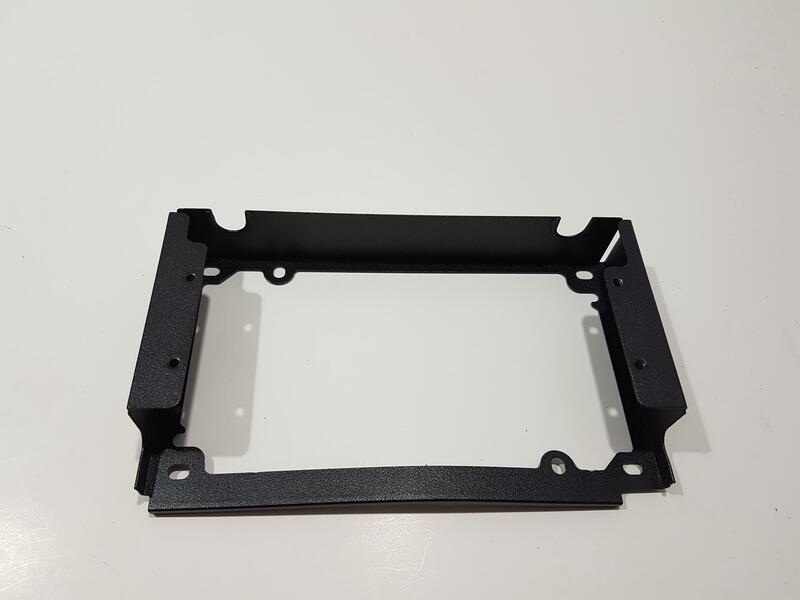 The dimension of the chassis is 450x230x450mm (LxWxH). This is with the handles. 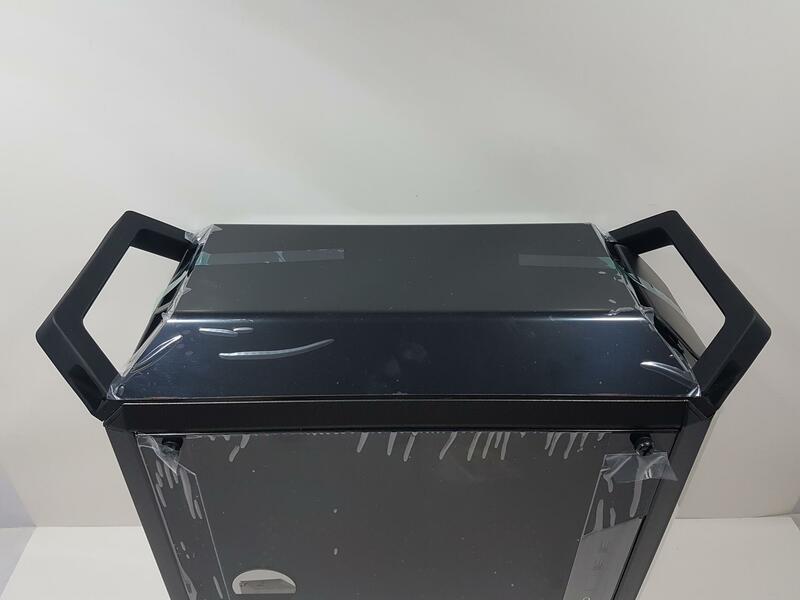 The inner side of the chassis cube has 370mm height and 370mm depth which is quite good for a quite a size for a mATX chassis and this has enabled the Cooler Master to provide clearance of up to 160mm for the ATX PSU which is another plus for this design. 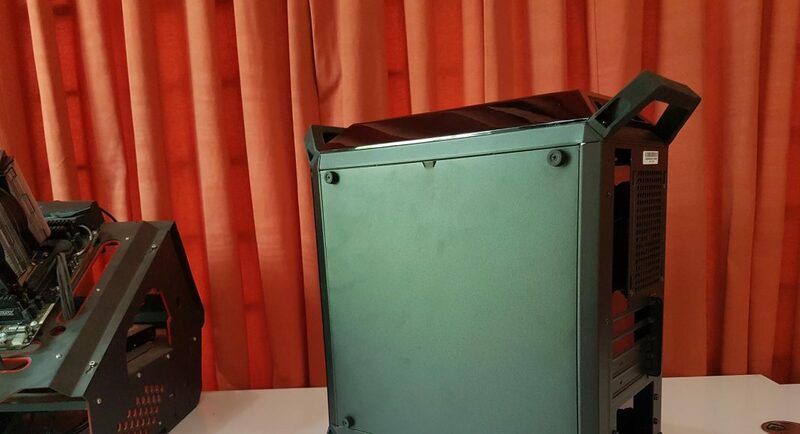 This chassis has support for CPU Coolers up to a height of 157mm, graphics card up to the length of 360mm. In terms of storage department, this chassis can house one 3.5” HDD and two 2.5” SSDs. 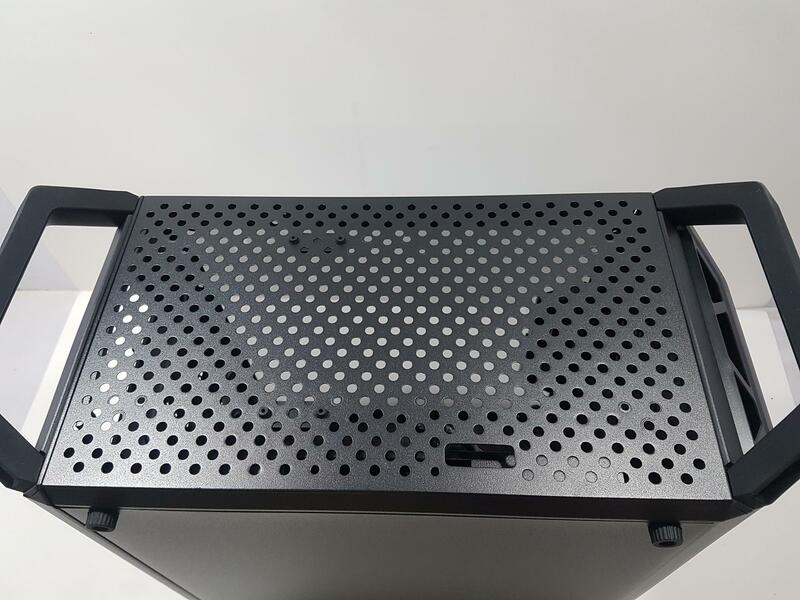 In the cooling department, this chassis has support for two 120/140mm fans on the front side, two 120mm fans on the top side and a 120mm fan at the bottom. the user can install 240mm radiator on the front side and a 120mm (slim) radiator on the rear. 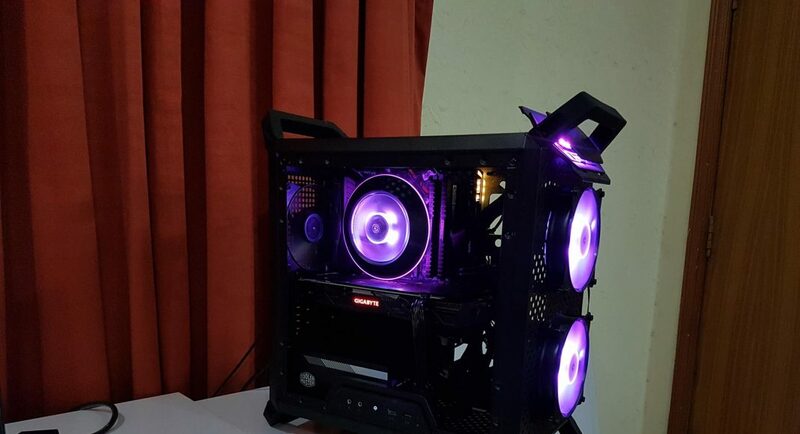 There are 2 120mm RGB LED fans on the front and a 120mm non-LED fan on the rear pre-installed. The top and front panels are made of acrylic and are dark mirrored which means they are tinted and highly reflective. 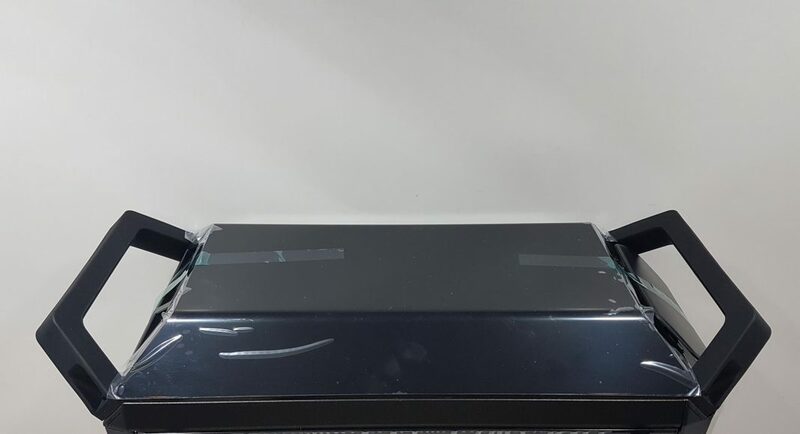 They are prone to scratches so make sure to remove the protective sheets from them once the system is fully assembled and tested. The side panel runs edge-to-edge and is made of acrylic as well. 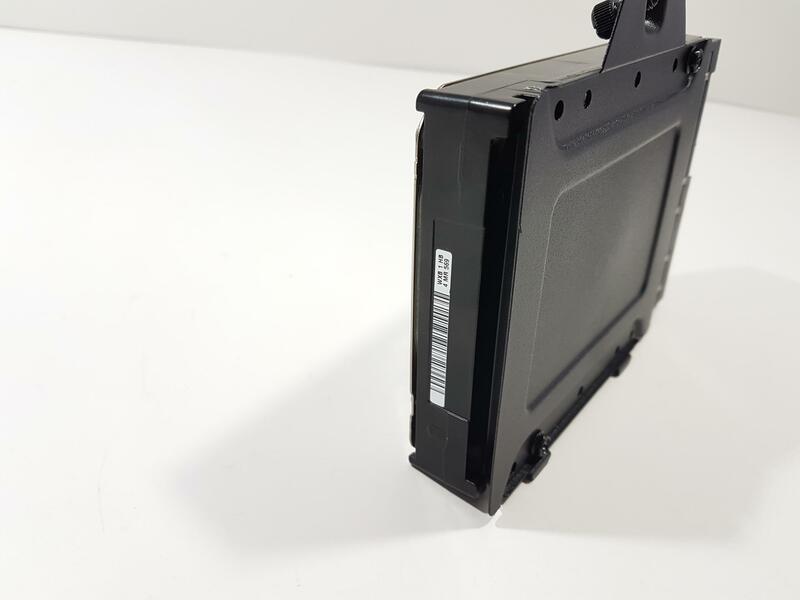 The I/O Panel on this chassis is modular and it can be installed on 6 designated locations with 3 on the backside and 3 on the front side. 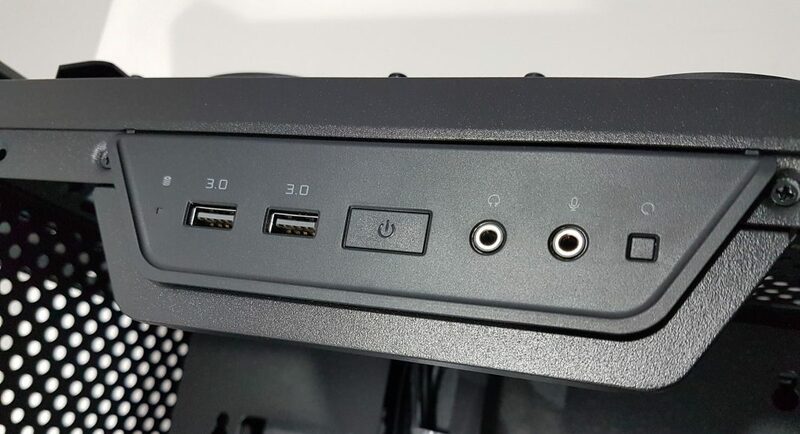 The I/O Panel has two USB 3.0 ports, a power button, a reset button, and Audio Jacks. The PCB is installed on to the Panel using three screws. Mounting the I/O Panel on each location has its own considerations for cables routing and management so plan the I/O Panel first. The panel is installed using 4 screws. I love this modularity approach. 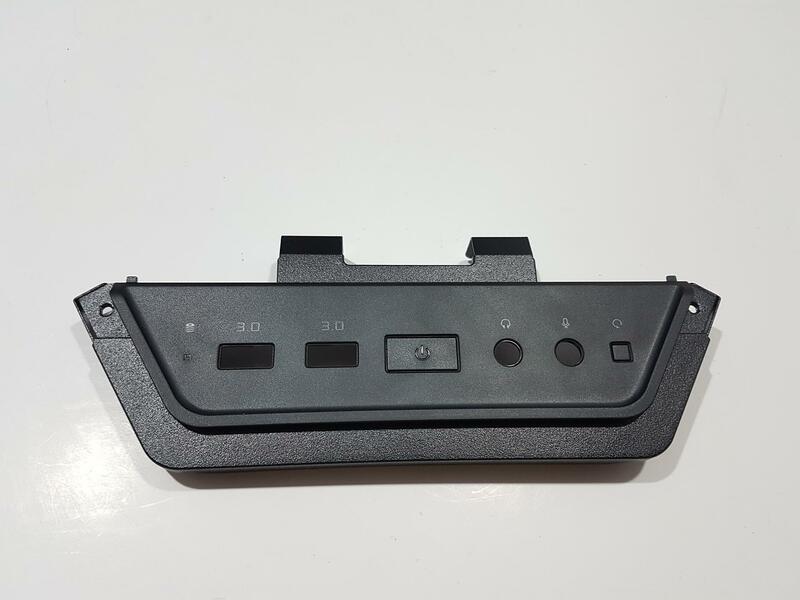 Please, note that the back side panel is solid and both side panels are interchangeable with the condition that the acrylic side panel moves along with the I/O Panel. I/O Panel can’t be installed where the solid panel will be on. The inner layout of the chassis is spacious. 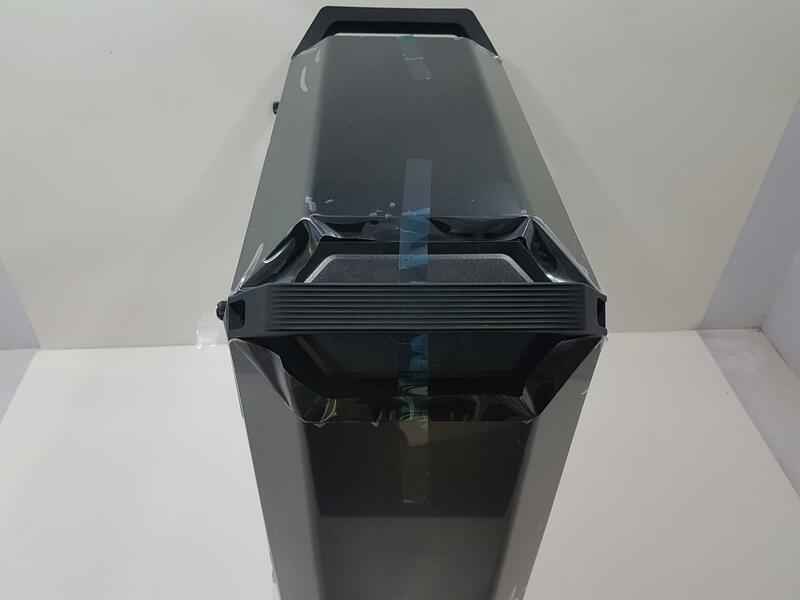 There is a large size CPU cutout for easy installation of the cooler. 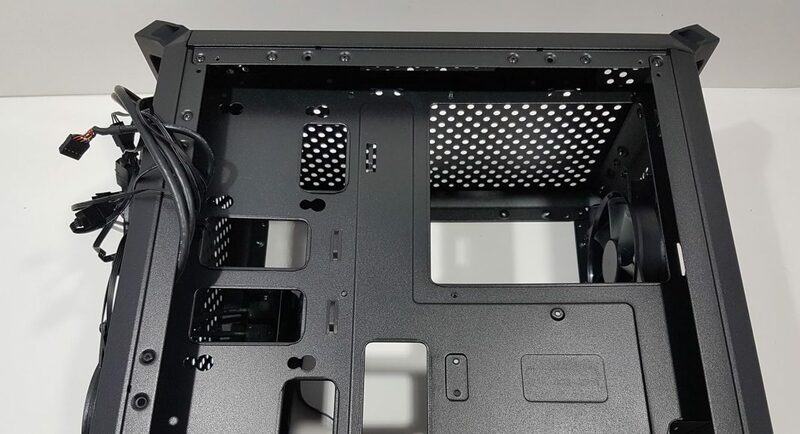 The three sides around the motherboard tray have openings which makes sense as I/O Panel can be installed on the top/bottom/right side of the chassis frame on each side, these openings would be needed for cables routing. I am in total love with this design approach particularly the cable management provision of this chassis. 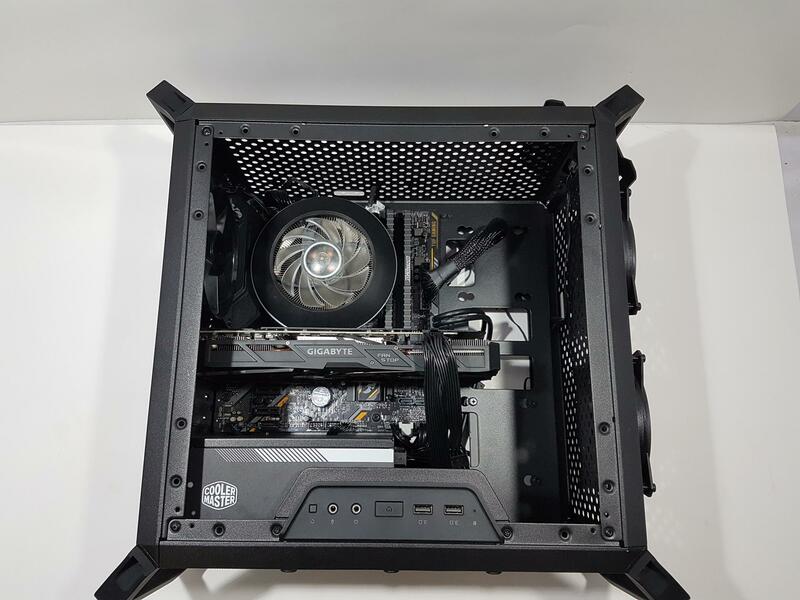 Cooler Master has done a marvelous job in this aspect. There are total four cutouts for cable routing with two in the vertical layout and two in horizontal layout. These don’t have rubber grommets. 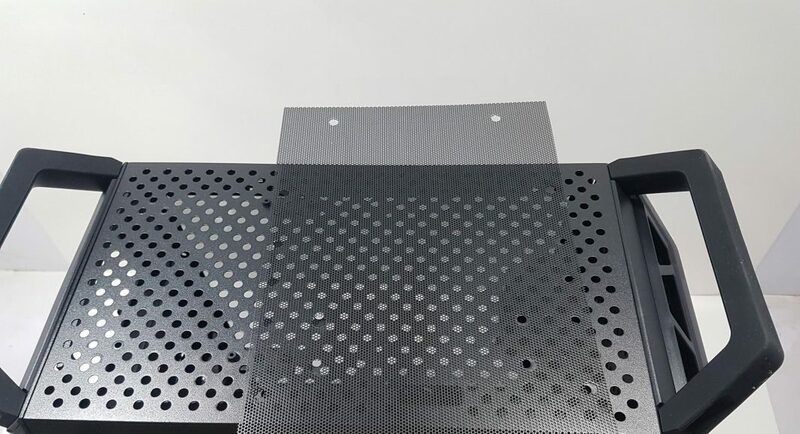 There are mounting holes above and below the horizontal cutouts. 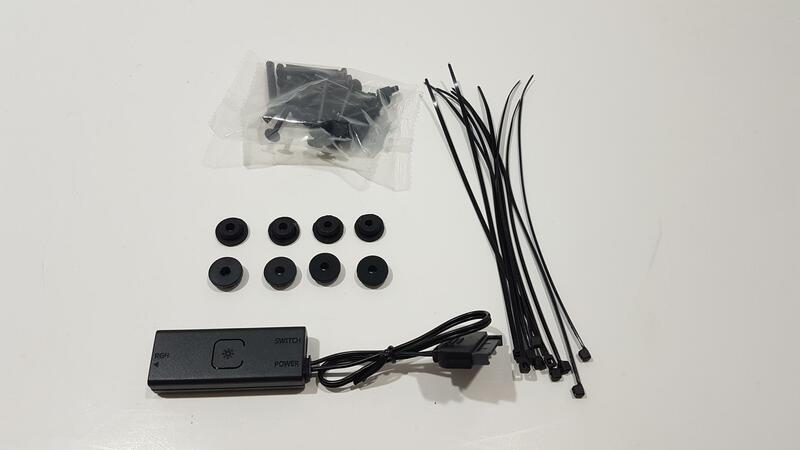 These are there to install the 2.5” SSDs for which Cooler Master has provided silicon mounts which are required to be installed on to the SSD using the screws and then these SSDs can simply be put on these mountings and slided in to lock them. Easy installation though the user would have to prep the SSDs. 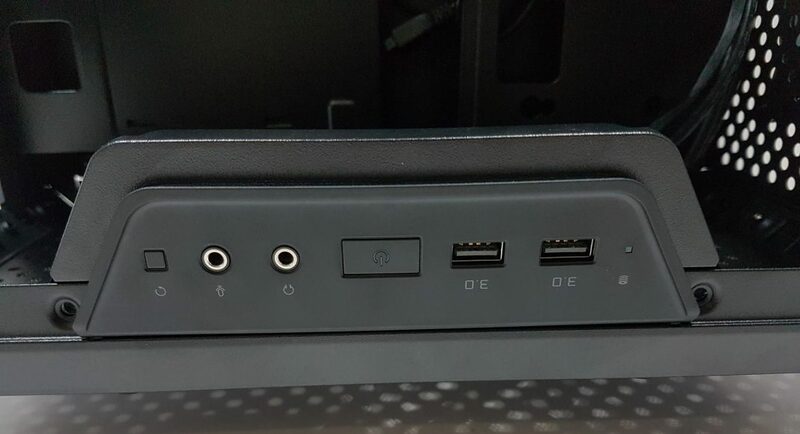 This chassis has 4 PCIe slot covers. These covers don’t have mesh and once removed these can’t be put back on. This is something which I personally don’t prefer. The PCIe covers are in line with the inner frame of the chassis which is not a standard implementation. There is an external bracket that is secured using a screw. 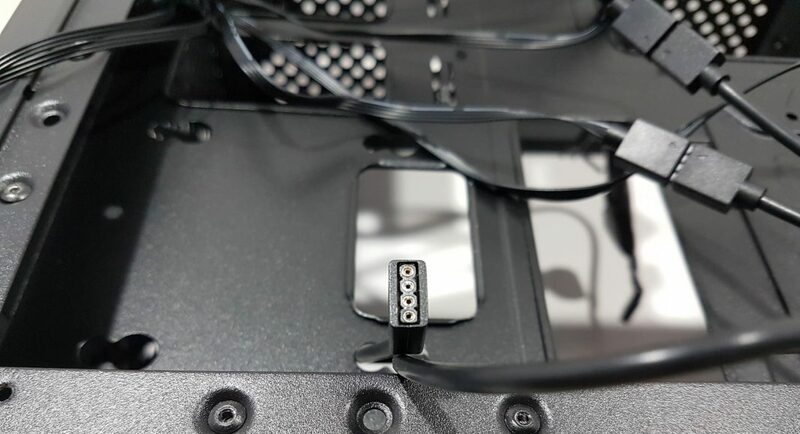 This bracket locks the PCIe slot covers. 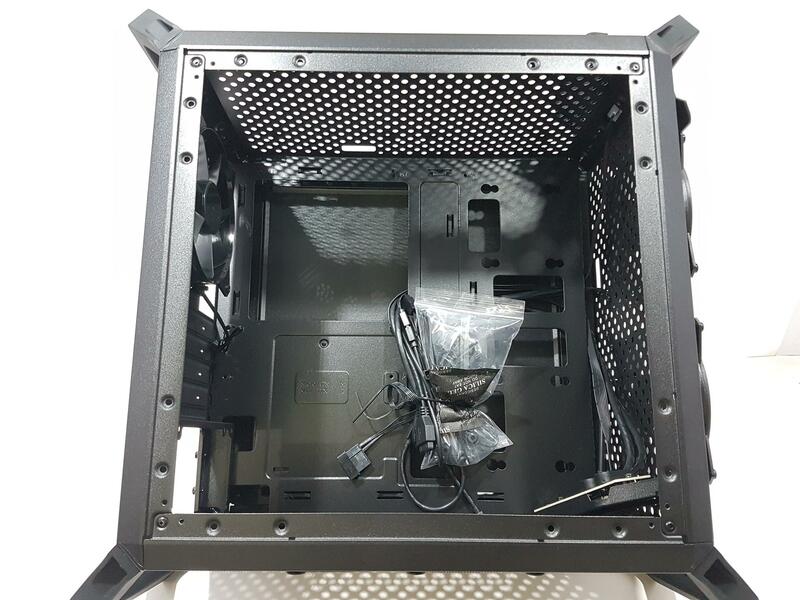 This chassis has PSU bracket which needs to be installed on to the PSU first before installing. 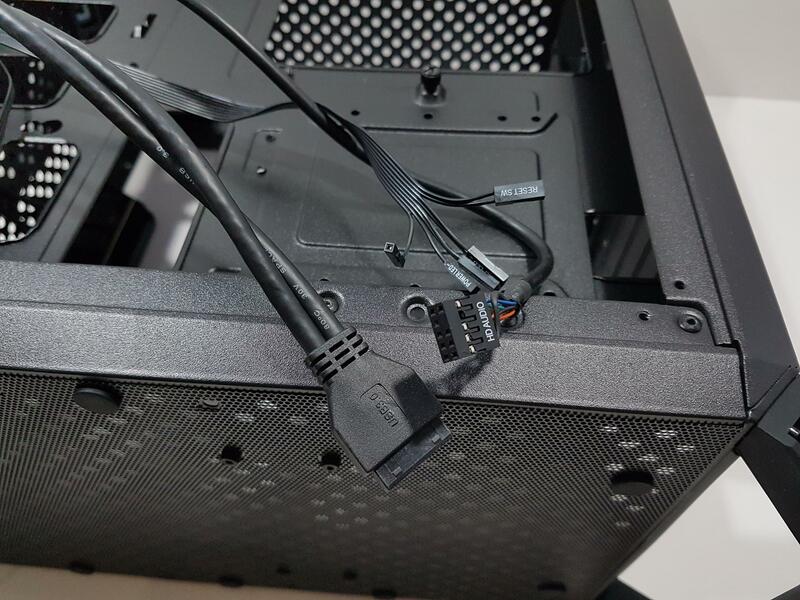 If you are thinking that it would be like sliding the PSU in from the rear using this approach then I have got a bad news as this is not the case. The edges on sides of this chassis are angular and not a straight line design. That would mean we can’t install the PSU in a typical manner. 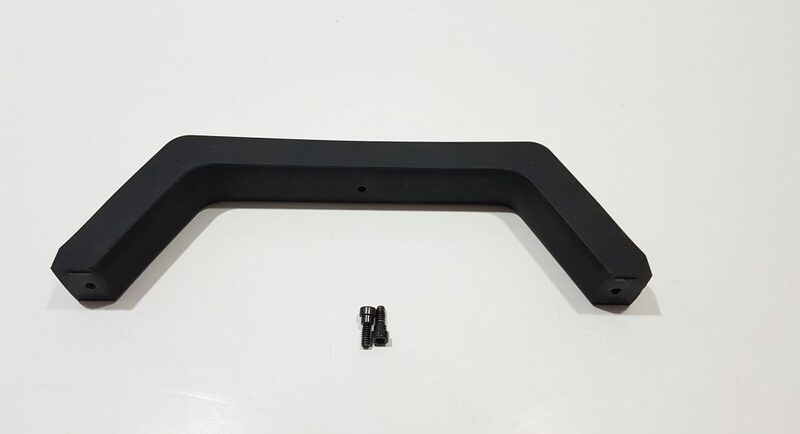 This bracket is there to cover up the angular design element. 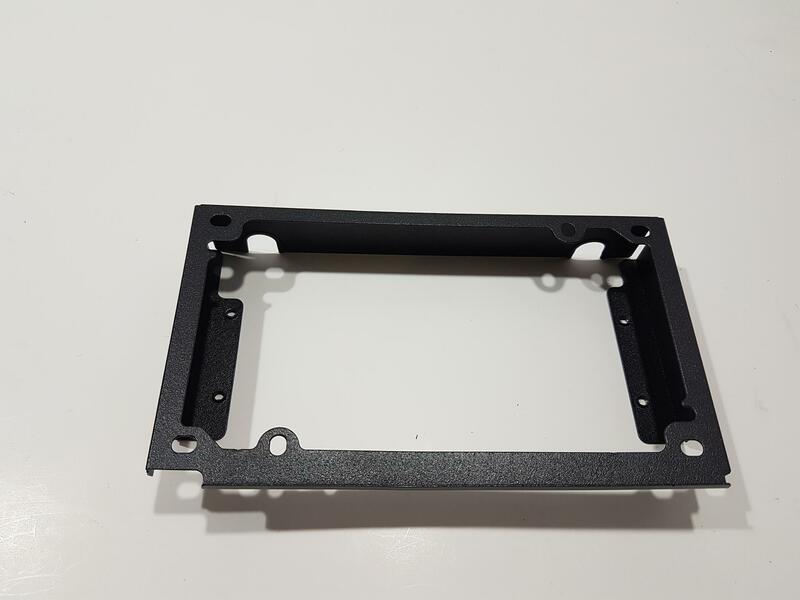 This bracket is secured with the chassis frame using 4 screws and it has standard ATX PSU mounting positions. 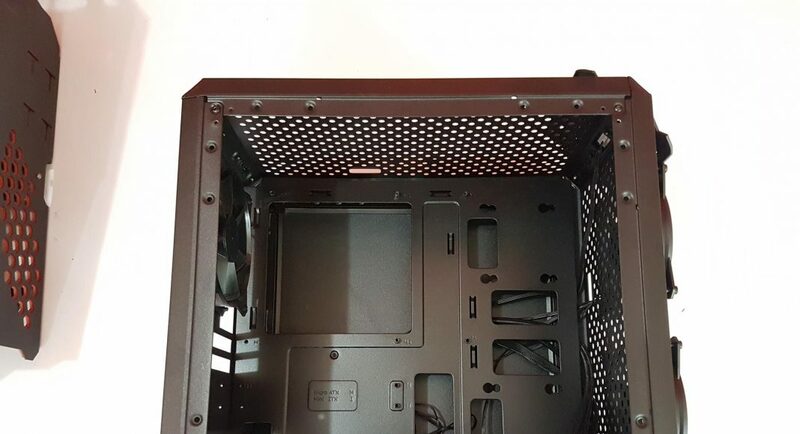 There is a single large size cutout at the bottom for the PSU cables routing. 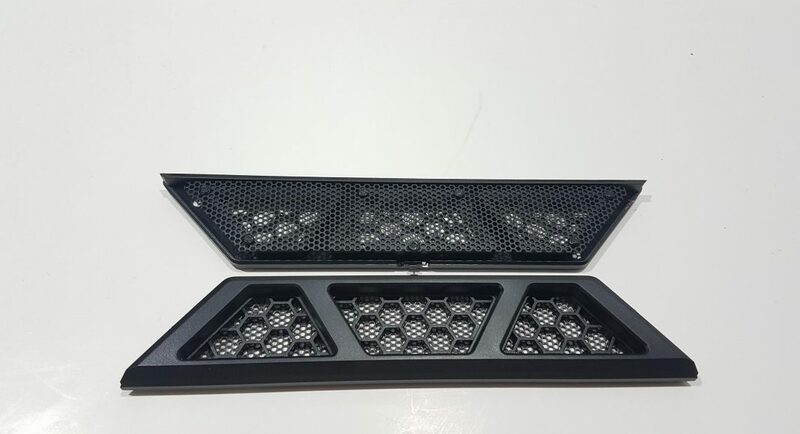 There are no dust filters on the top side or on the front side. 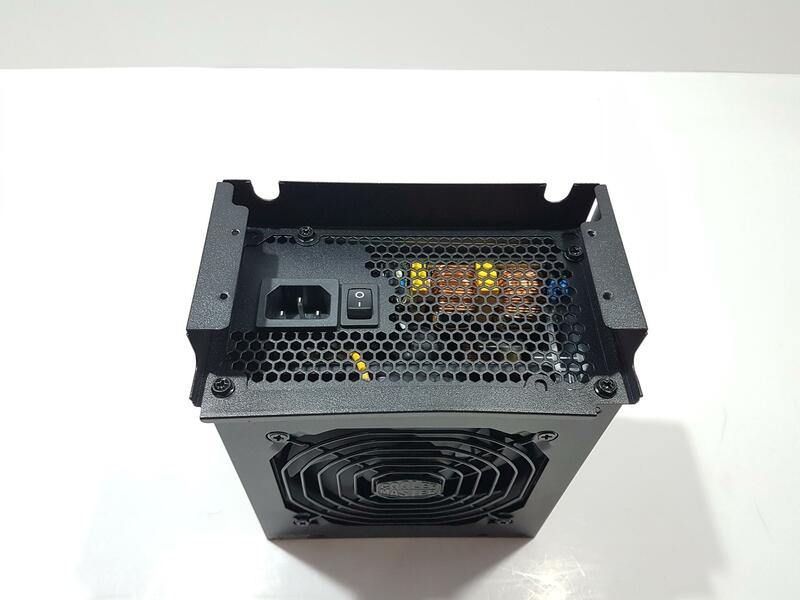 There is single large size dust filter at the bottom of the PSU on its exterior which is fixed using 10 rubber mounts. This could have been made a magnetic one instead. 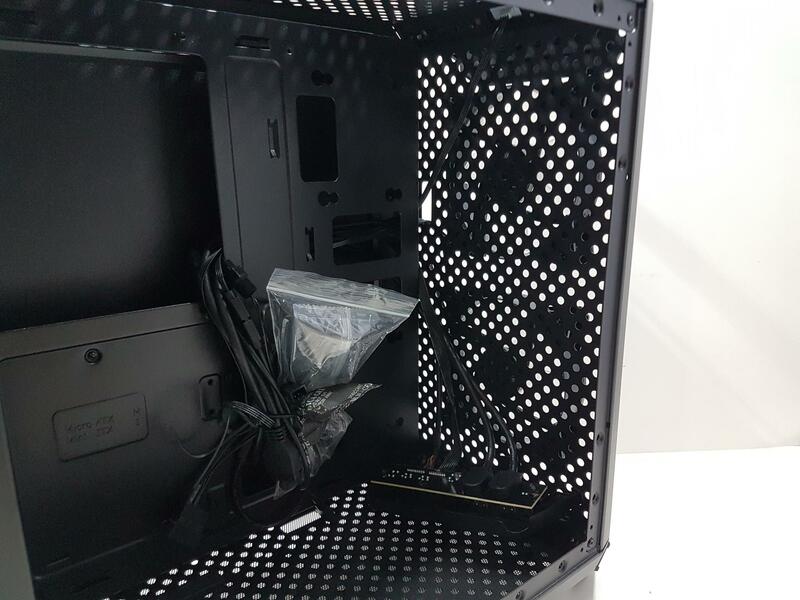 There is approximately 27mm of spacing for cable management on the backside which is plentiful. 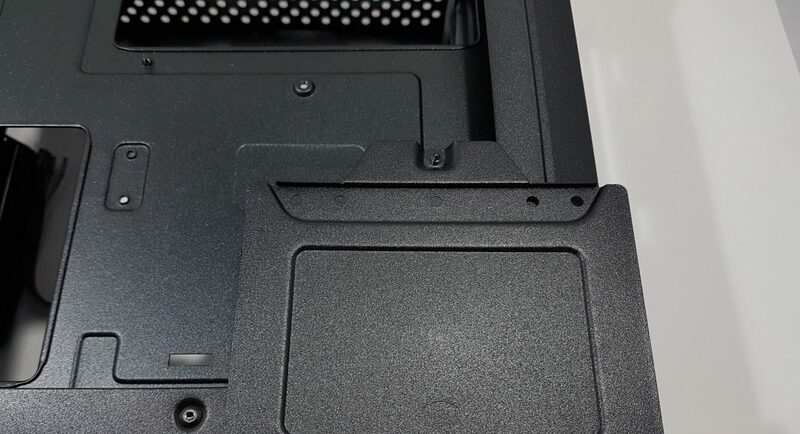 There is a bracket below the CPU cutout which is secured using a thumb screw. 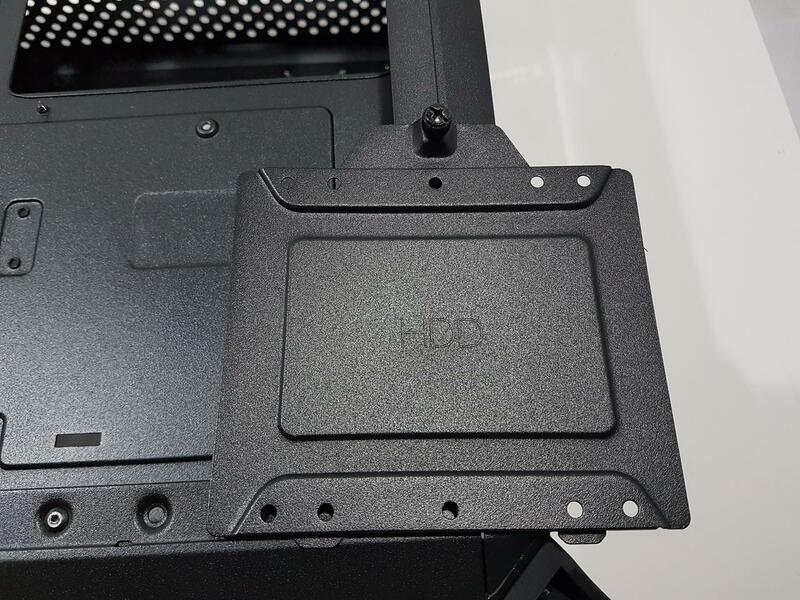 A 3.5” HDD is installed on this bracket and bracket is then installed to the chassis. The design of the top and front panels is one heck of its kind. Again we see that panels run edge-to-edge. 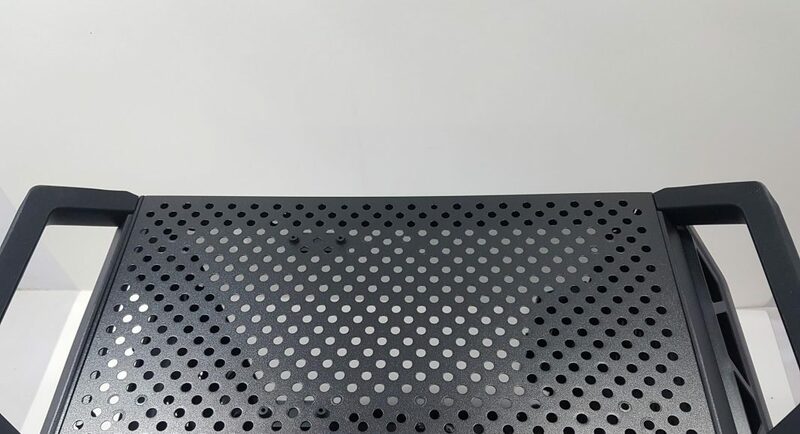 The central portion of these panels has a raised surface and there is curve design on the top and at the bottom. Both panels are interchangeable. The top side where these panels come to intersection has another beautiful design element. 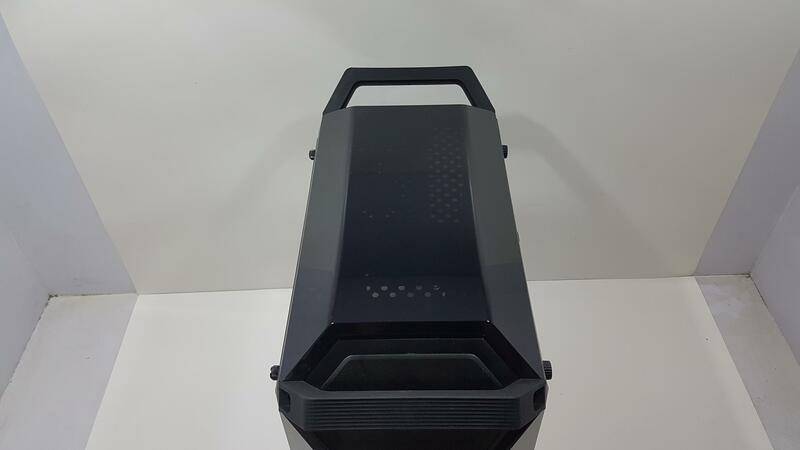 There is RGB LED implementation in this area which has a hexagon shaped plastic cover. 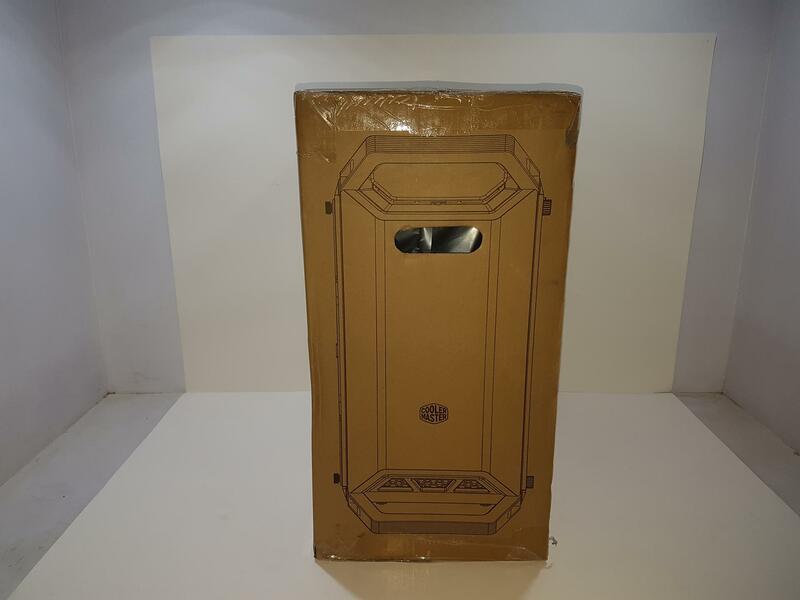 This cover sits in an angular shape to create symmetry with the flow of the top and front panels. There are 10 RGB LEDs on the white PCB. They are using +12V GRB pin format and are not addressable. The top cover has a dust filter underneath it as there are grooves on the plastic frame housing the LEDs PCB. 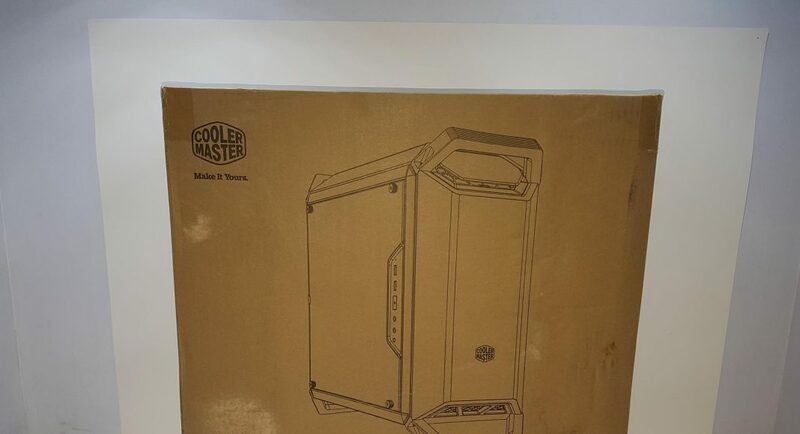 There is a Cooler Master brand logo in white color on the front panel only. Where is the air intake/exhaust? This is where my complaint is with Cooler Master. 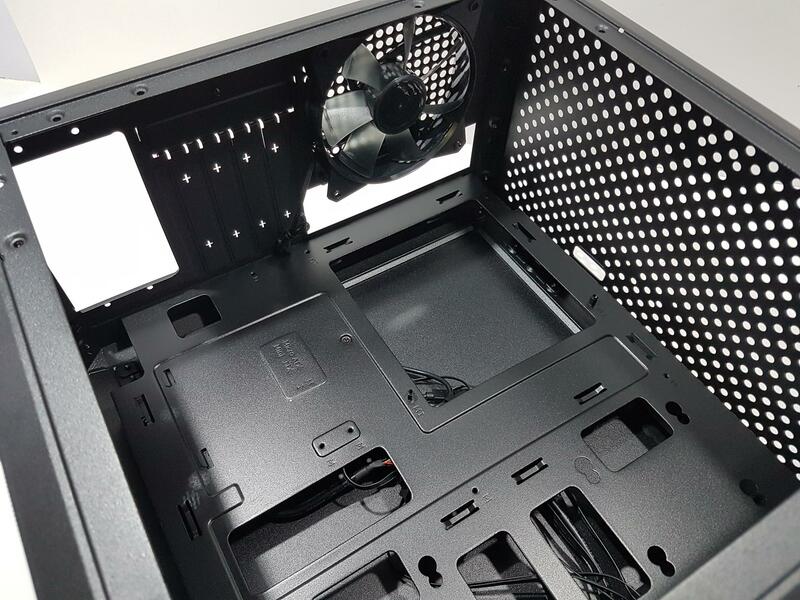 There is a removable bracket at the bottom of the front panel with dust filter. This is the only area of air intake from the front side. 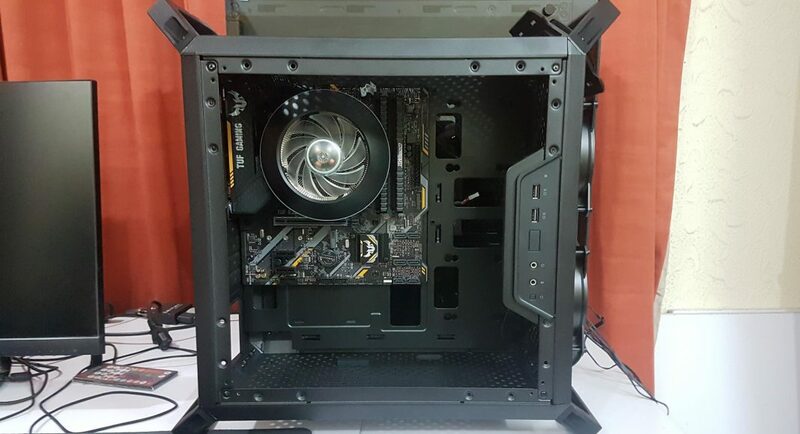 This approach coupled with the narrow gap between the front fans and front panel is choking the fans hence affecting the thermal performance. Similarly, the top panel has an identical layout with the removable bracket being on the rear end. 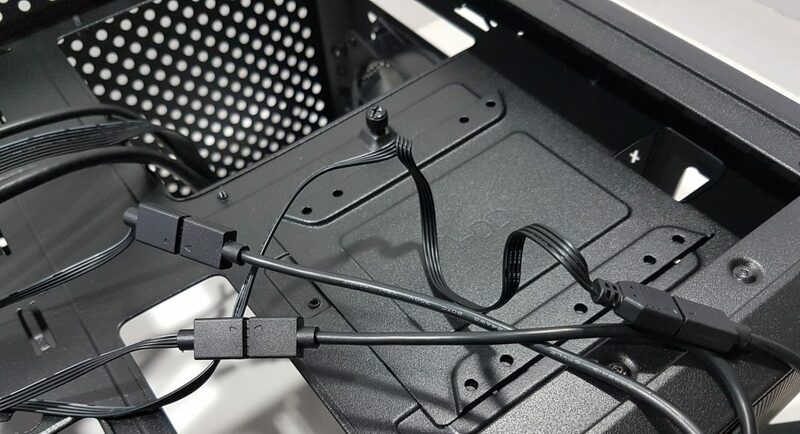 Cooler Master has included 3-way RGB splitter cable to synchronize all three RGB zones on this chassis. There is also a male-to-male 4-pin adapter. 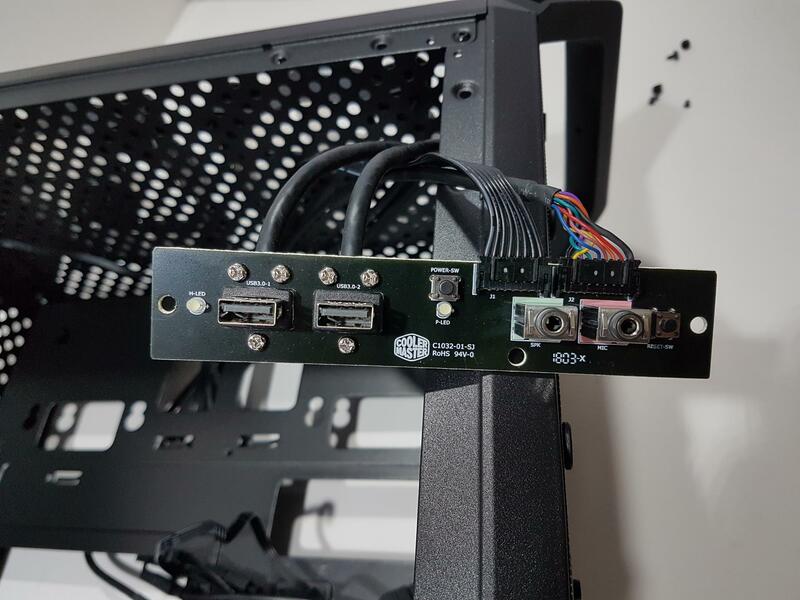 This solution is fully compatible with the majority of the motherboard manufacturers’ on-board lighting headers (non-addressable). 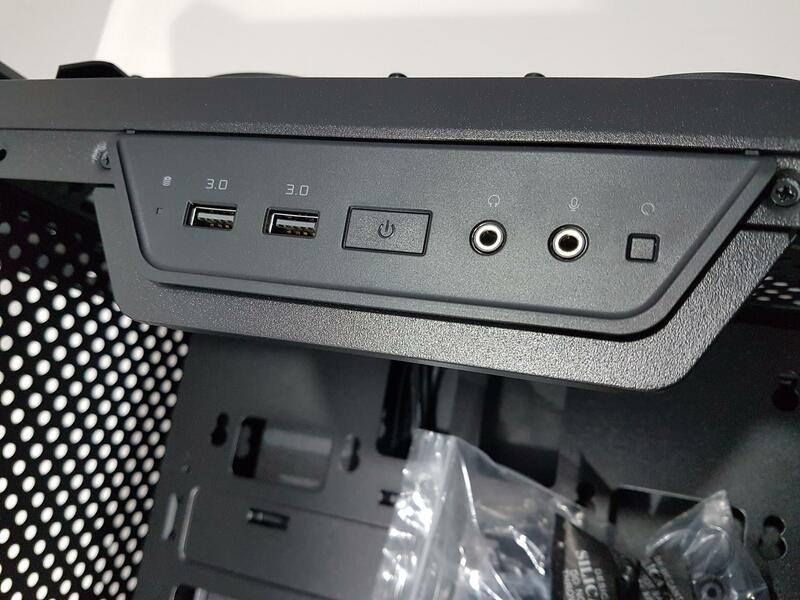 Cooler Master has not forgotten the users without such motherboard as there is an RGB controller bundled which can be connected to the Reset button of the I/O Panel. This would allow the user to control the lighting modes but at the cost of the lost reset functionality. 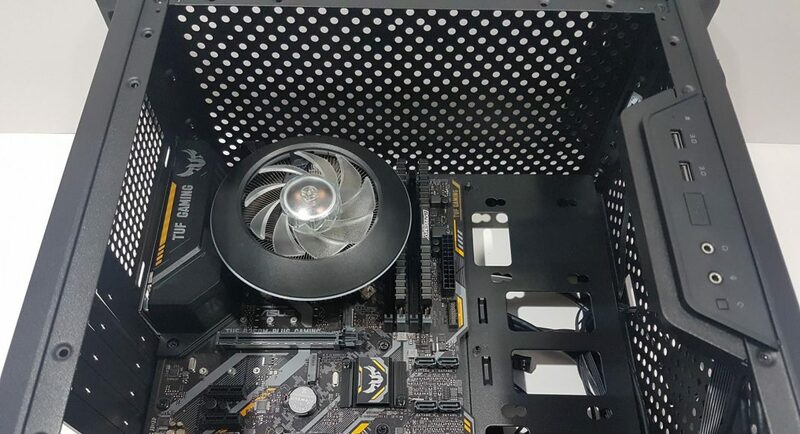 The front fans are powered using a two pin Molex connector/fan connector. 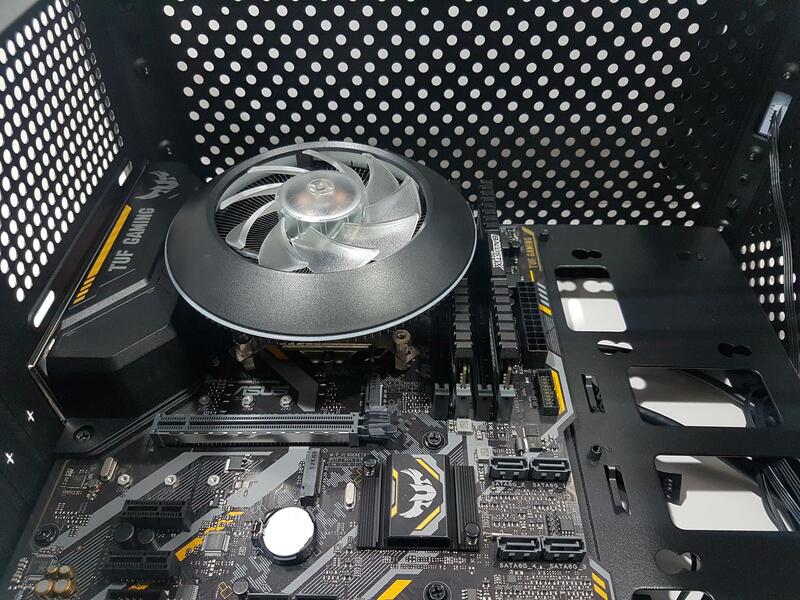 The rear fan has 3-pin connector and it was hitting the max of 1000 RPM at full speed despite its rated speed of up to 1200 RPM. Let’s talk about the thermal performance of this chassis which is unfortunately very disappointing. 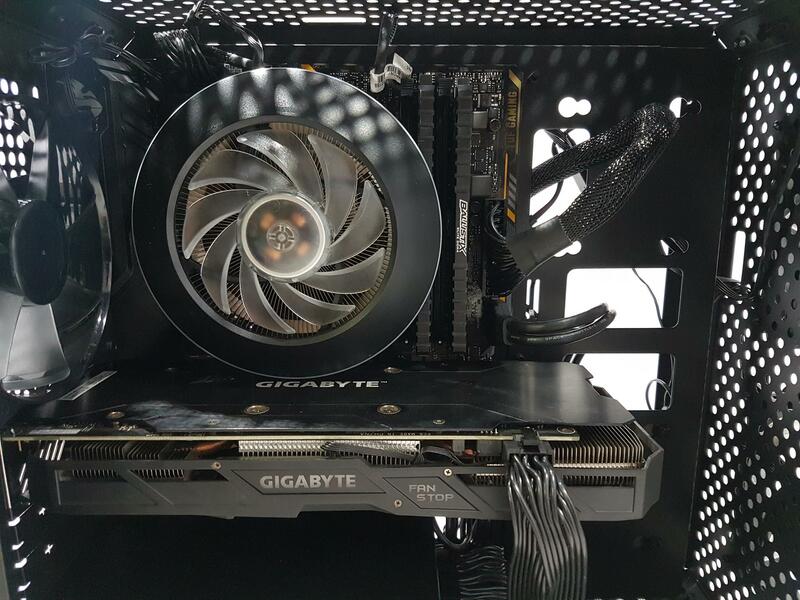 I have used Intel i7 8700k and Gigabyte GTX 1060 6G in the test build. Keep in mind that we are talking about a delided chip. The CPU was set to run at 4.7GHz on all the cores as I could not overclock the chip due to B360 chipset. Graphics card was tested on the stock clocks as well. CPU was stress tested using AIDA64 for 30 minutes and Graphics card was stress tested using Furmark for 30 minutes. The first set of tests was run without the top and front panels. The second set was run with the panels on. 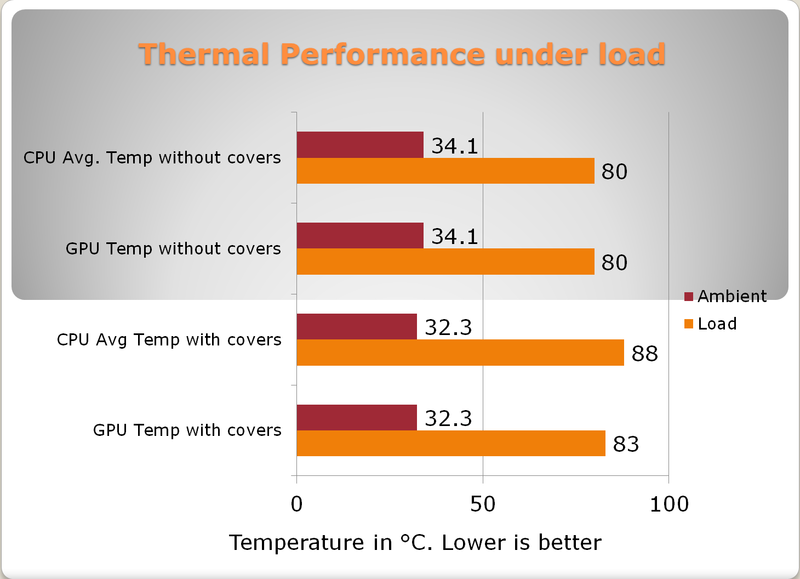 There is a difference of 8°C on the CPU between both runs which is massive. 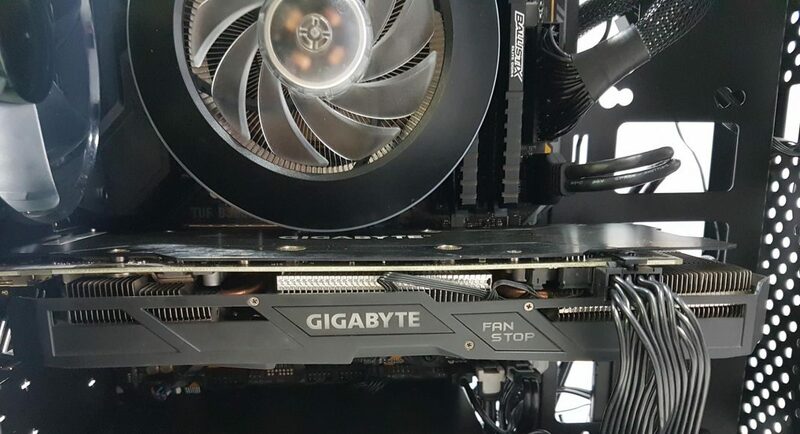 There is a difference of 3°C on the graphics card between both runs which may seem marginal but this card has never seen temperatures above 71°C. 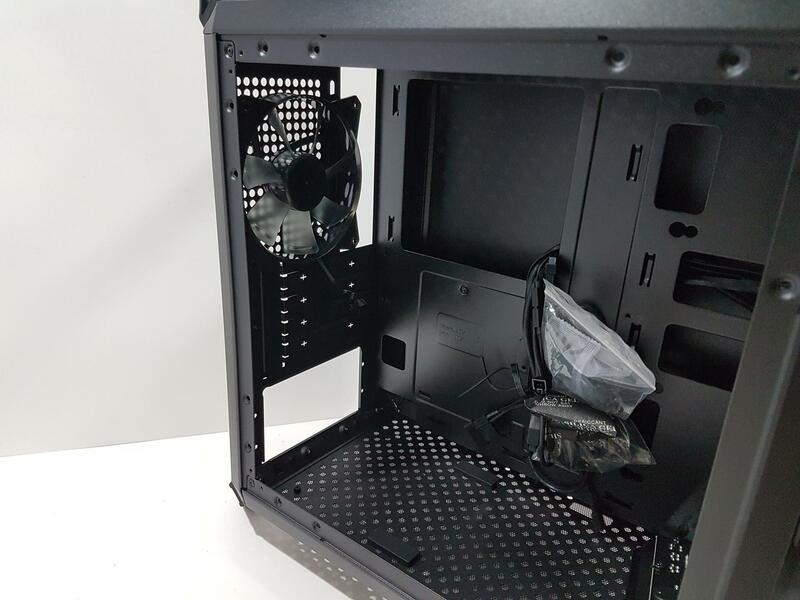 Even without the panel, the graphics card was hitting 80°C which is like 9°C above the 71°C temperature as I have tested in the Phanteks Evolv ATX. 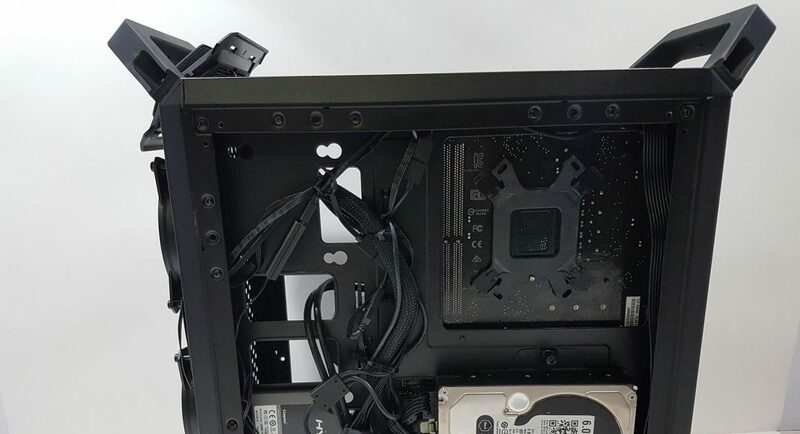 It is evident that this chassis lacks proper airflow. 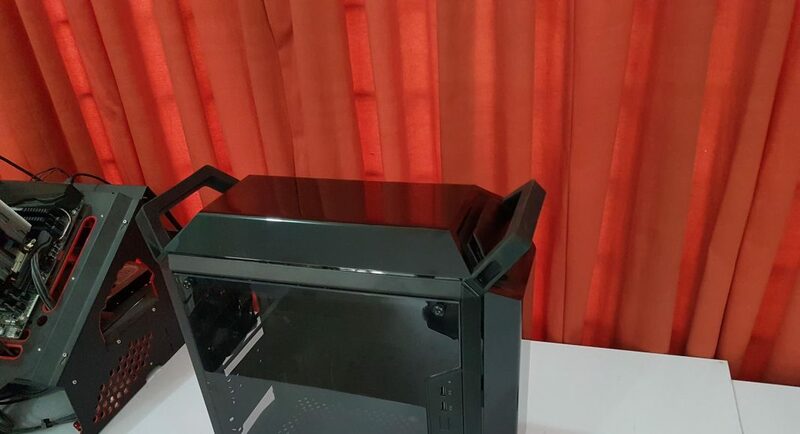 This chassis is rated at PKR 8000 at Shing. 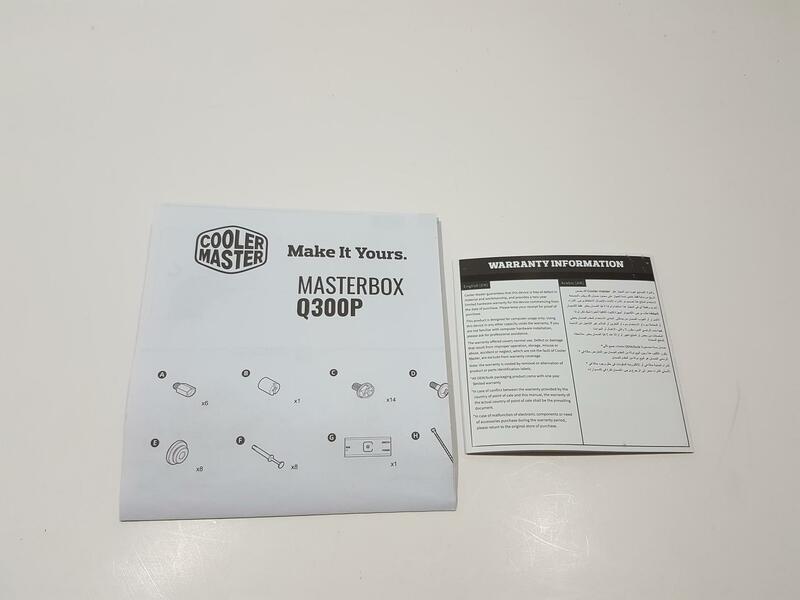 I am thankful to the Cooler Master for giving me the opportunity to review the MasterBox Q300P. 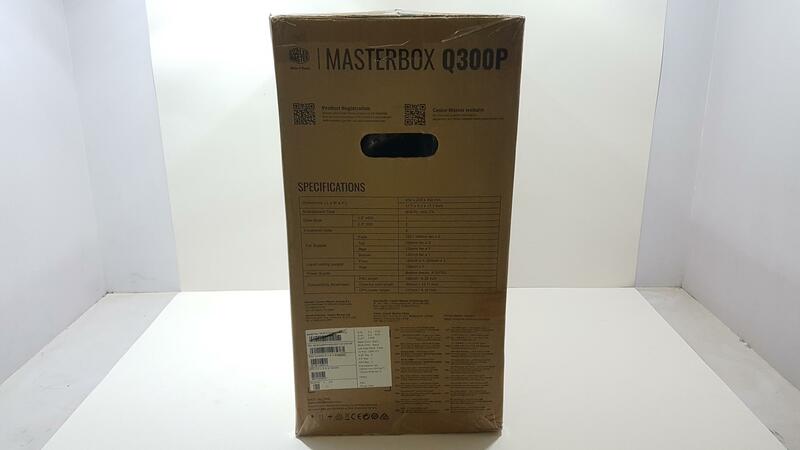 Well, what could be said about the Cooler Master MasterBox Q300P? I love this chassis would be an understatement. This chassis has killer looks with the design element that makes it stand out of the competition. 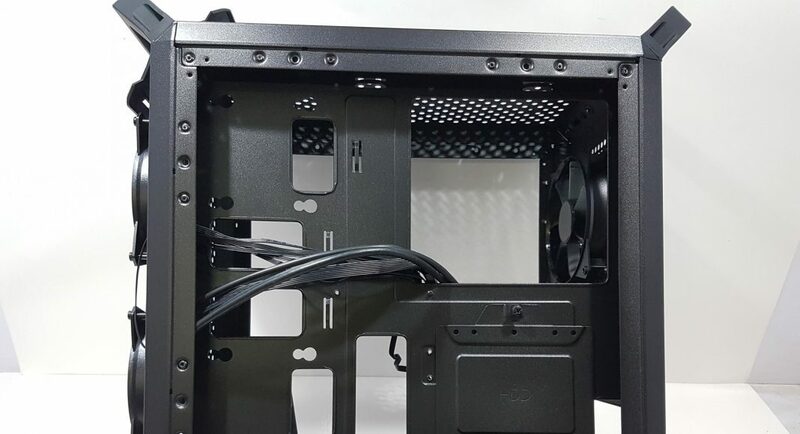 Good cable management provision, modular I/O Panel, provision of ATX PSU, RGB Goodness with dedicated RGB Controller and loads of potential for some good build this could have been the Chassis of the year if only Cooler Master has provided enough airflow and powerful fans to ensure optimal cooling performance!